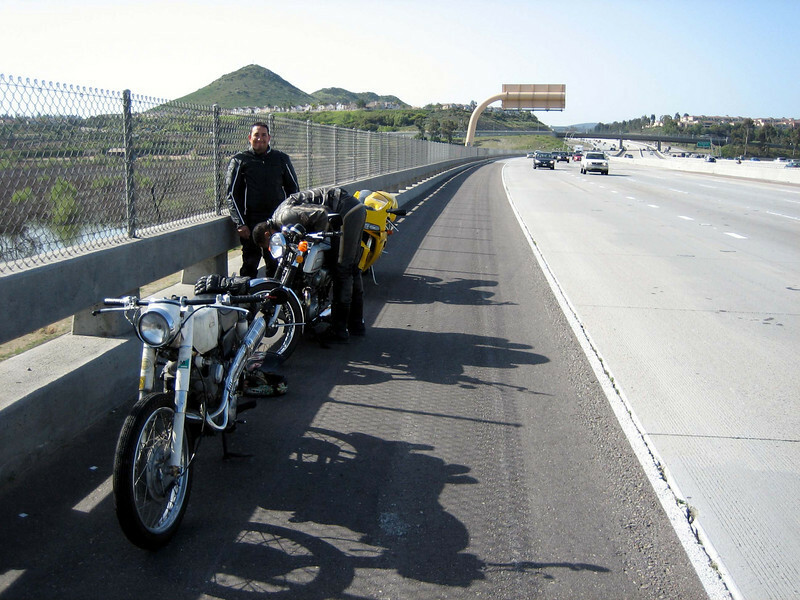 From San Diego, I headed east into Arizona so that I could cross at a small border crossing heading into mainland Mexico. 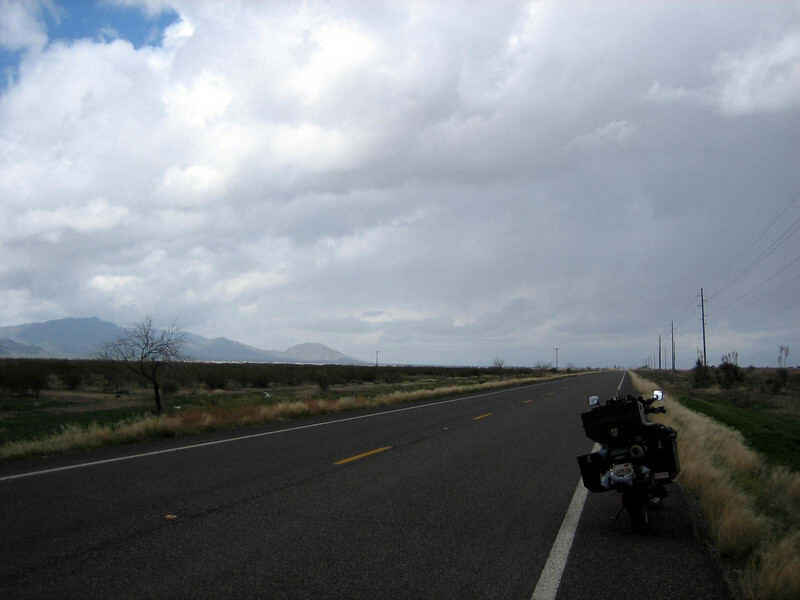 The ride was pleasant, going up and over some mountains and getting to the Sonoran Desert as I neared the small town of Ajo, Arizona. It was 40 miles to the border from here and I would be staying with Gayle from CouchSurfing. 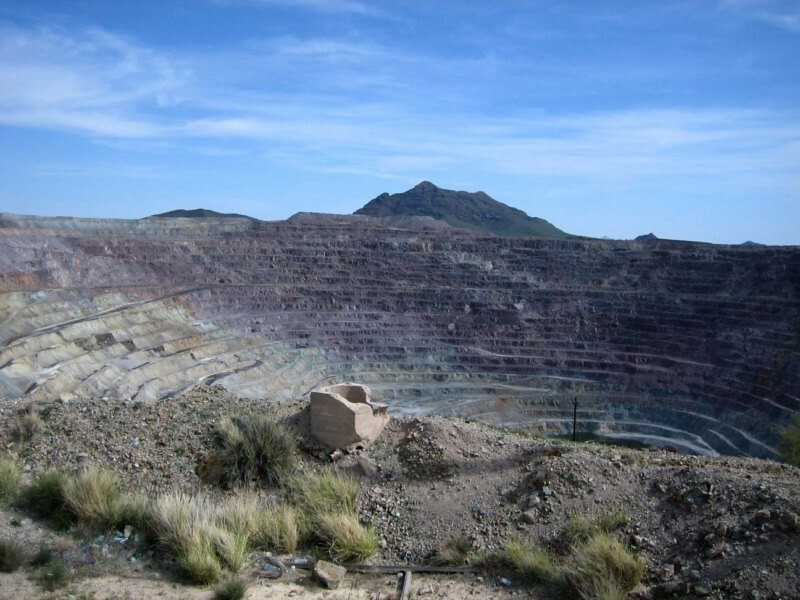 I was thinking this would just be an overnight stop and then head to the border but when Gayle found out I was studying sustainable development, she invited me to stay an extra day to see some sustainability initiatives in Ajo, plus she really wanted to show off her town. I was all game for it. 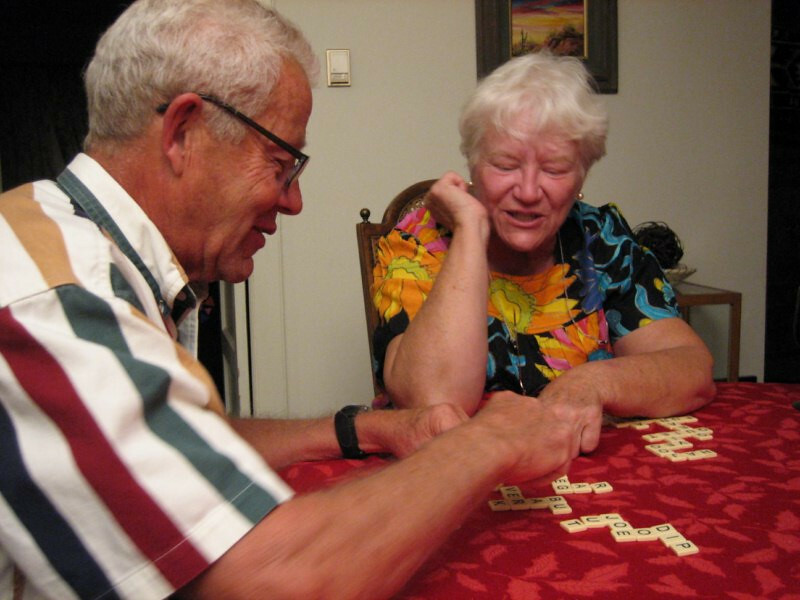 Gayle and her husband, Don showing me how to play the game of Bananagram, a variant of Scrabble. She’s quite the scrabble champ and competes successfully. 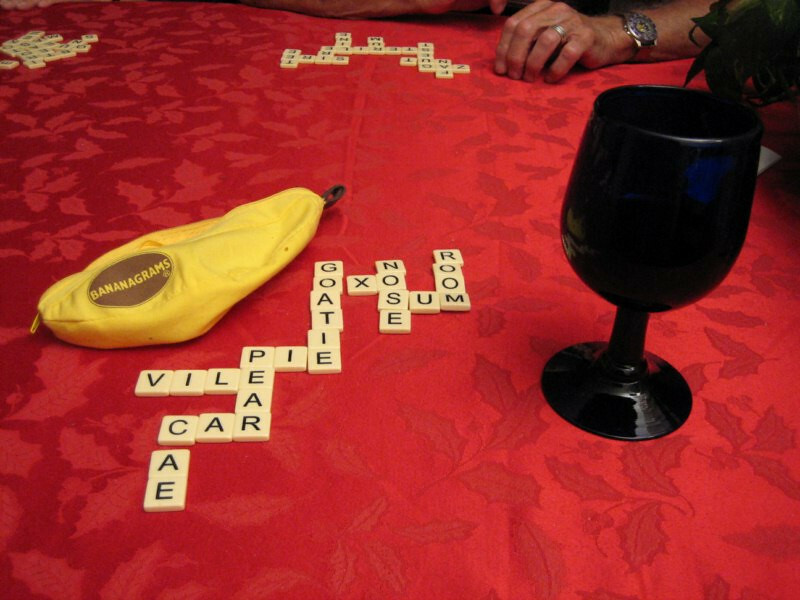 …and then it’s a race to make a crossword puzzle out of all the letters. 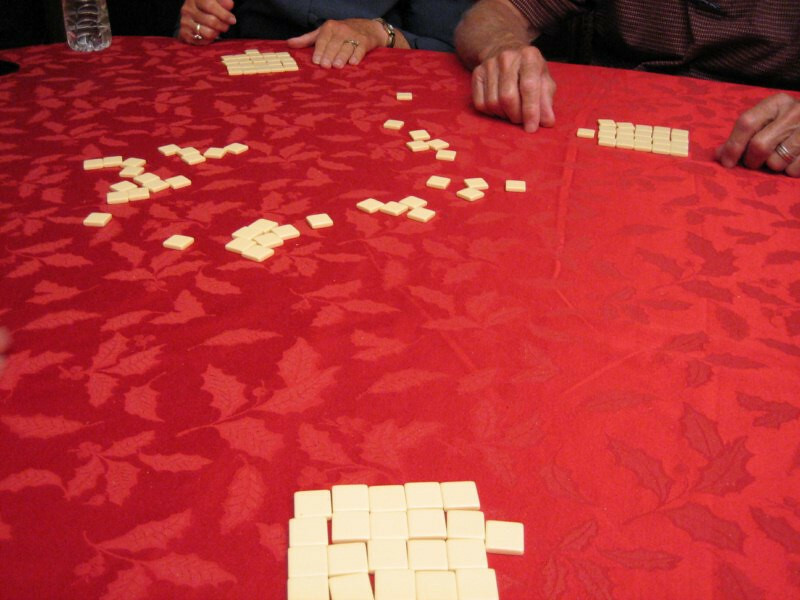 “Oxo” is a legal scrabble word, meaning something’s that oxygenated. You learn something new everyday. 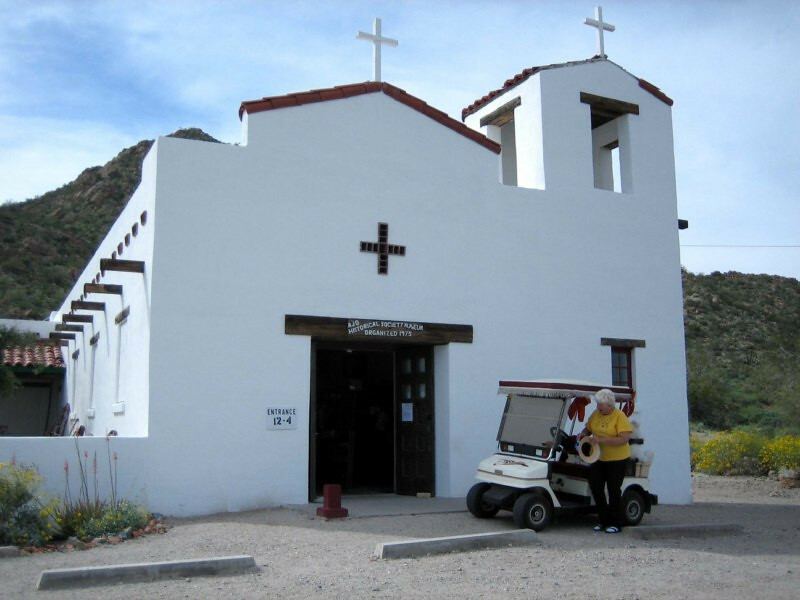 The next day Gayle took me around the sites of Ajo. 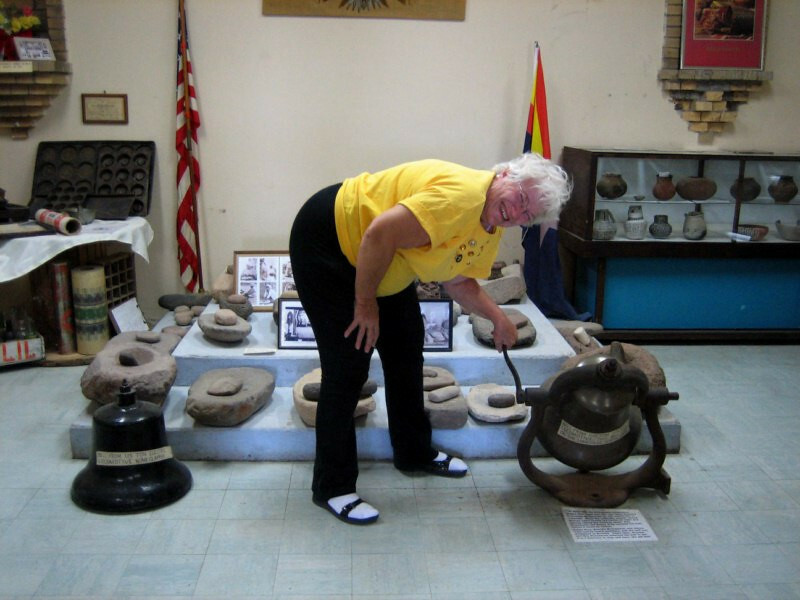 This is at the local museum, where her and Don have volunteered most of their time. 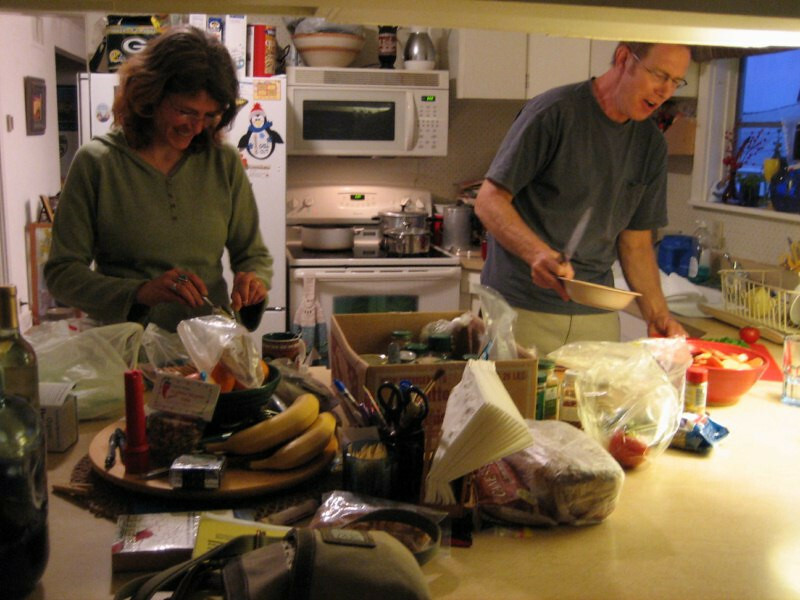 They’re originally from Superior, Wisconsin but after spending a few years teaching in Abu Dhabi, UAE and being entranced by the desert, they decided to move down to the southwest. 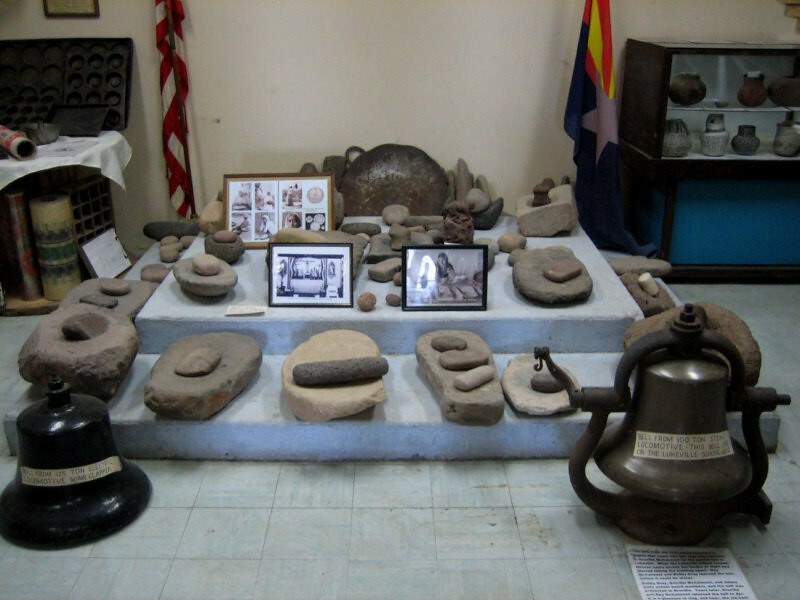 Artifacts from the local Tohono O’odham Native American nation. And since she’s a board member of the museum, she gets to ring the old steam train bell. She was just bubbling with so much energy. 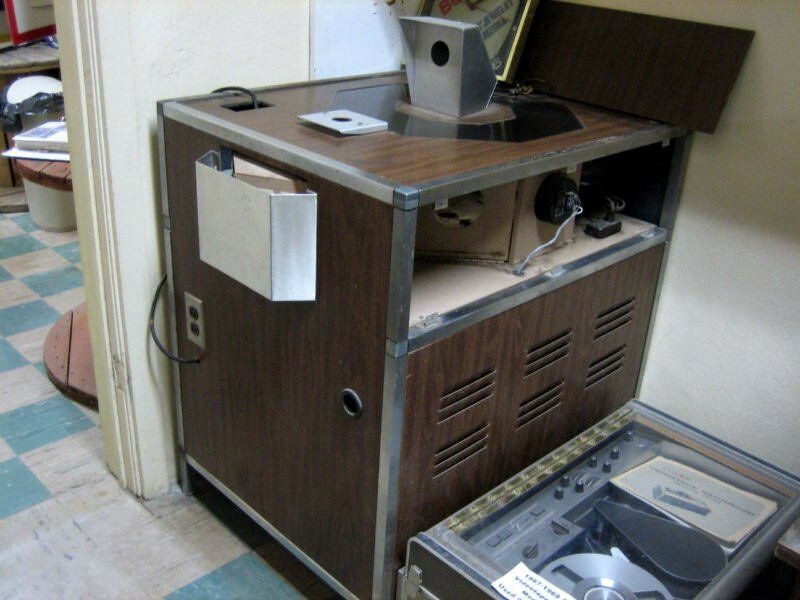 A rudimentary TV broadcast system, I think it worked similar to an overhead projector but sending the images over the air. 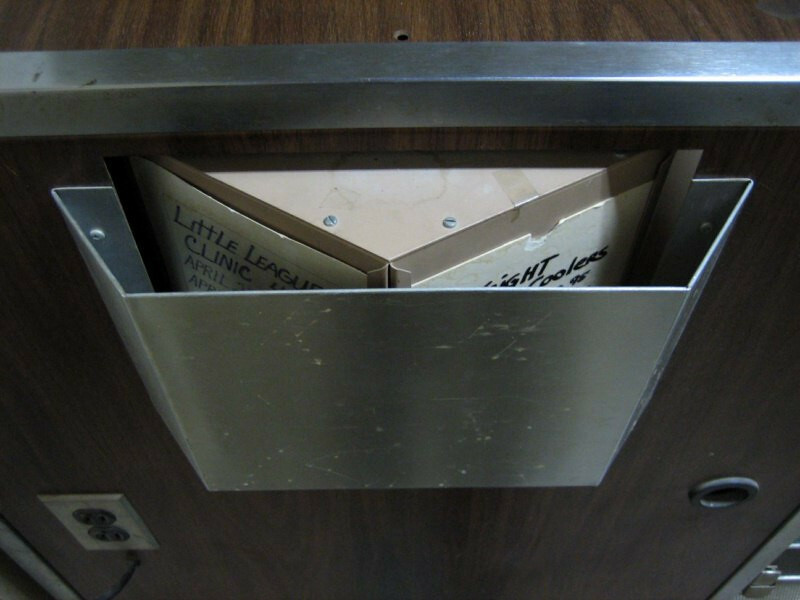 Hand-written advertisements that were broadcast. Gayle said it was the third such unit in the US at the time (not sure which year exactly, maybe early 1900’s). 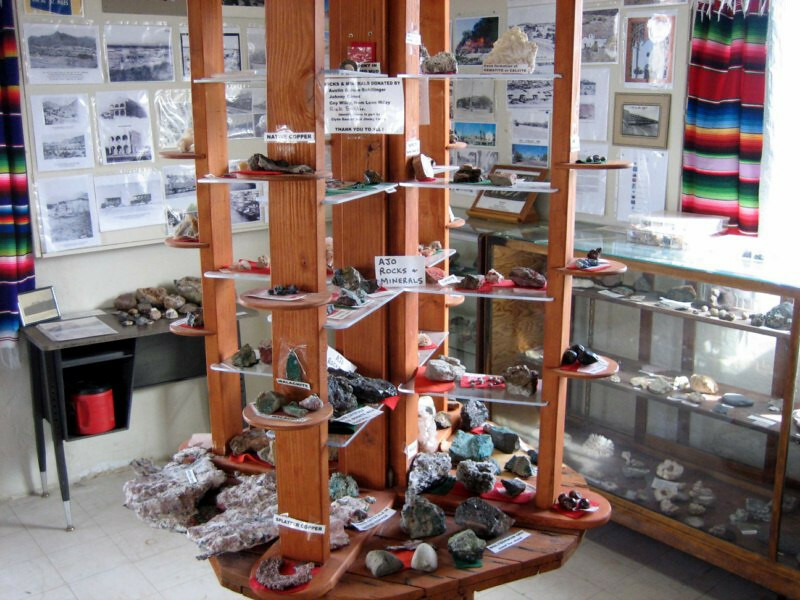 Ajo came about due to copper mining and was a prosperous town in the 20th century, but since the mine closed in the 1990’s, things have slowed down. 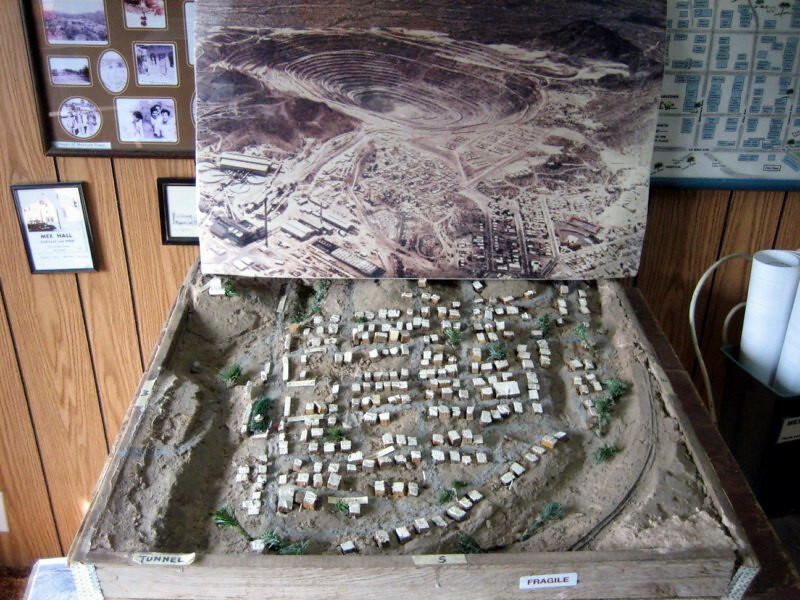 This is a model of the living quarters of the mine workers. Gayle was quite proud of this display she put together from old telephone wire spools. 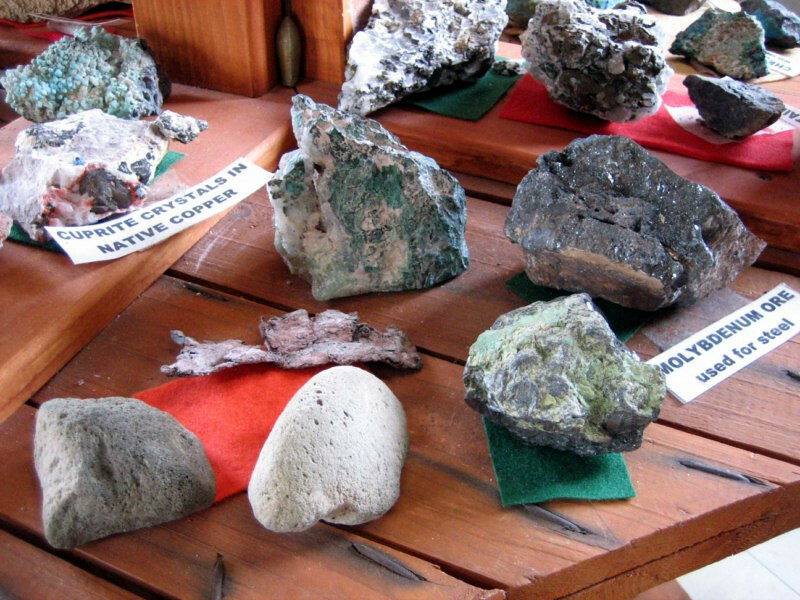 Displaying rocks and ore from the area. 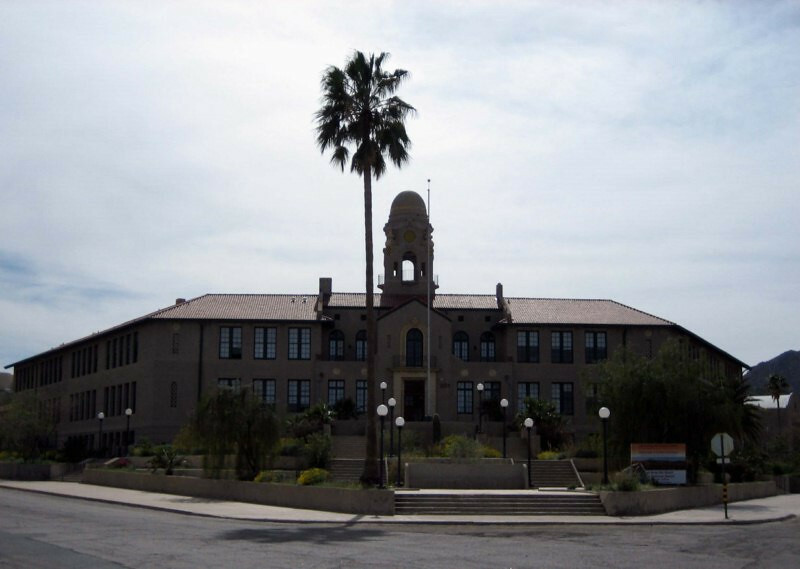 The Curley School built by the mine in 1919. 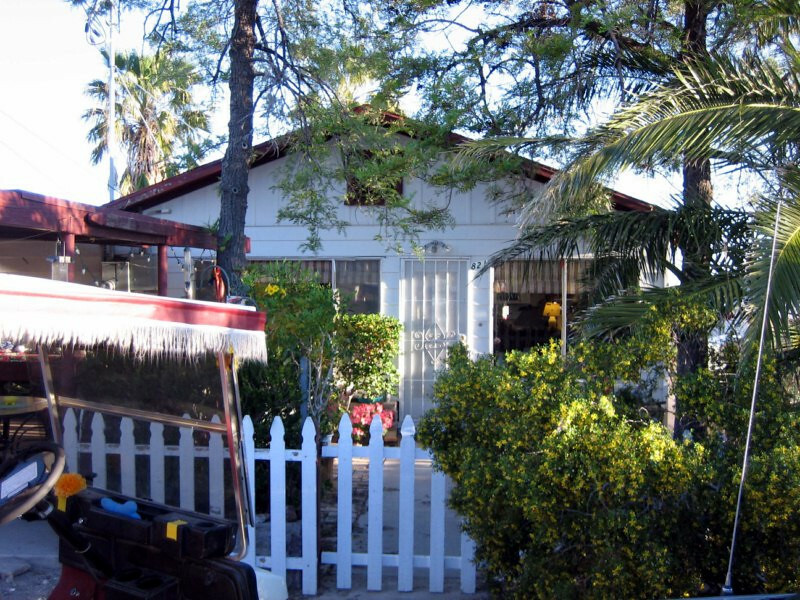 It’s now been converted to living quarters for artists and teachers. 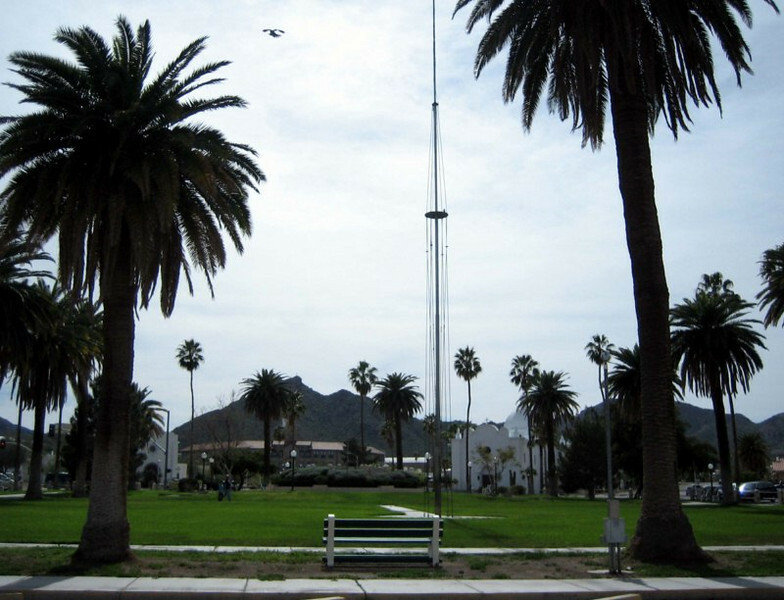 The main plaza in Ajo. 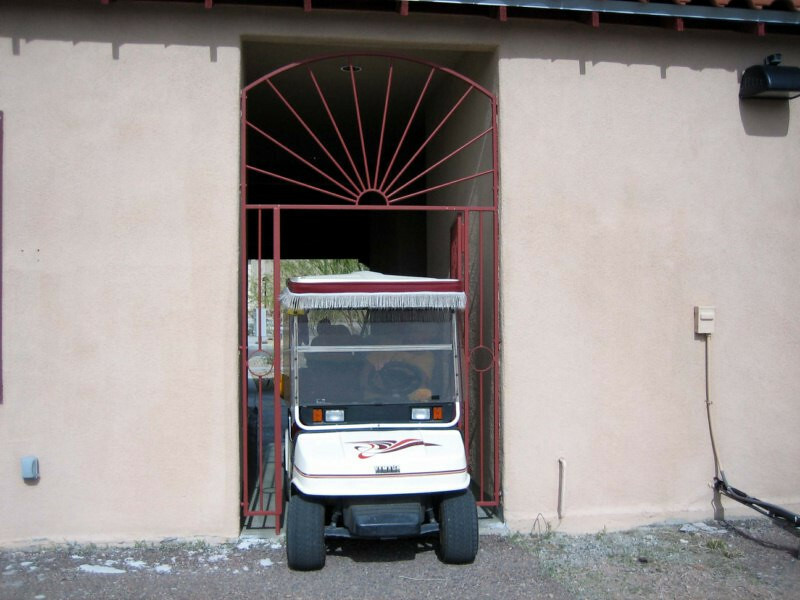 Gayle drove her golf cart all around town, on side walks and anywhere she could squeeze through. She had quite the lead foot, as well 🙂 She really wanted a scooter but Don settled on letting her have this golf cart. Fun way to get around town. 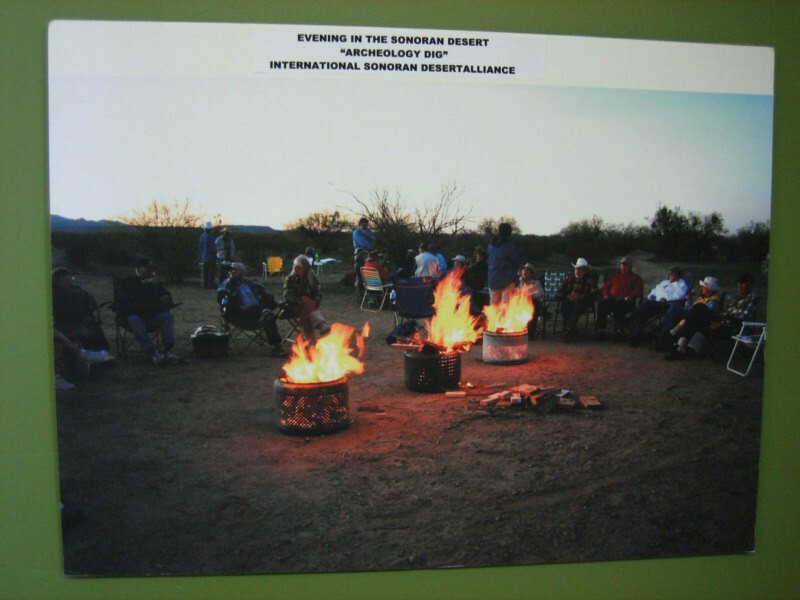 Next stop was ISDA – the International Sonoran Desert Alliance, an organization aiming to foster stronger ties among all the various groups of people living in the Sonoran Desert in the US and over in Mexico, as it’s considered one eco-region. 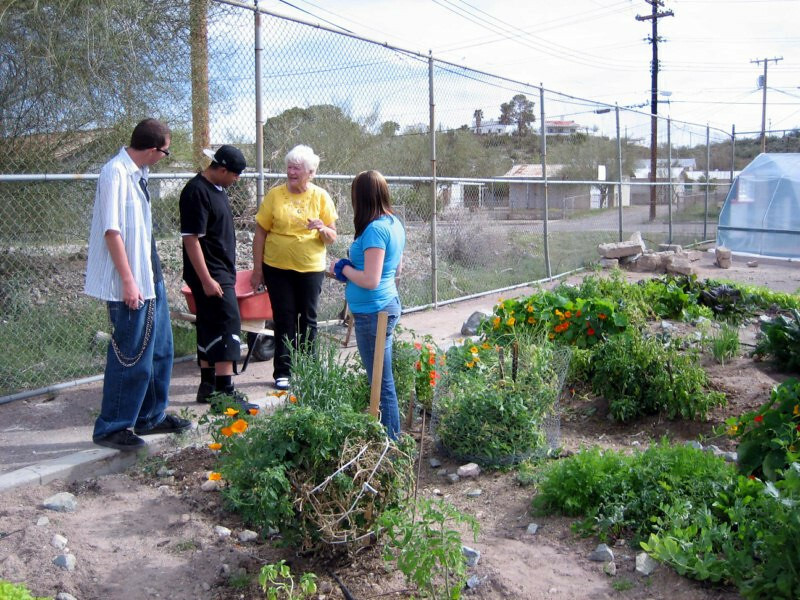 They’re also trying to get people to better understand the desert and learn how to thrive here. 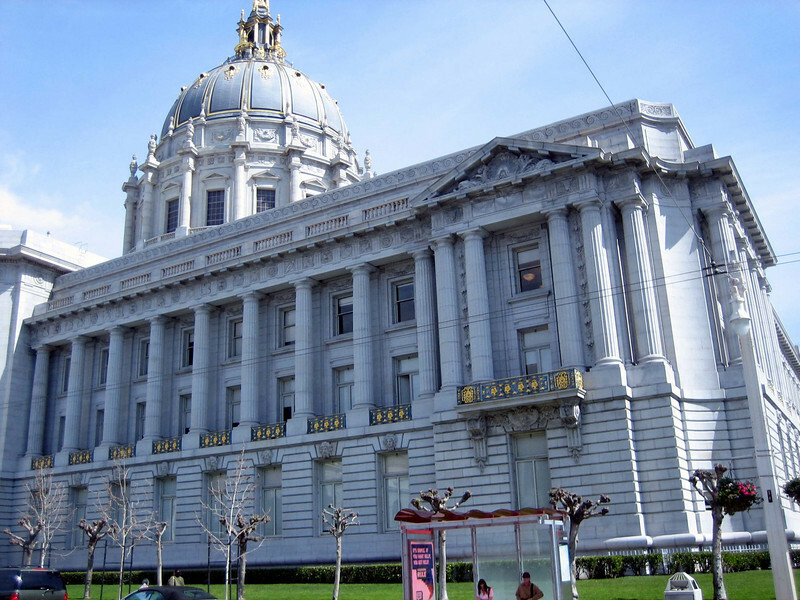 The local ISDA office is supporting a GED program, where kids who’ve dropped out of school can try and get their high school diploma so that they can carry on with their lives. 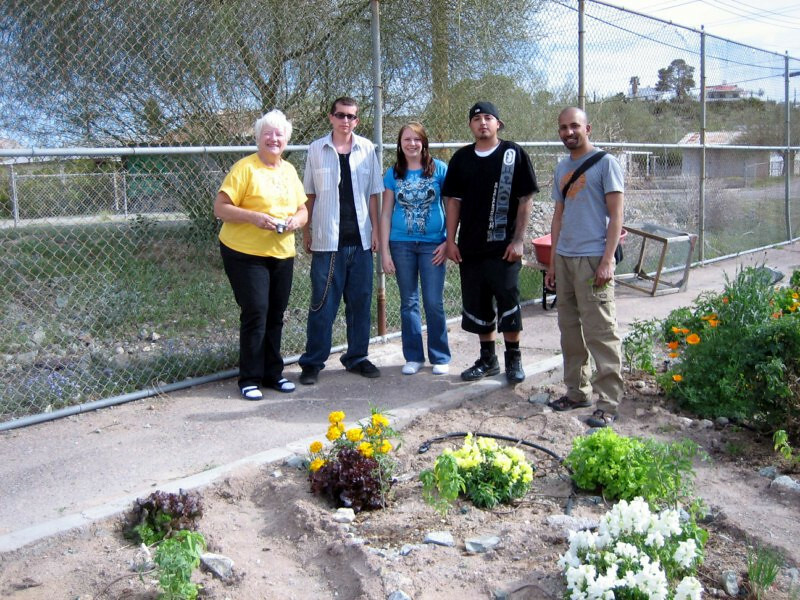 One of Gayle’s friends, Nina started this gardening project to encourage the kids to connect with nature and learn some responsibility by growing plants and taking care of them as they produced vegetables. The kids who showed me around their garden and pointed out what was growing on their little plots. They had tomatoes, carrots, lettuce and various flowering plants. Nina instructing some of the other kids. 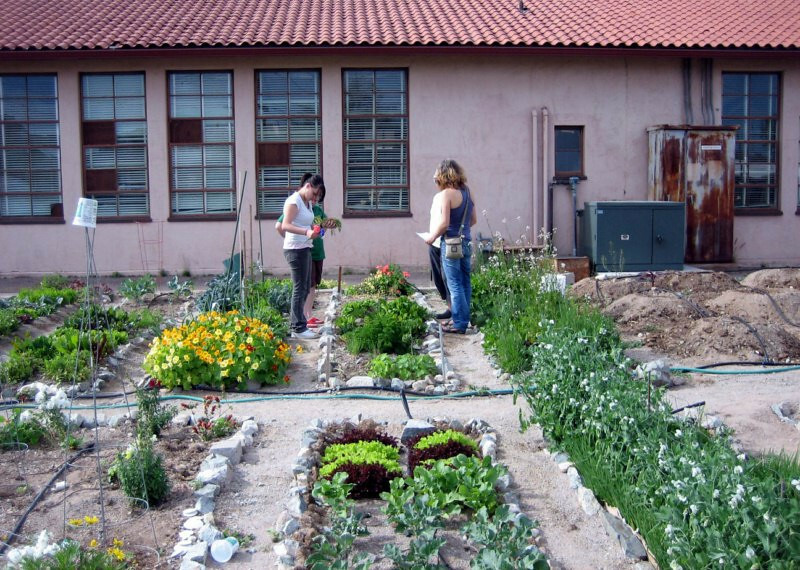 She’s worked hard to make vegetables grow in this dry, nutrient-lacking soil. 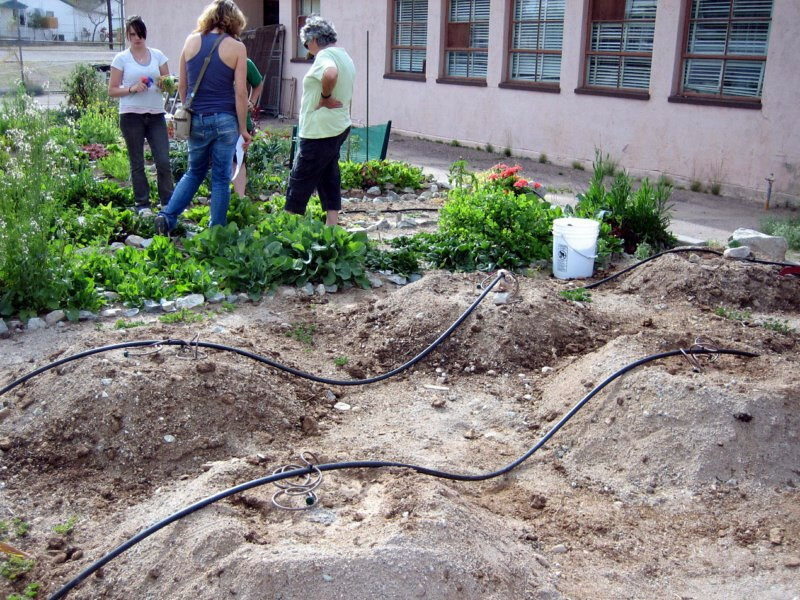 She’s trying different techniques, such as sunken-bed plots lined with stone to better retain water and emphasized that they’re using only organic materials such as manure for fertilizer. These are some raised-bed plots with I guess drip-irrigation. 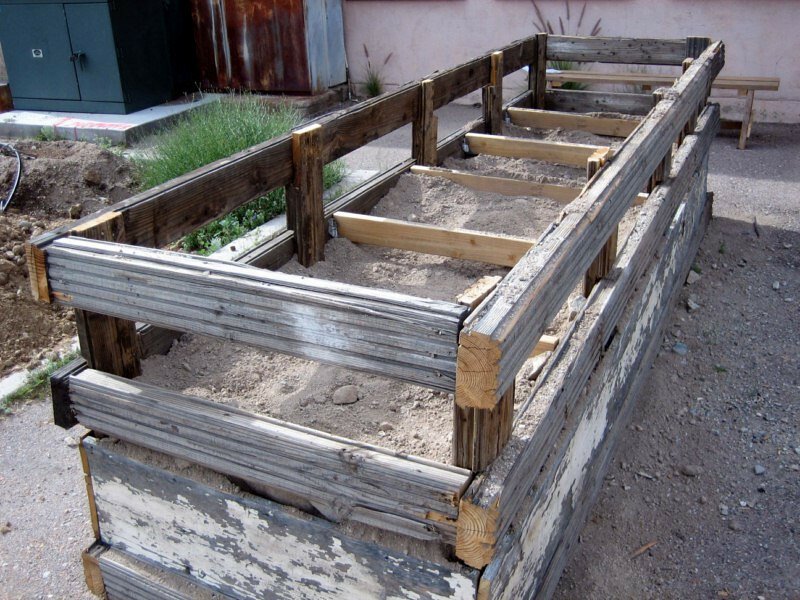 Another form of raised-bed plots. 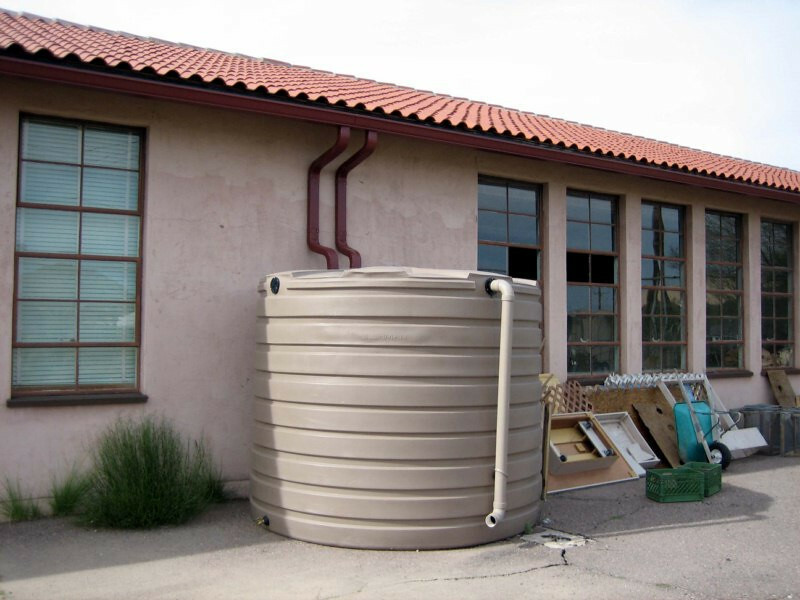 Rain water harvesting, which is used to water the garden. Water is already a scarce resource in the south-west and looks set to be a bigger and bigger issue in coming years. 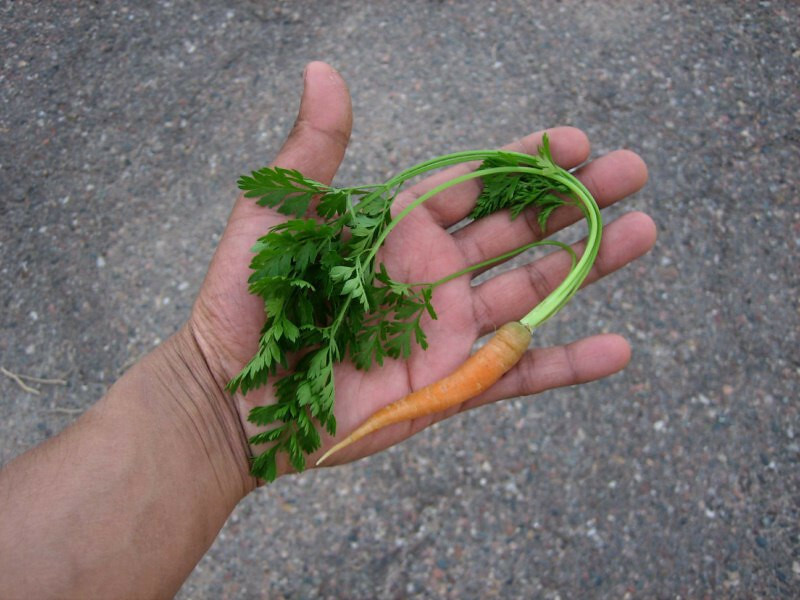 A carrot that one of the boys pulled from his plot. They looked really proud of the plots they were managing and rightly so. 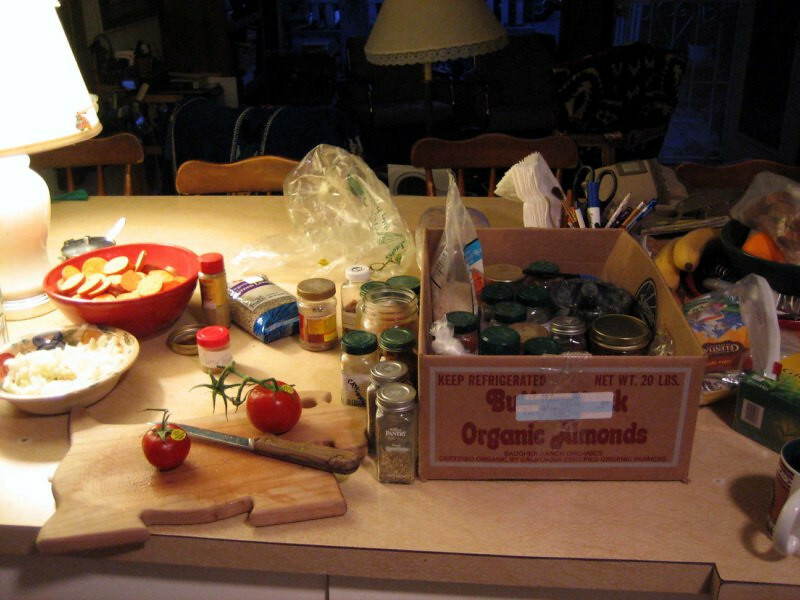 With all the vegetables from the garden, today Nina was showing them how to make their own salsa. They all looked like good kids at heart and happy to see them getting a second chance. Speaking with their teacher, Morgana after I gave a little spiel to the class about where I’m from and what kind of foods we eat in India. I was probably their first Indian from India that they saw. Morgana here was in the Peace Corps and spent about 2 years in Namibia and is planning on having a traditional Namibian wedding in the Summer of 2011 (in addition to her US wedding shortly) and that’s about when I plan to be in southern Africa, so I was invited. I love unexpected connections. 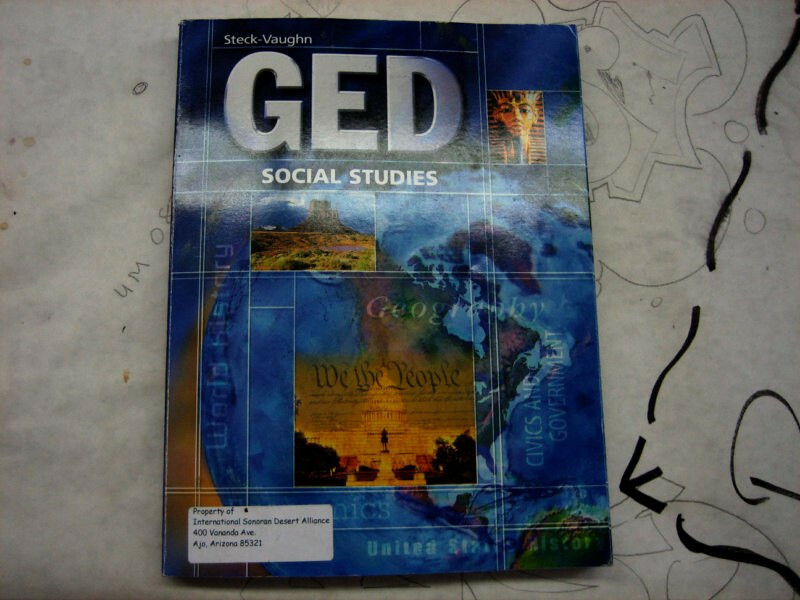 A textbook for the class. 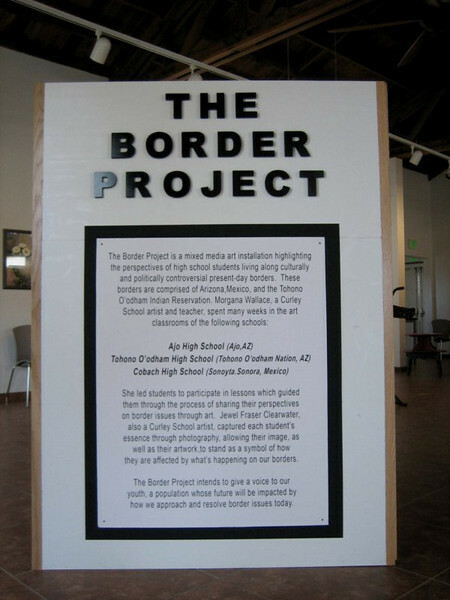 A interesting project that Morgana recently finished is this Border Project, where she encouraged students in schools separated by present-day political and cultural borders to express their views through mixed media on border issues. 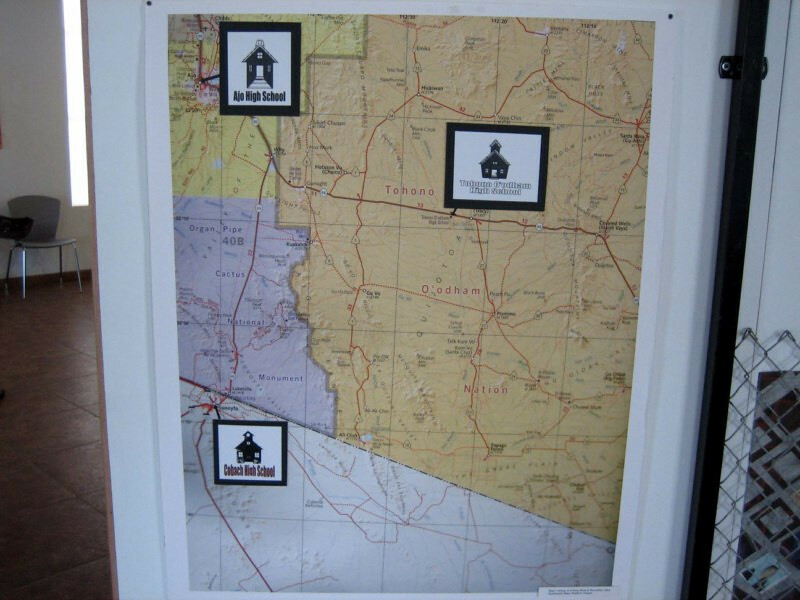 The schools where in Ajo, Arizona, Tohono O’odham Native American Nation and across the border in Sonoyta, Mexico. Some of the views of the kids. 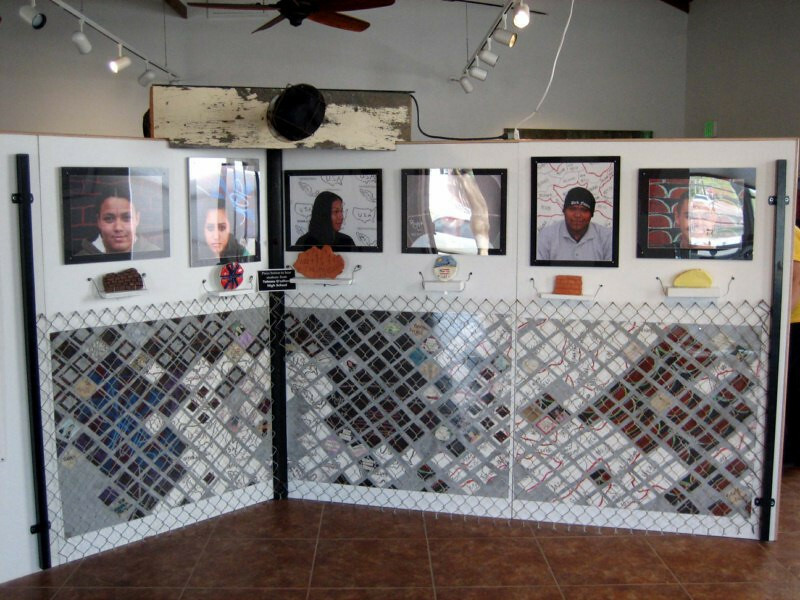 The lines drawn on their faces represent the border. 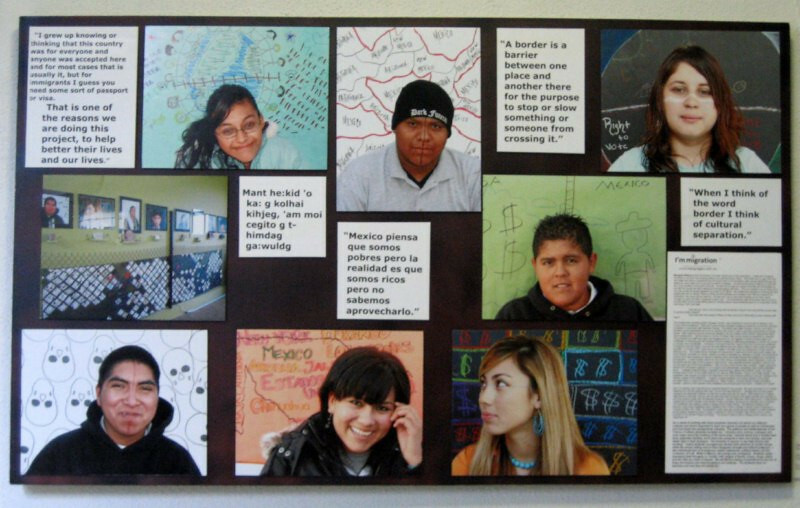 The artwork of the kids, which was picked up by the Smithsonian Institute as part of a mobile traveling gallery. Interesting sculpture in the art gallery. 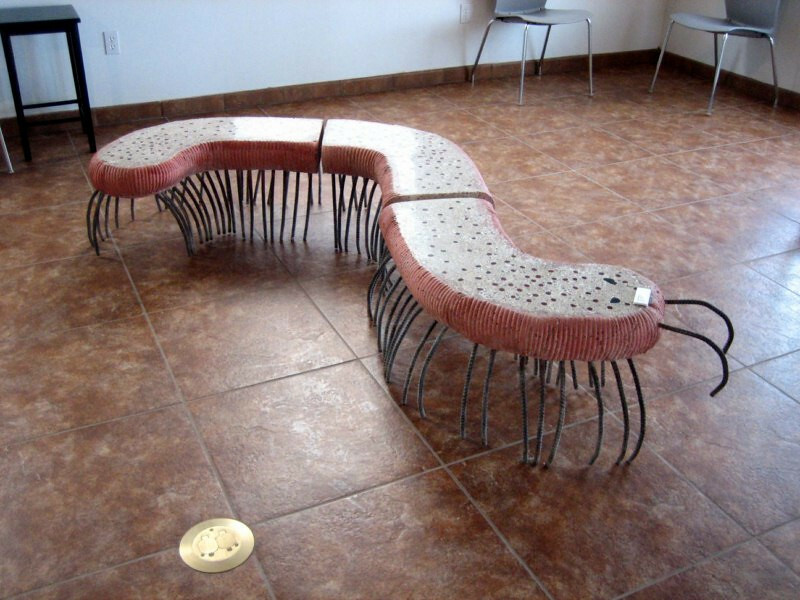 A centipede made of mud and rebar. 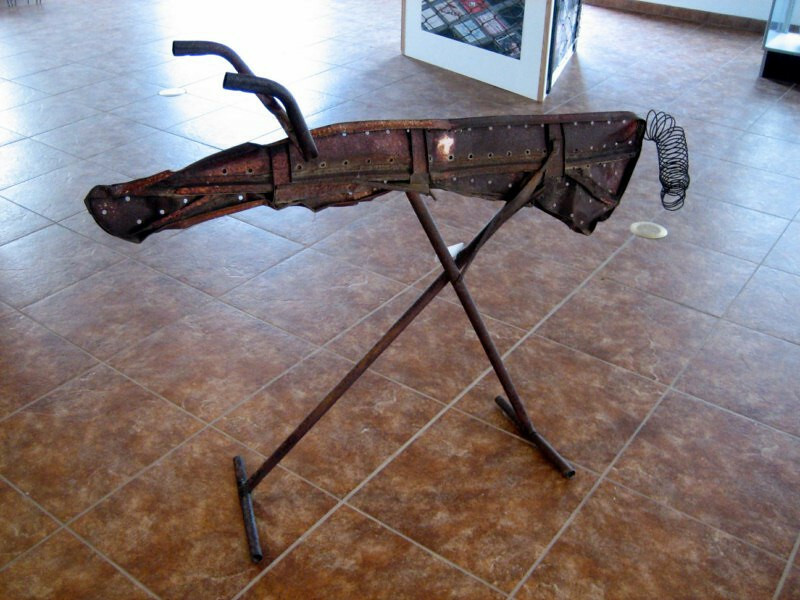 A donkey fashioned from an ironing board. That evening Gayle invited Nina and her husband Peter over so that we could cook a meal. Nina is from Slovenia and is finishing up a PhD from a university there and Peter runs a Slovenian translation business over the net. 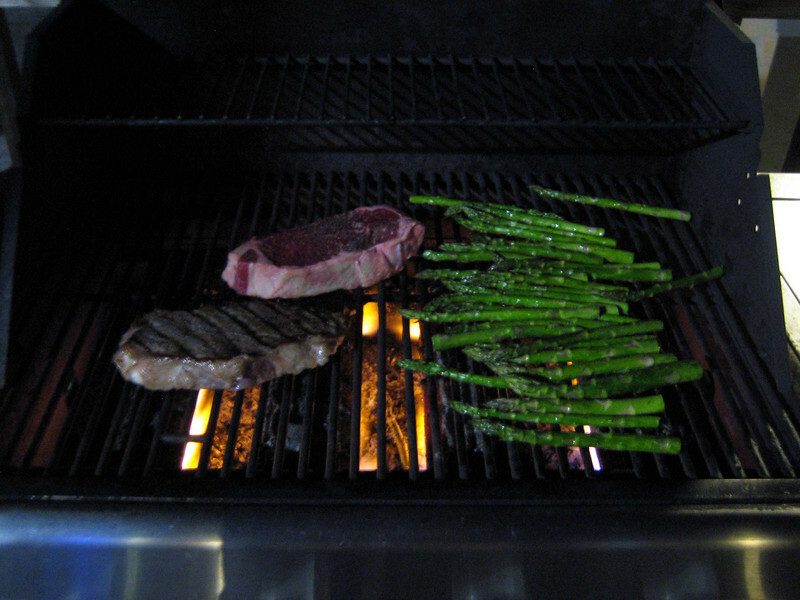 I was the director for the meal and Peter was cutting up the veggies. 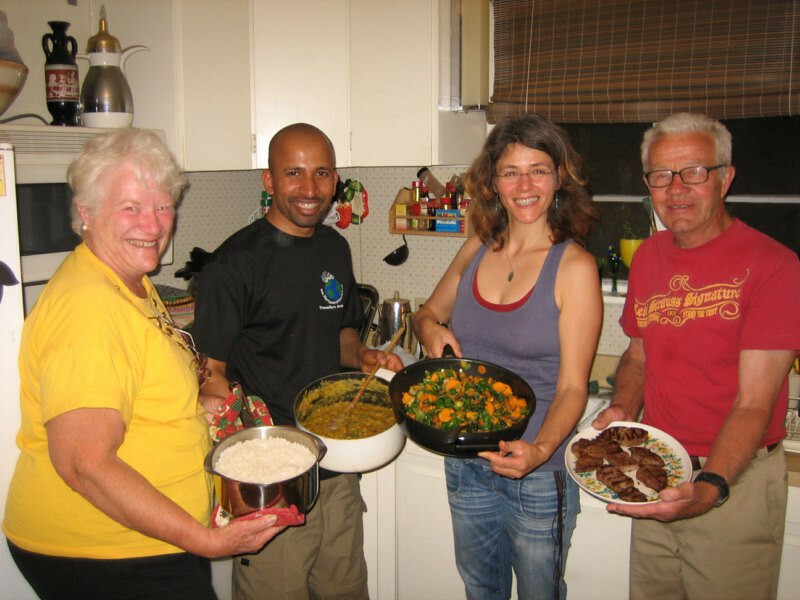 Nina brought over all her spices and the meal that evening was going to be Red Lentil Curry (dahl) with a veggie stir fry of mixed greens plucked fresh from the garden (chard, leeks, etc) along with carrots and sweet potato (one of my favorite veggies) with rice and some steaks. Check out the cute doggie cutting board. 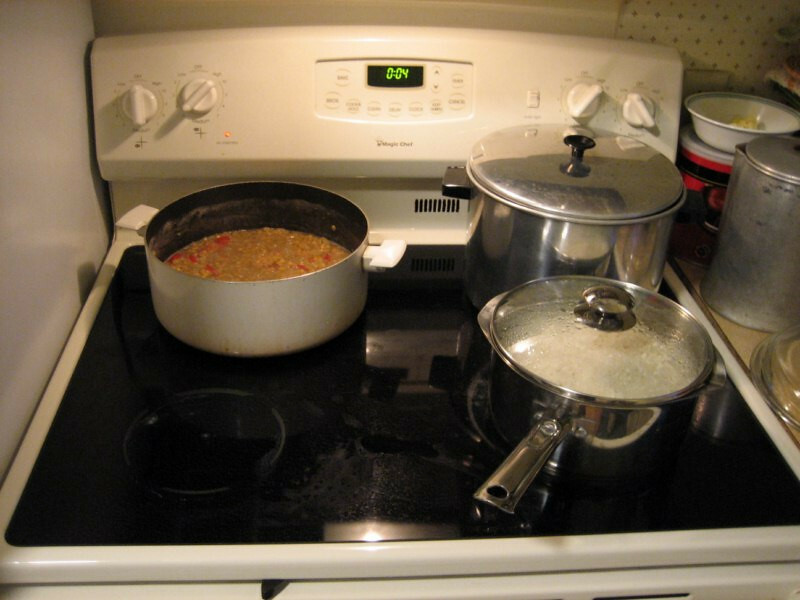 The lentils and rice cooking. 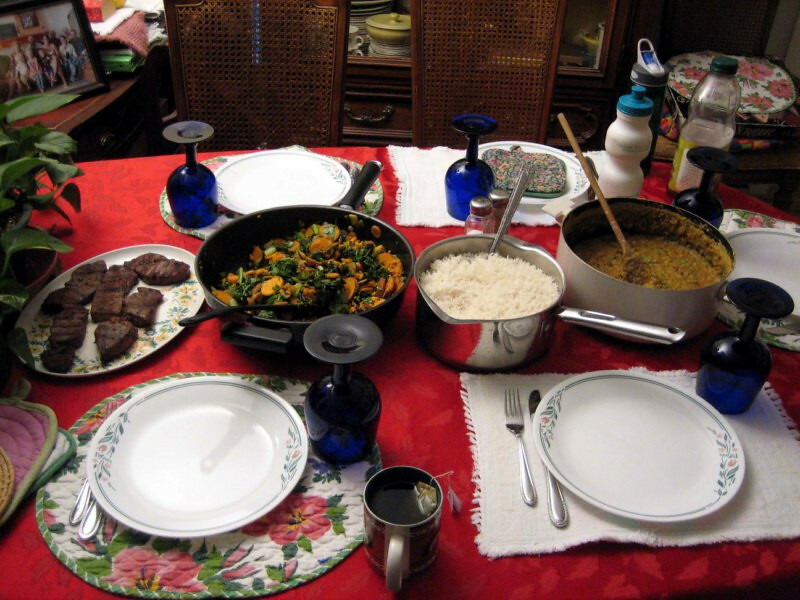 The spread: steaks prepared by Don, the veggie stir fry, rice and dahl. 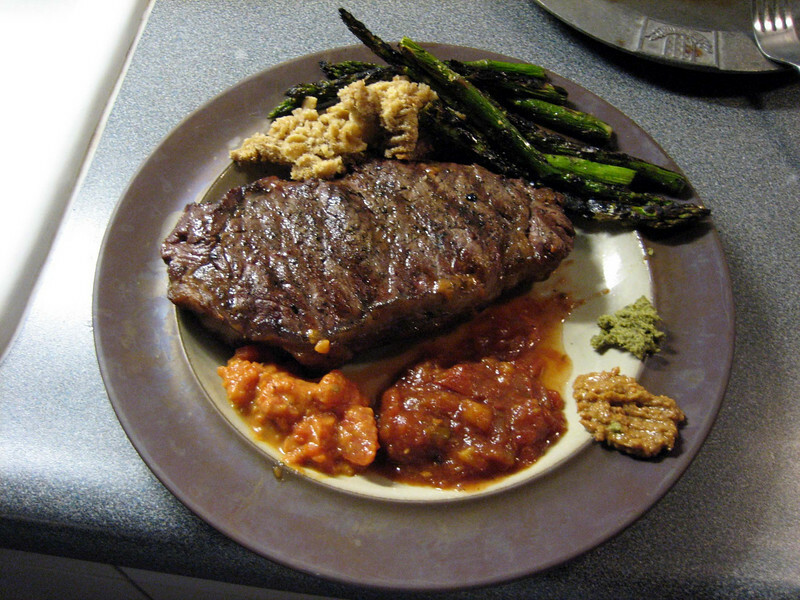 Came out quite good and glad I could get my cooking fix. 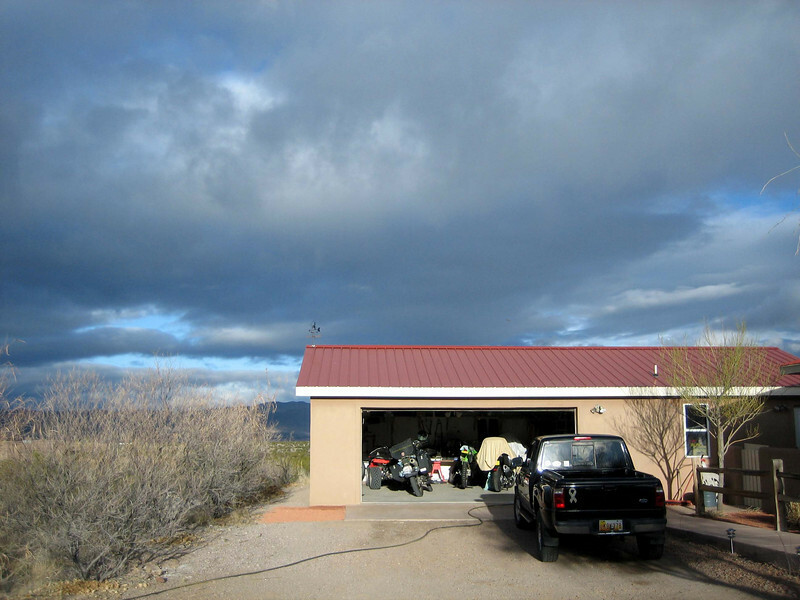 Gayle and Don’s house in Ajo. 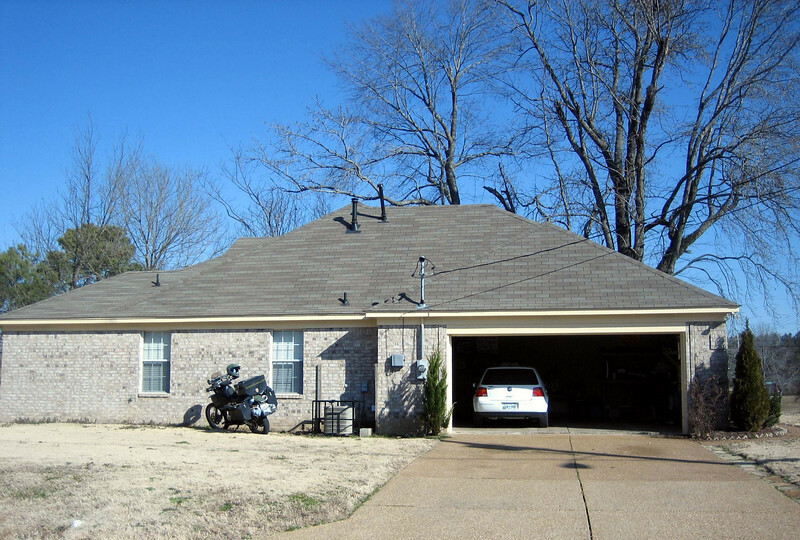 The side attachment where I stayed. 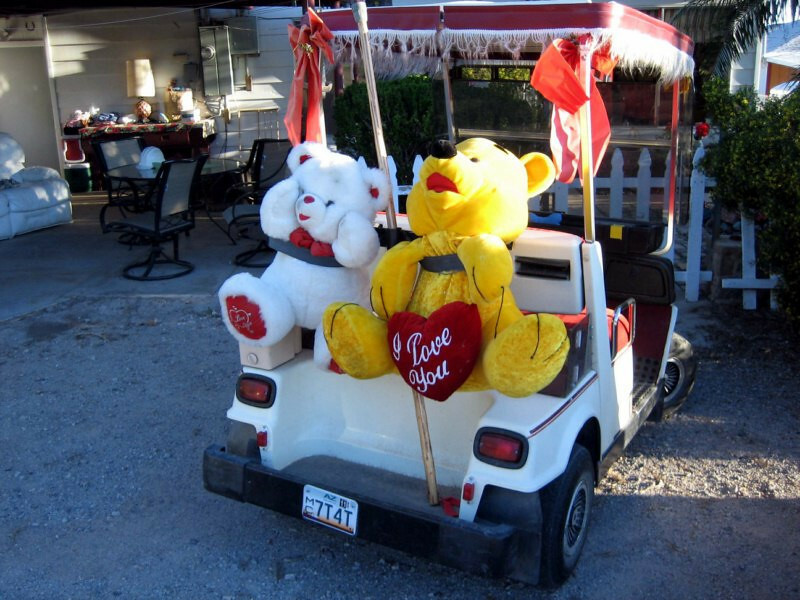 Gayle’s golf cart with teddy bears strapped on. 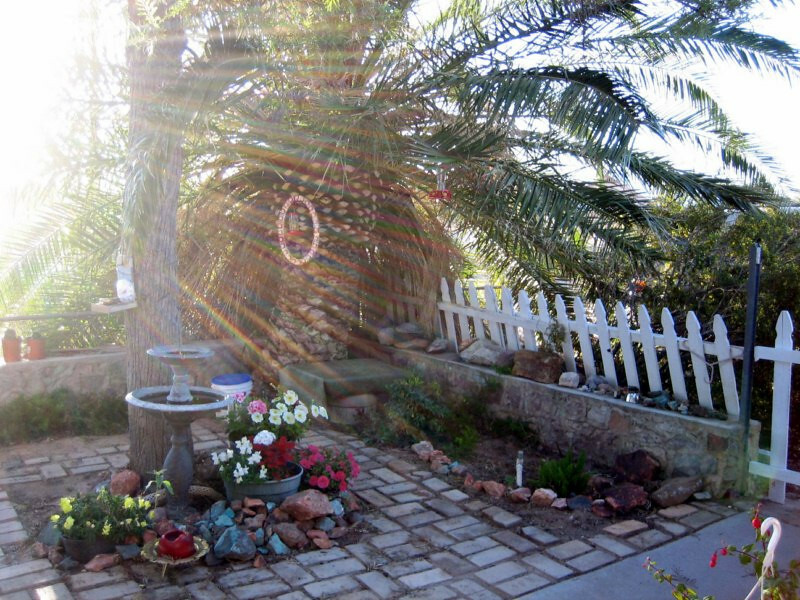 Their front yard with a bird feeding post. 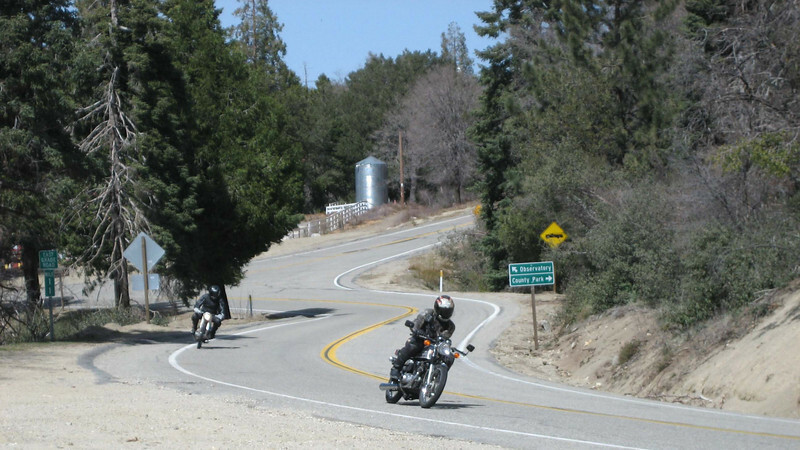 Getting closer to the Mexican border, my friend Ruben in San Diego invited me to come over and ride Palomar Mountain, a heavenly road for sport bike riders. 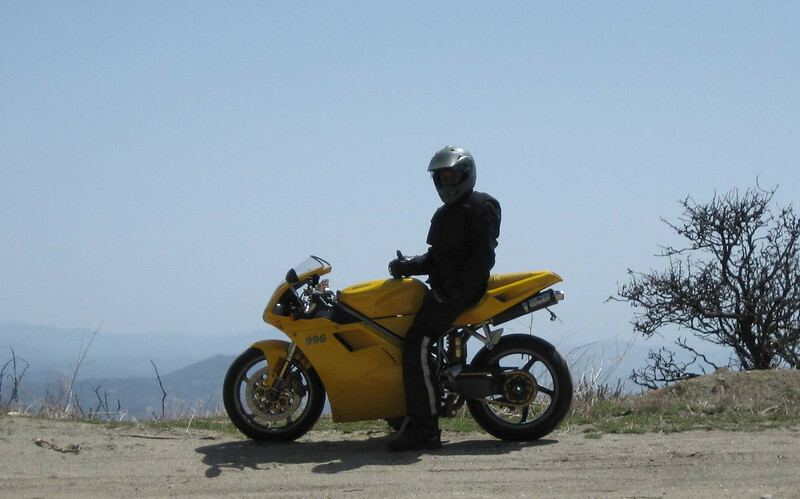 He moved out from Chicago a few years ago and while there he founded DRILL (Ducati Riders of Illinois) and got invited a few times by Ducati to their headquarters for club presidents’ meetings and got to ride beautiful Italian sportbikes through the twisty roads there. 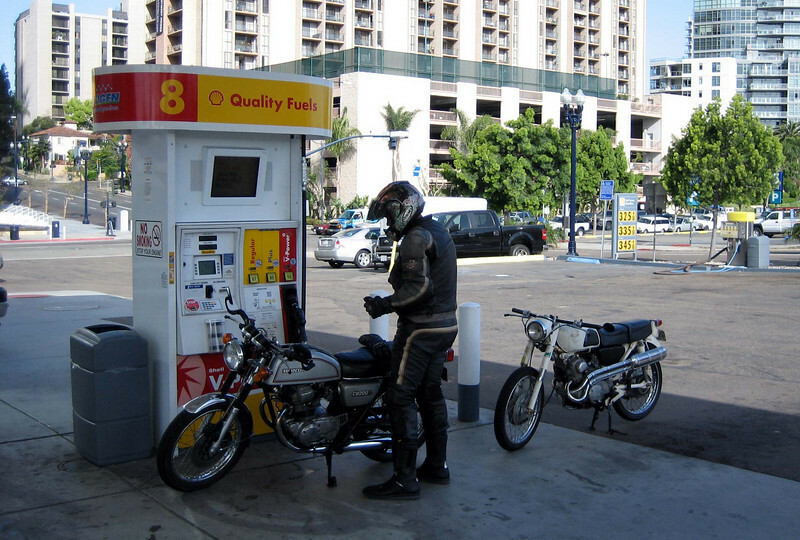 He then moved onto vintage Honda motorcycles and currently has a ’65 CB160 and a ’74 CB200, which is his wife Barabara’s daily rider. 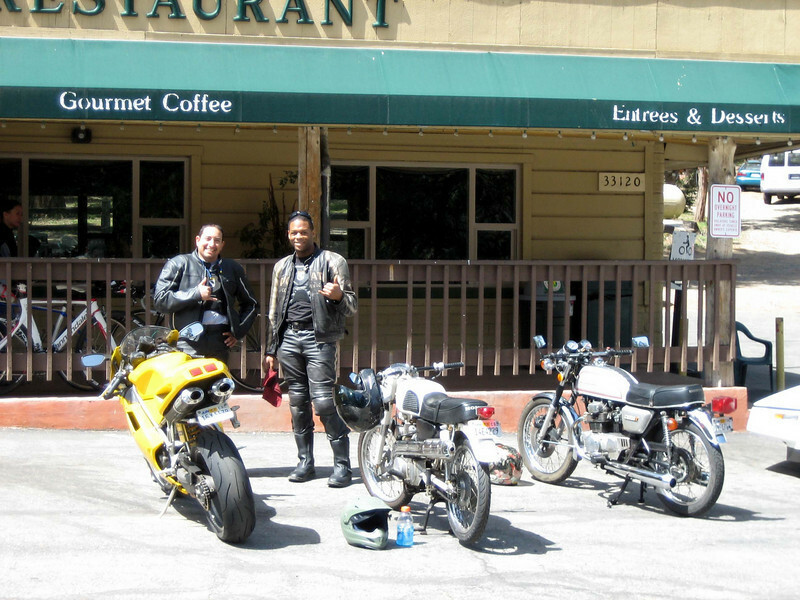 We planned to take the bikes out for a day ride to Palomar Mountain. 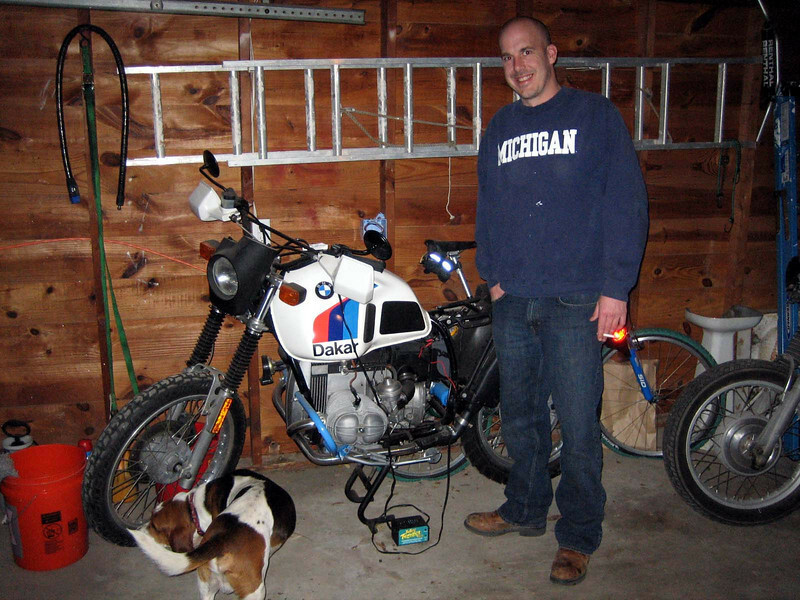 His primary bike is a Honda XL650. 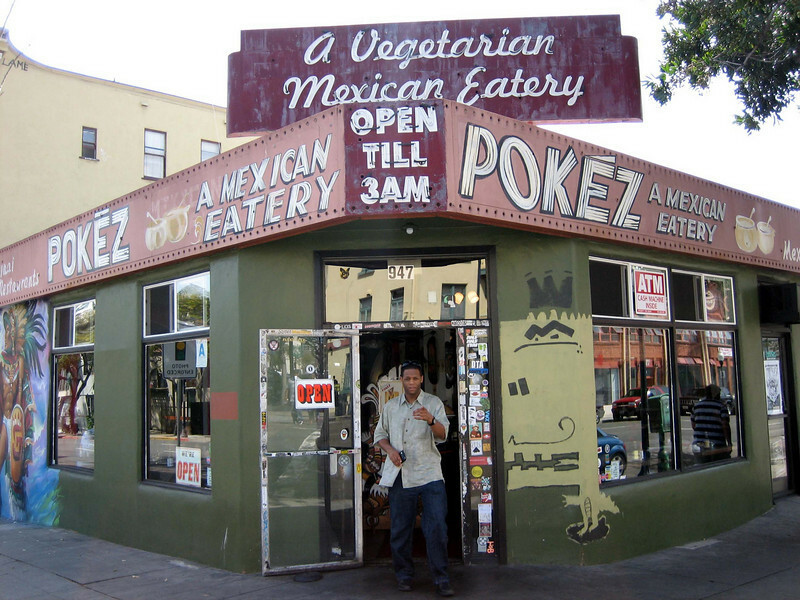 Getting some good eat at Pokez, a popular Mexican eatery. 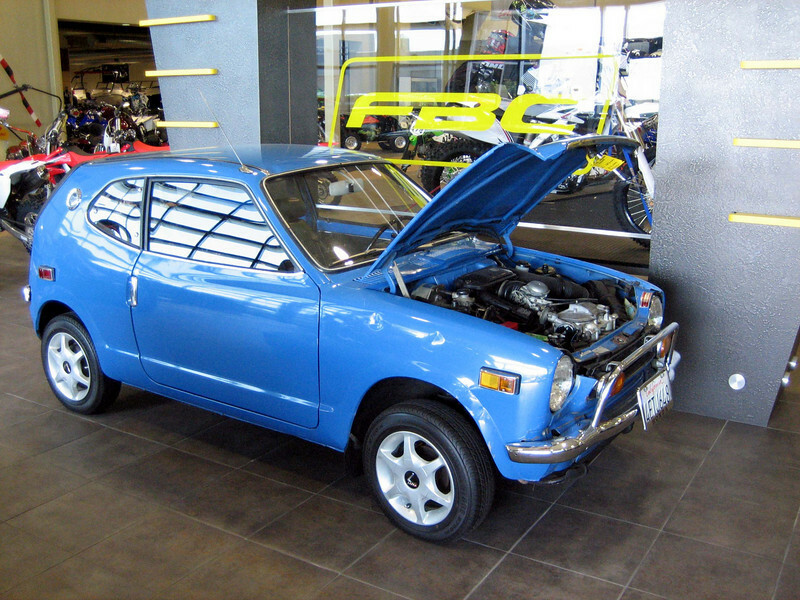 I tried to find a spare rear sprocket for the DR and we went around to a few dealerships but no one had it in stock. 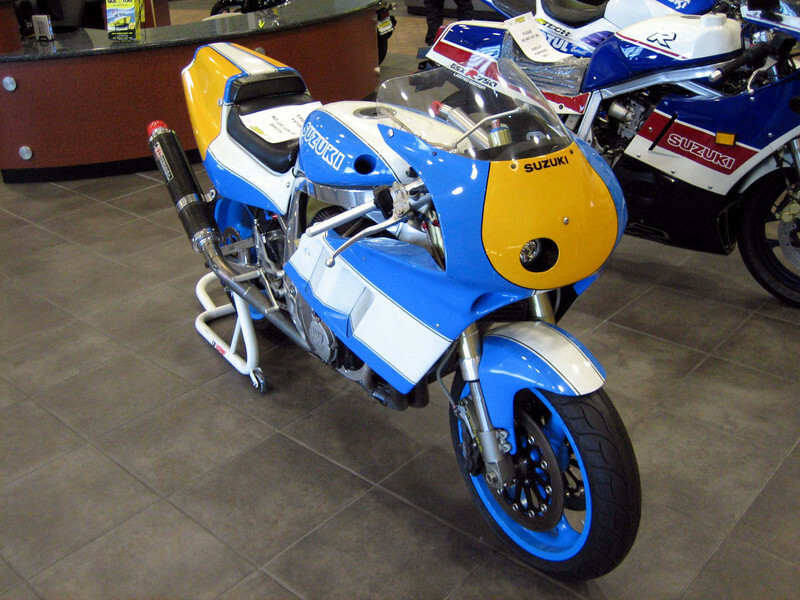 This is at Fun Bike Center and a handsome looking Suzuki GSX-R race bike. 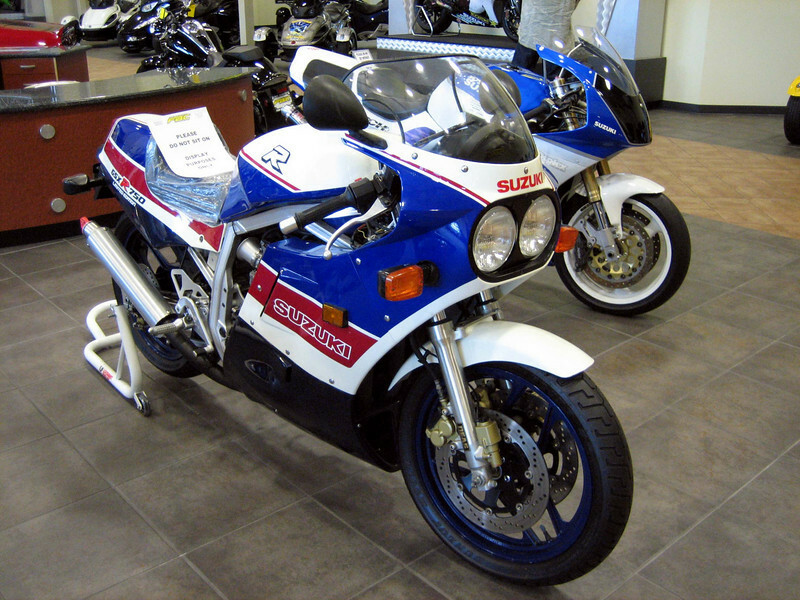 The grand daddy of all modern repli-race sport bikes, the Suzuki GSX-R750. 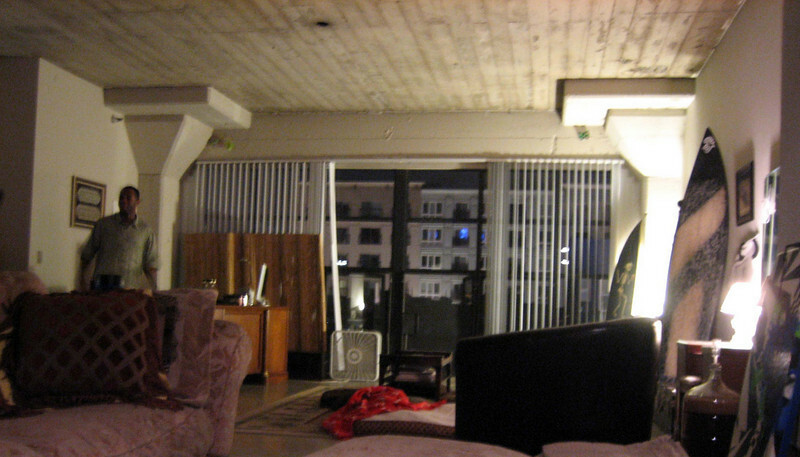 Ruben and Barbara’s loft in downtown San Diego. A very cool living space. 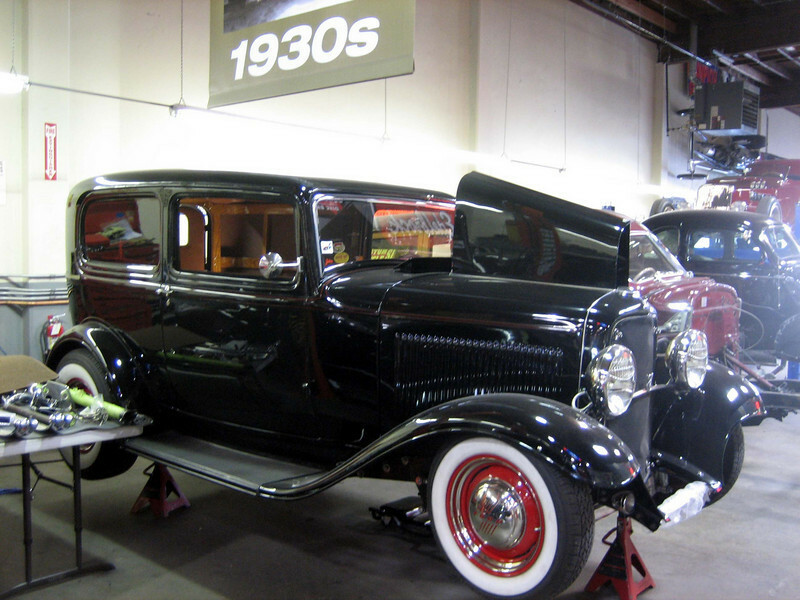 The building was originally used for trucks exchanging cargo back in the day. 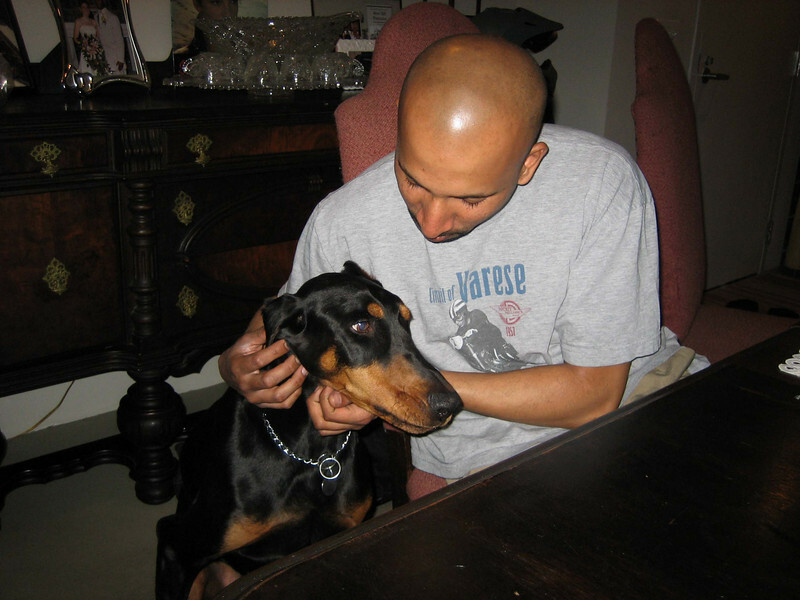 They adopted this adorable doberman, simply called D.
D and Barbara. 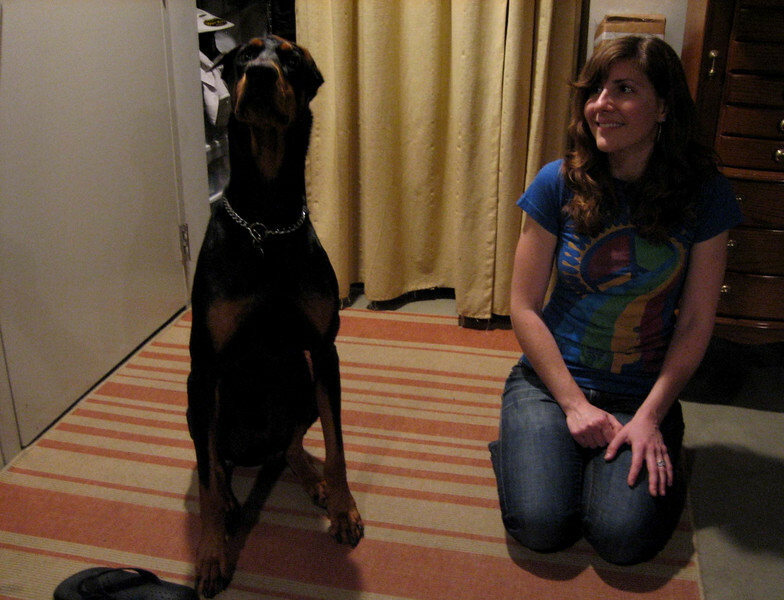 He was so well behaved (actually Ruben was holding a treat on top of the camera). It’s nice meeting all these supposedly aggressive types of dogs (from media impressions) who turn out to be such soft-hearted puppies. The fact that they (pit bulls, dobermans, etc) are so loyal and smart can be used by malicious owners to make aggressive dogs, but owners with good intentions can let out the true happy nature of these dogs. 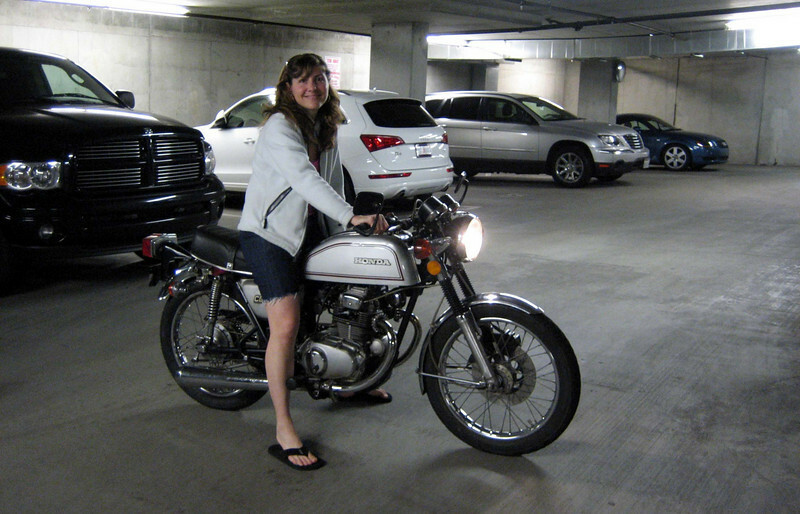 Barbara on her Honda CB200, warming her up for the day’s ride. She usually rides with all the proper safety gear when she commutes. 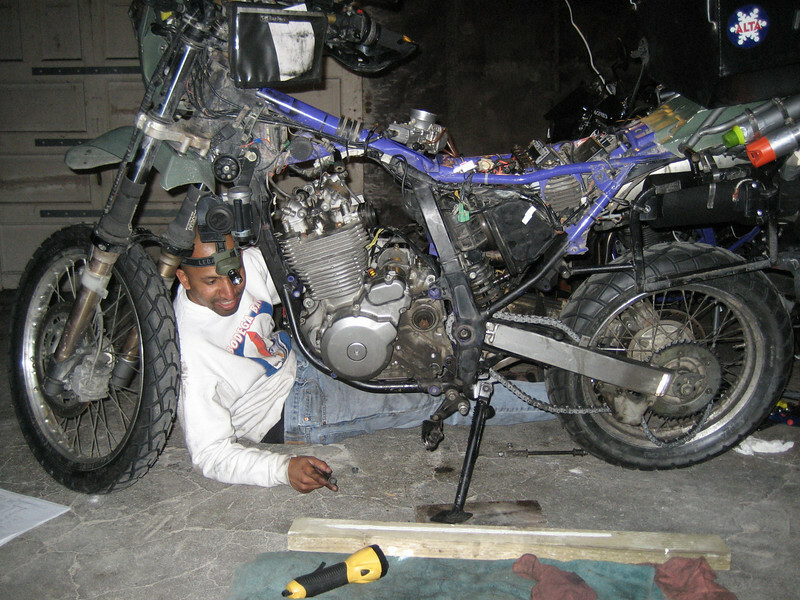 Ruben got the bike for $200 at a county fair and she required only a bit of work to be up and running. 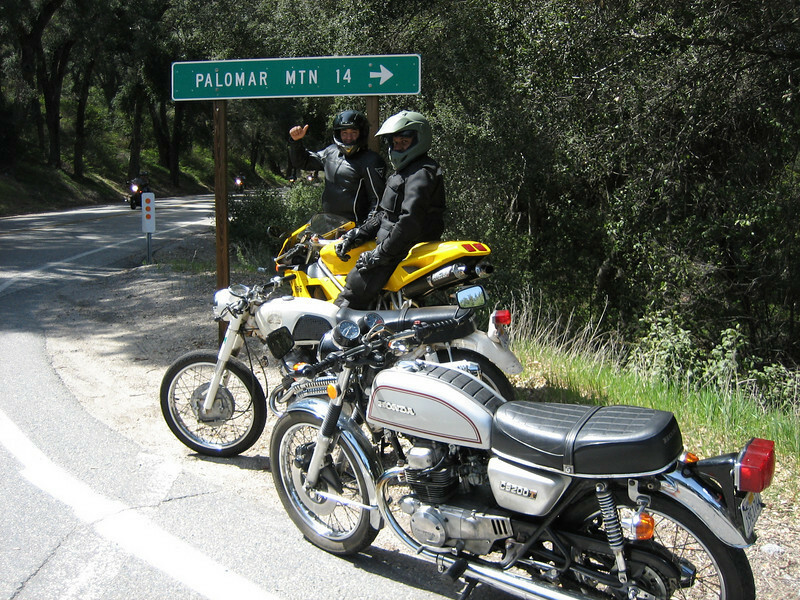 Ruben and I setting off for Palomar Mountain Road with me riding the CB160. 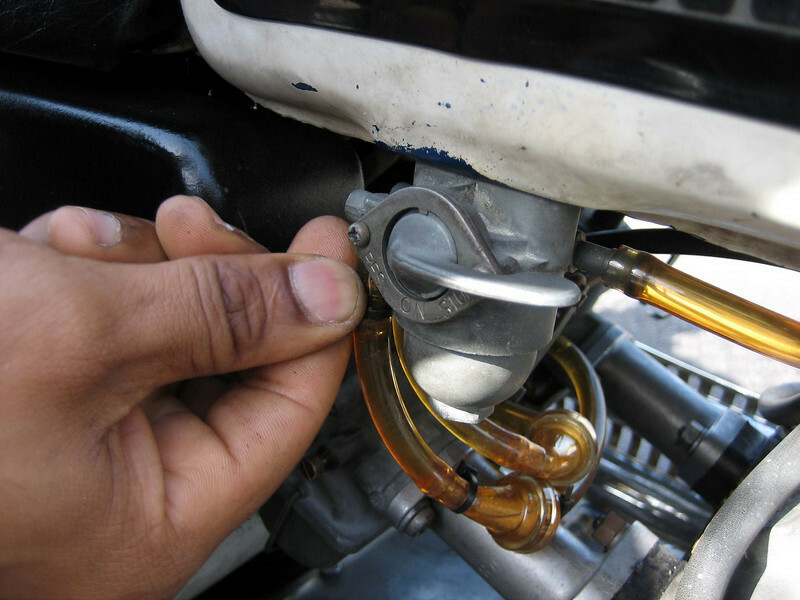 Check out the sweet scrabmler pipes. The gas tanks are only 2 gallons on these little gals. We met up with Silvano, Ruben’s riding friend from Chicago who’s from San Diego, riding a recently acquired Ducati 996 superbike. 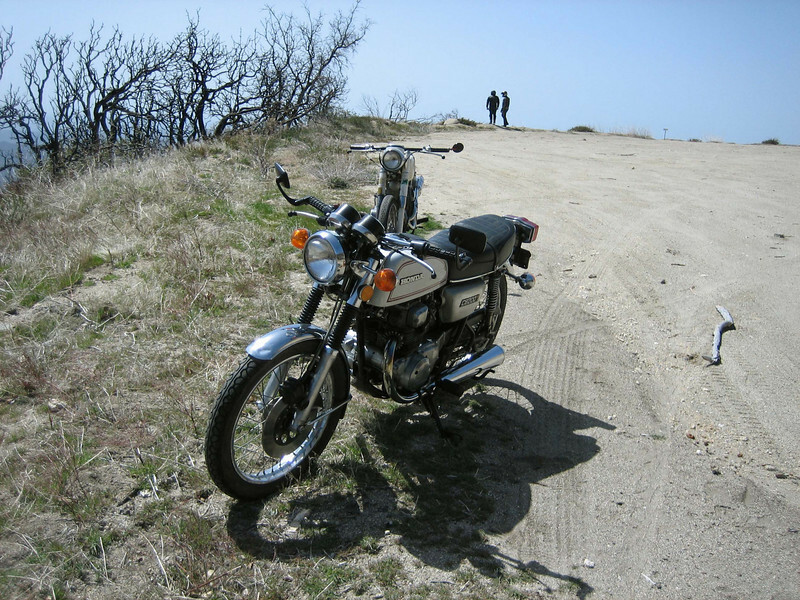 I was riding the CB160 for all she was worth on the highway (probably 70 mph) and then lost about half my power. 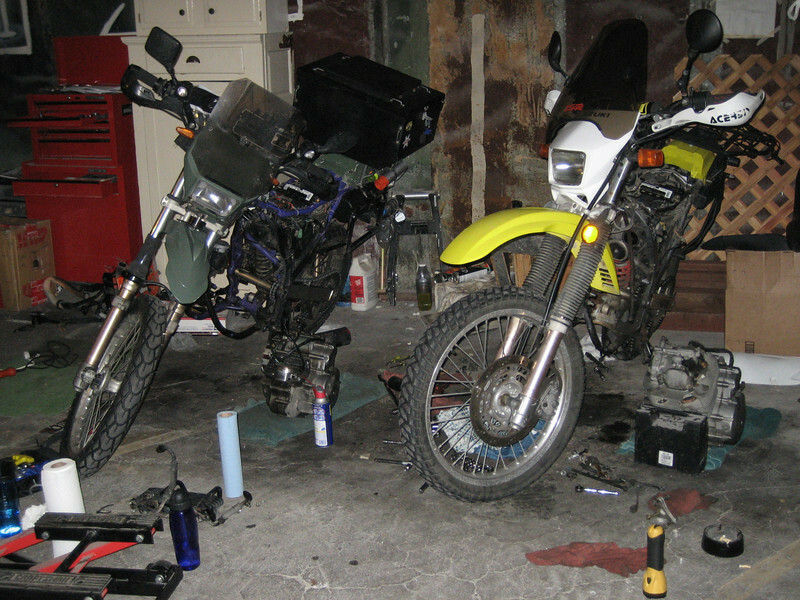 As with most vintage bikes, they need a bit of care and can be expected to break down. 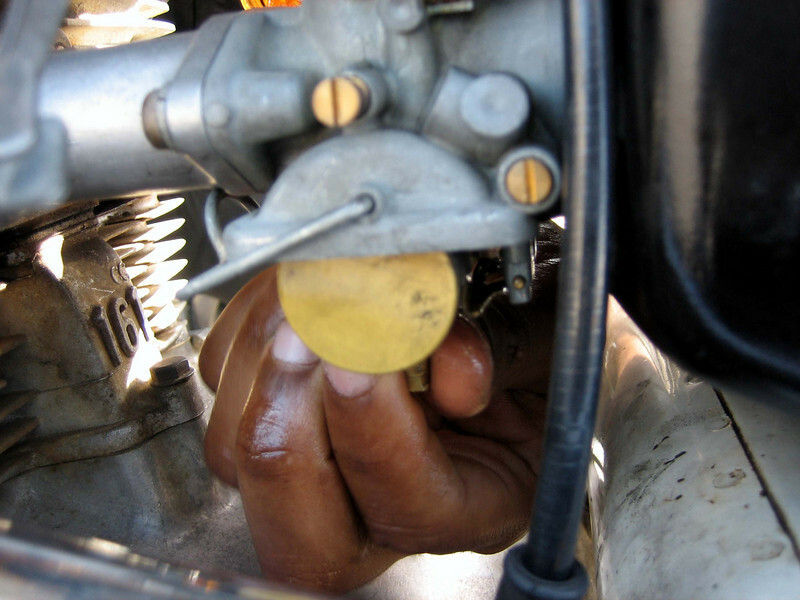 We first saw a cut in the fuel line leading into one of the carbs. The vinyl lines looked aged and it cracked at a stress point. 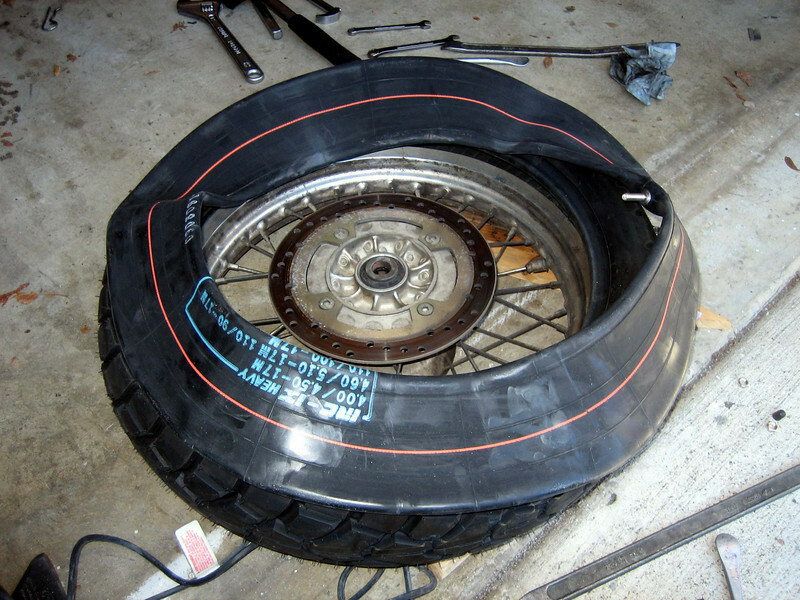 Ruben said he would change over to modern rubber hoses. But that didn’t seem to fix it and she was still running on half power. We opened the float bowl and saw one of the main jets had worked itself lose. 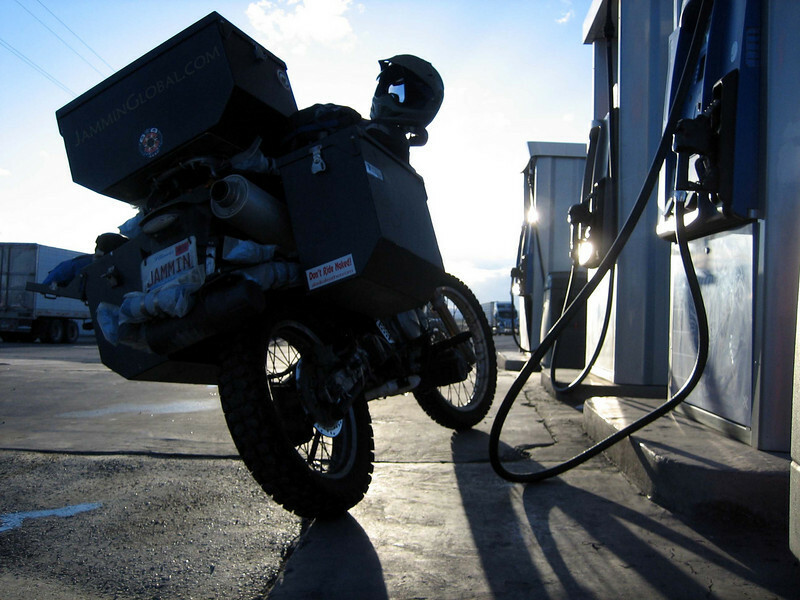 Dumping the fuel back in. A cool little tool box on CB160 and kick starter. Ruben buttoned things up and we were soon on our way to Palomar. 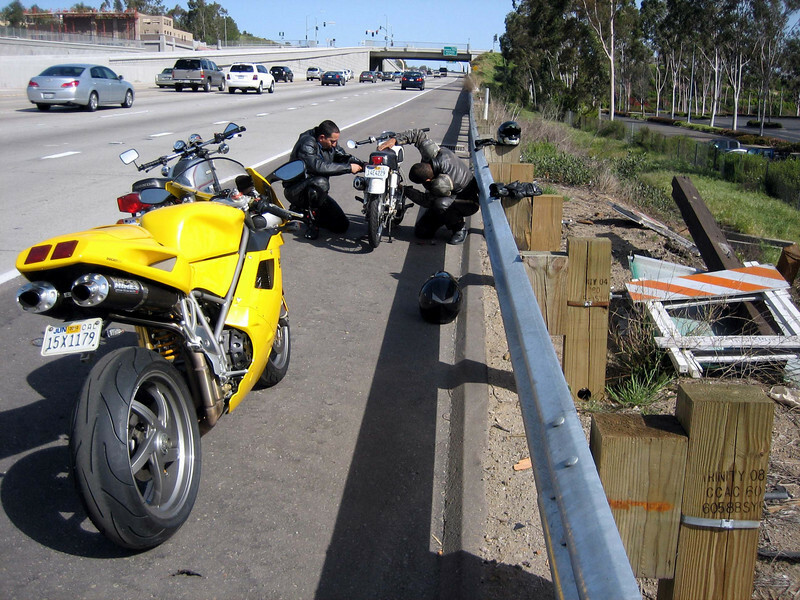 The Ducati was like big brother bringing up the rear and looking out for the two little bikes. 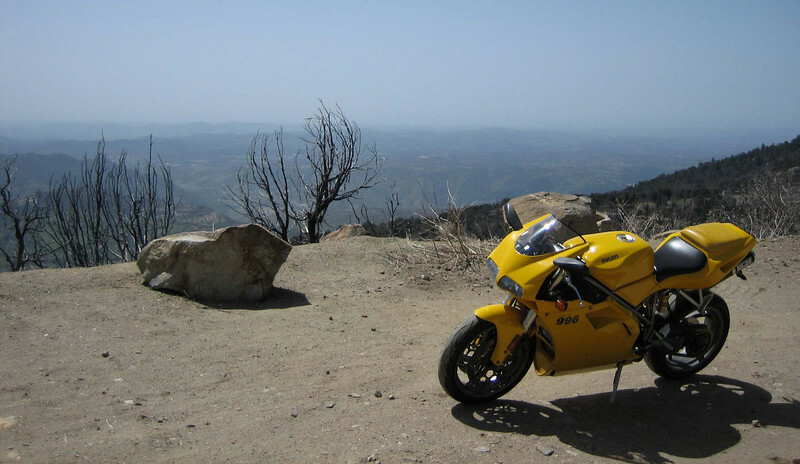 At the top of Palomar Mountain. 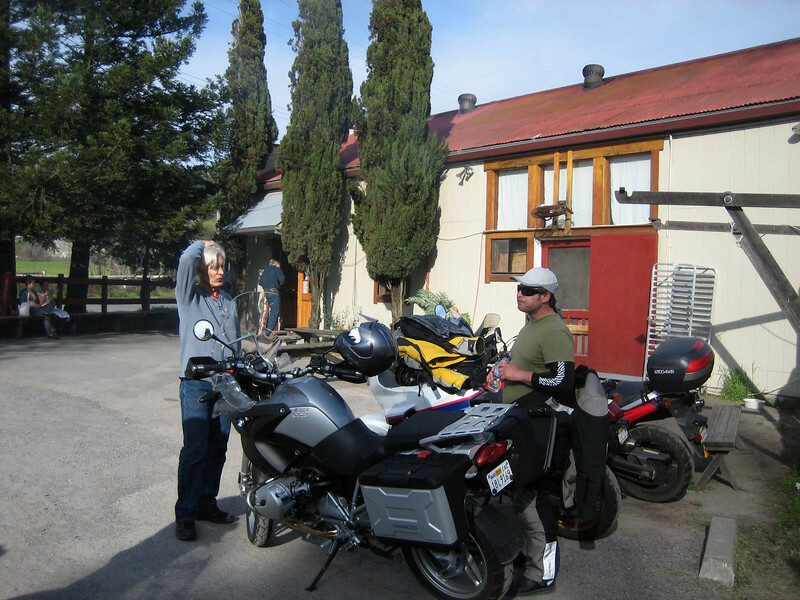 Silvano is also into vintage bikes and let me ride his Ducati all day long as he wanted to play around on the CB160. One of my dream bikes and getting to rail with it on one of my dream roads. Perfect. Taking a break at Mother’s Kitchen at the top. The CB160 attracted a lot of attention from all the other riders there. Lots of sport bikes were there and lots of Ducatis too. This is a 1098S and check out clutch cover delete. 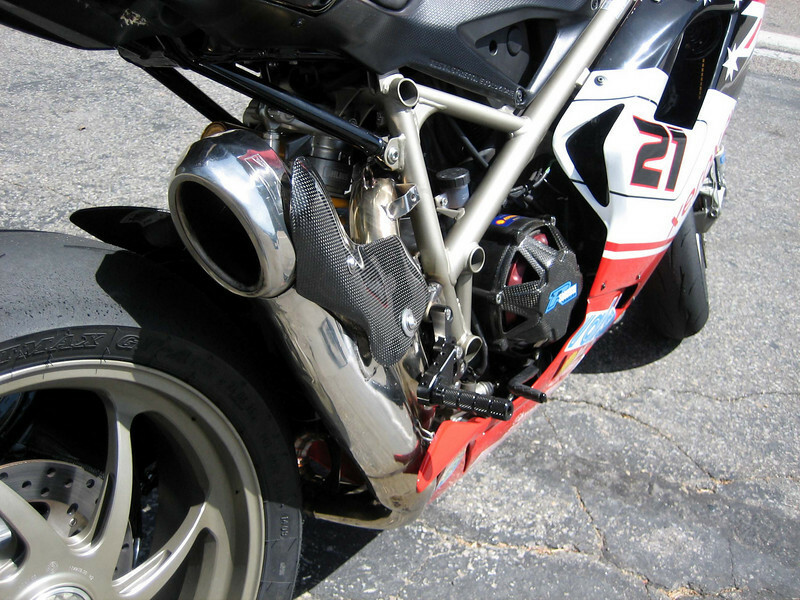 A unique exhaust on another 1098S. 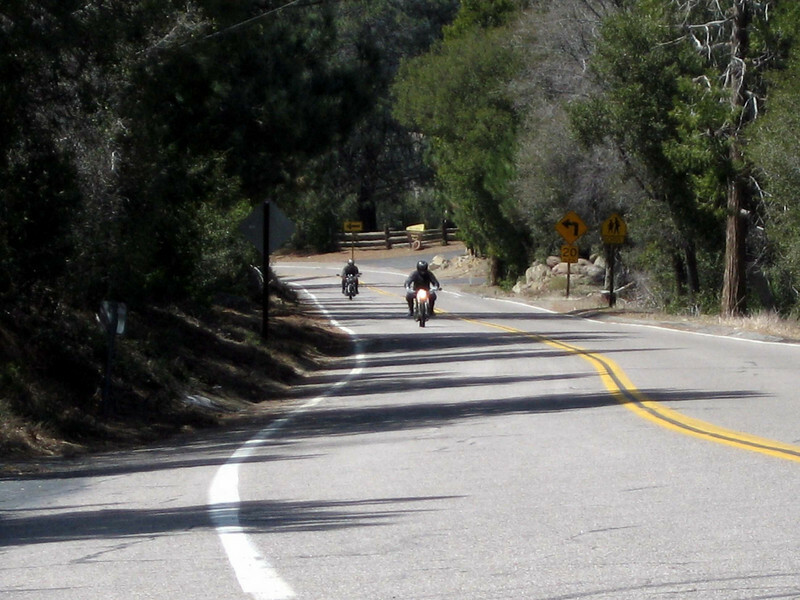 The two Hondas powering up the hill to the observatory. Silvano rejoicing in making it to the top. 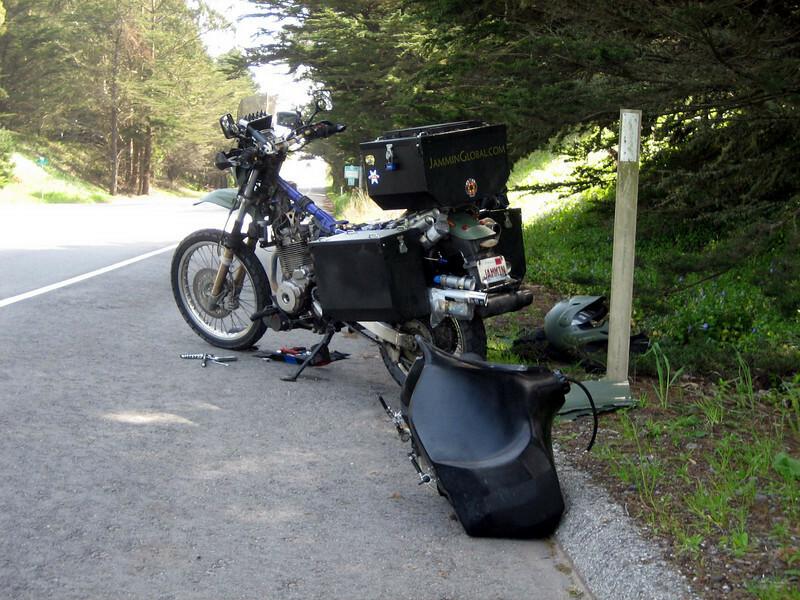 I think the bike produced about 16 hp, but handled pretty good. 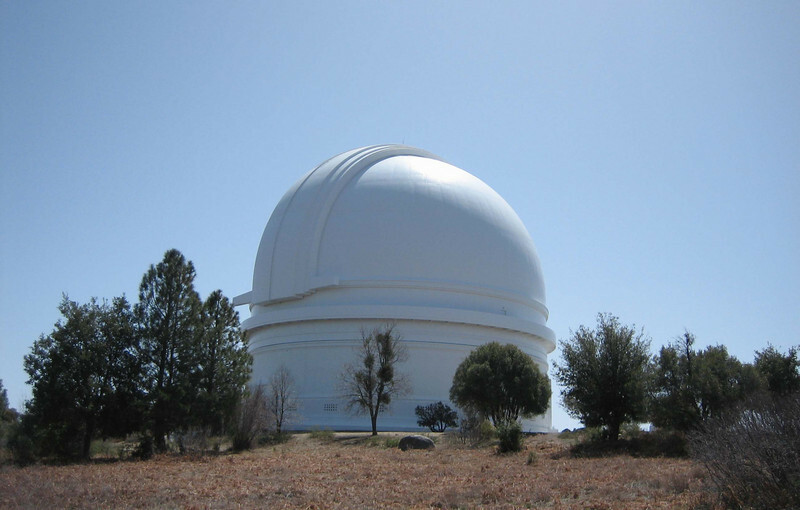 The Palomar Observatory housing the Hale Telescope, built in the 1940s was the largest telescope at the time and is the reason the twisty road was built up and over this little mountain for us to enjoy today. Edwin Hubble was given the honor of being the first astronomer to use the telescope and subsequently discoveries were made of quasars, stars in distant galaxies and asteroids close to home. 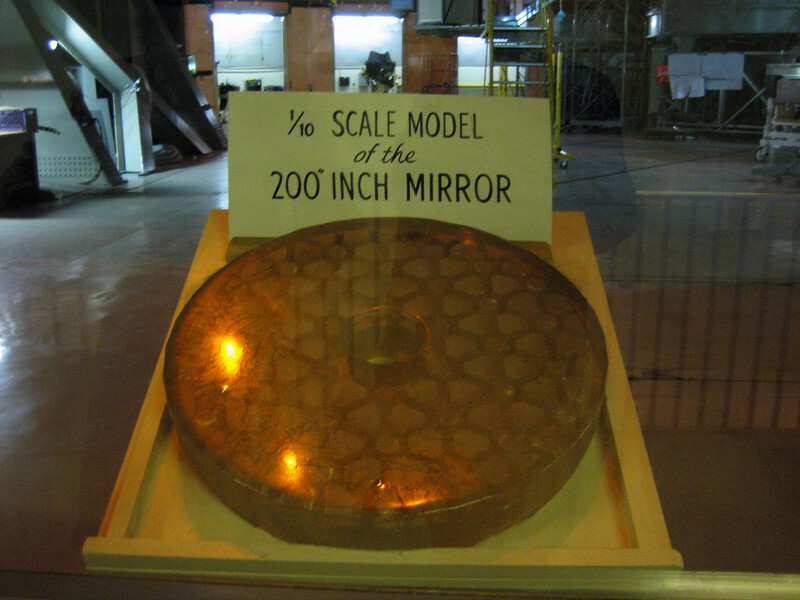 A scale model of the primary mirror, a single glass cast of 200″ in diameter. 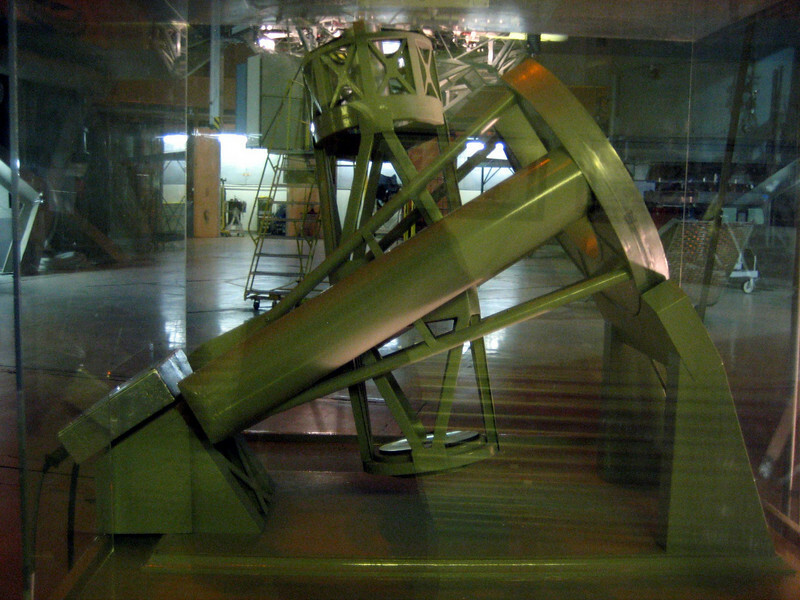 A scale model of the telescope. The pieces were built in New York and the large tube had be transported through the Panama Canal. Getting a glimpse of the actual telescope. 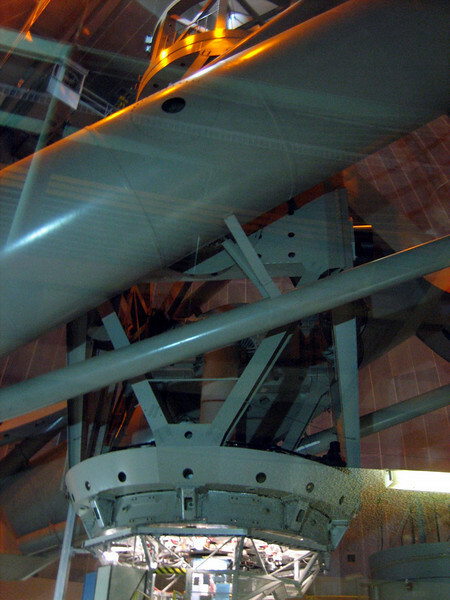 The mirror is in the bottom kitted out with adaptive optics to produce even sharper images of space. We were at 5,500 ft of elevation and it was quite chilly. 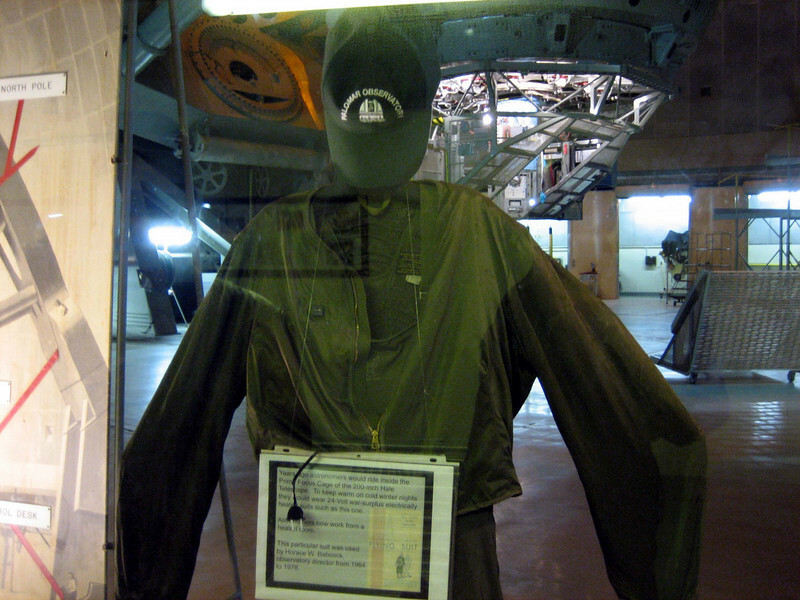 Since astronomers primarily do their telescope work at night (dark skies), it can get quite cold and in the early days they used to wear this rudimentary heated suit that military pilots used to wear. Now they have heated rooms. A beautiful cloud-less day to be out riding. 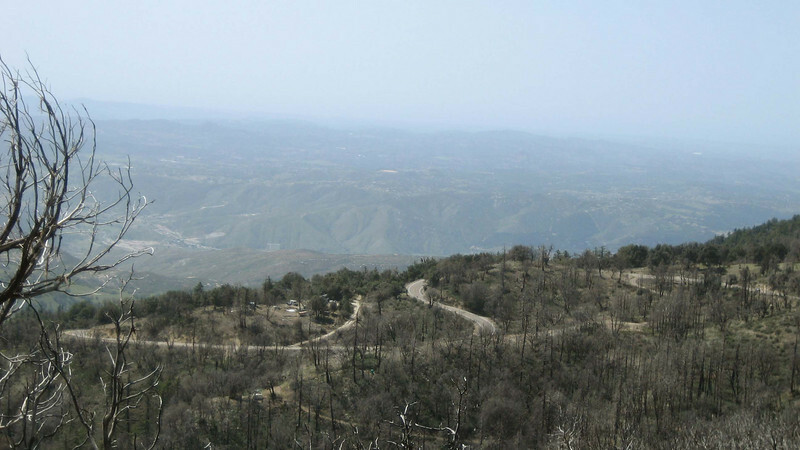 A view of the south grade of Palomar Mountain Road. 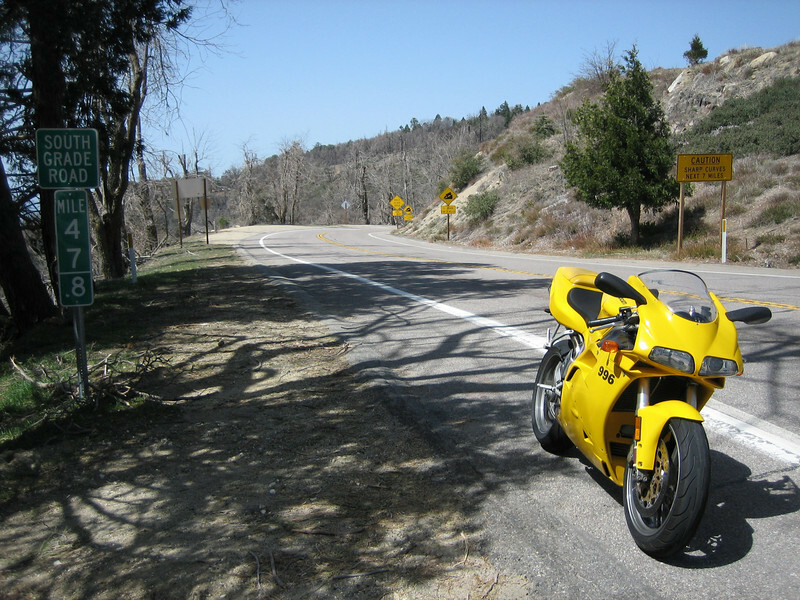 What a joy to ride this wonderful motorcycle on just the kind of roads it was designed for. It was a torture rack on the straight sections but felt just right hanging off in the corners. And contrasted with these two little run-abouts – racers in their hey days. 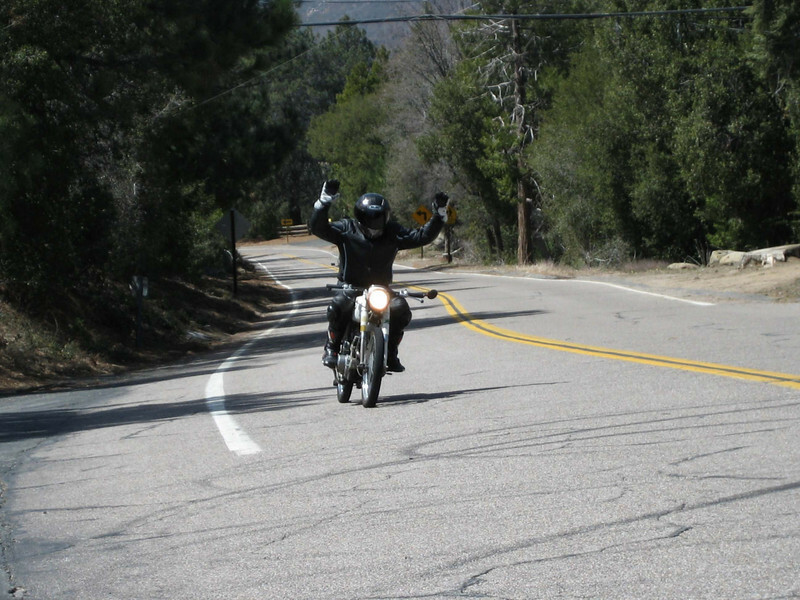 I thoroughly enjoyed Palomar Mountain and happy to finally have ridden it. Thanks Silvano for letting me ride the wonderful Ducati 996. Heading back to San Diego. Making it back to the city. Ruben was happy both bikes rode well all day as this was their first long day. 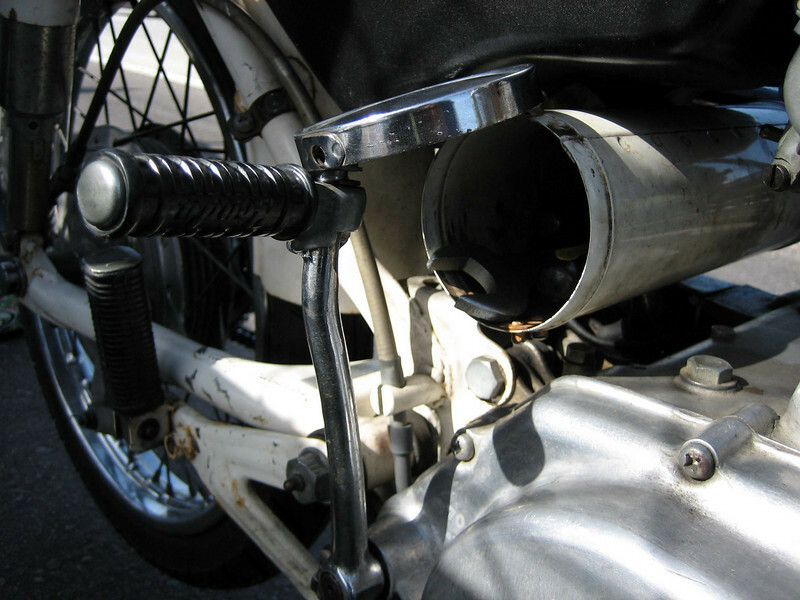 The CB160 is having a resurgence as a great vintage racer with a race series in Los Angeles. It might only have 16 hp, but once it gets going, it actually feels pretty good and handles well too. 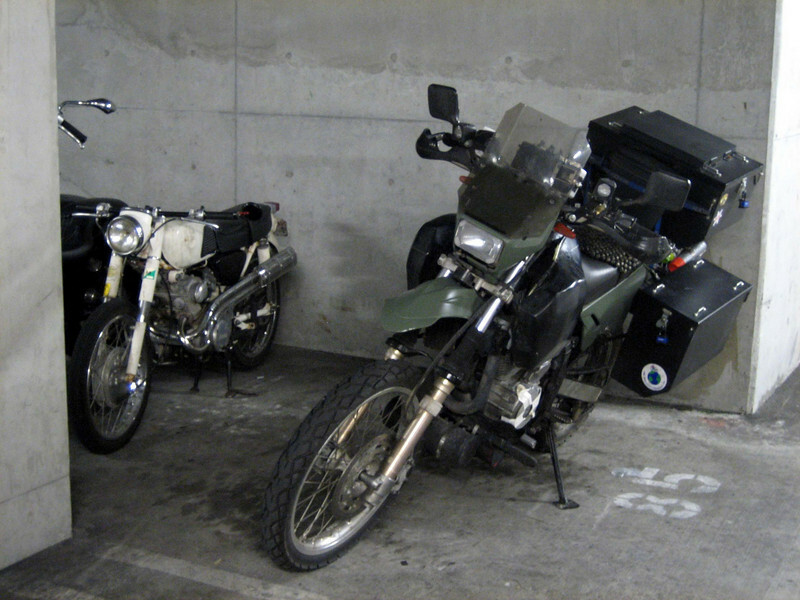 The CB160 in comparison to my DR650. 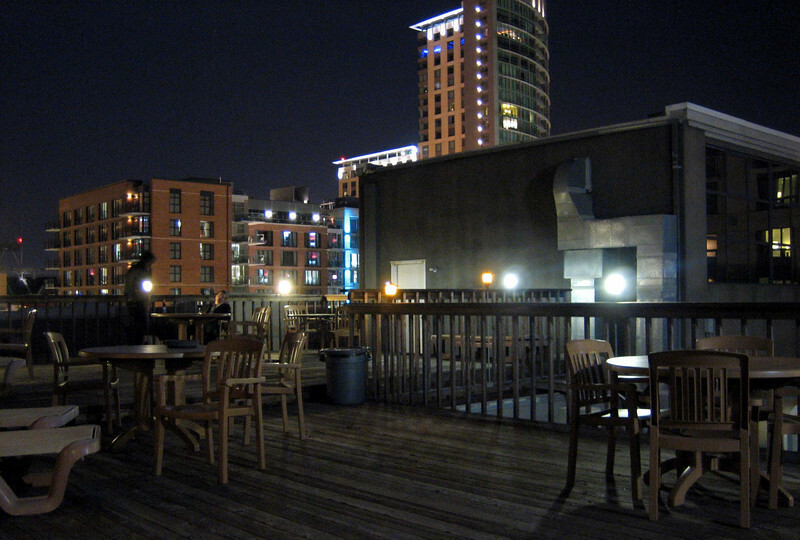 The roof top at Ruben’s place. 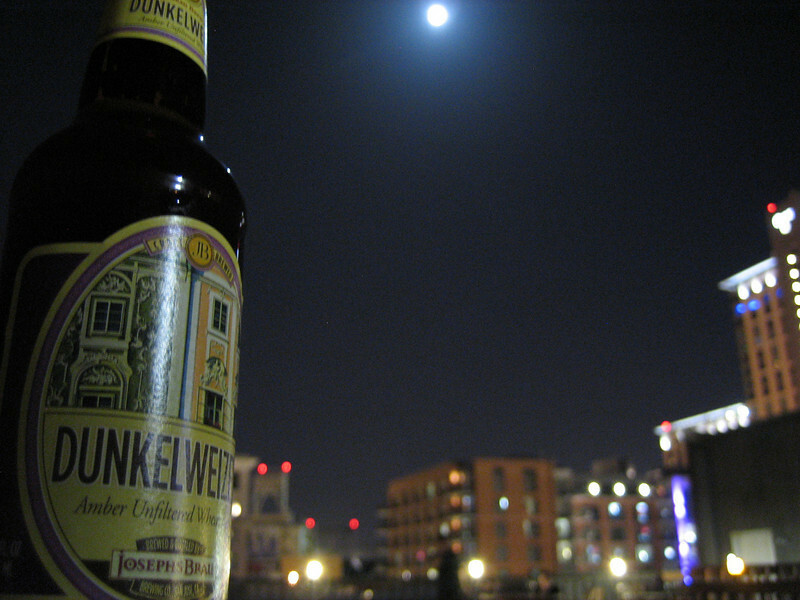 Enjoying a Dunkelweizen beer under the full moon. 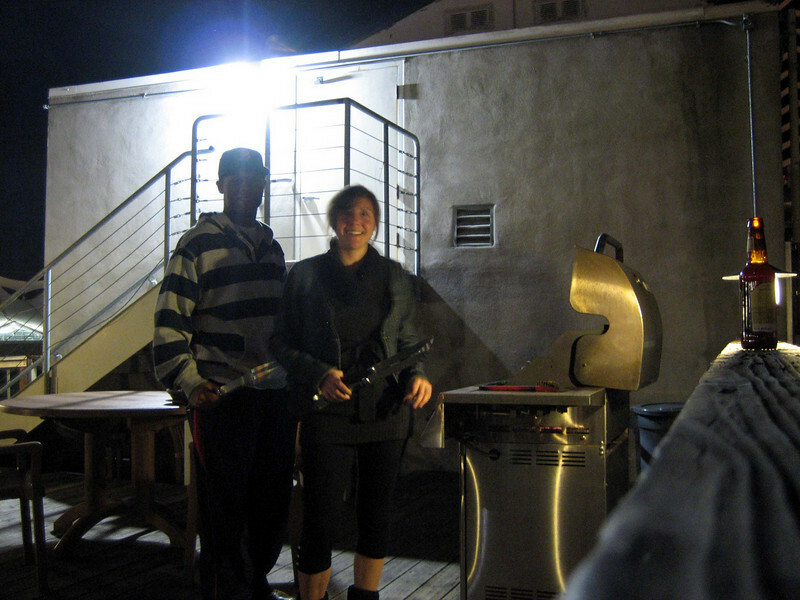 Ruben and Barbara grilling out on the roof. Thanks for being such gracious hosts. You made my last few nights in the US really special. Leaving San Diego, heading east into Arizona to cross into mainland Mexico. 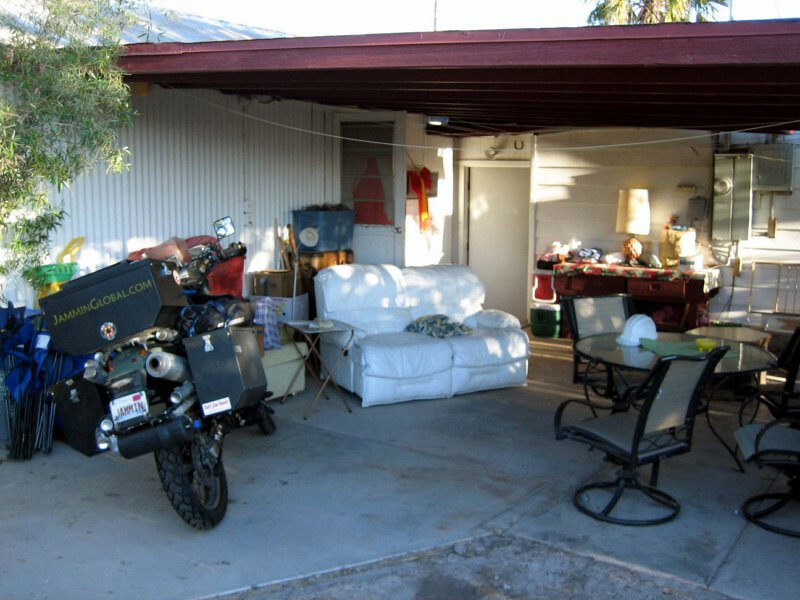 I’m currently in Ajo, Arizona, planning to cross into Mexico tomorrow. 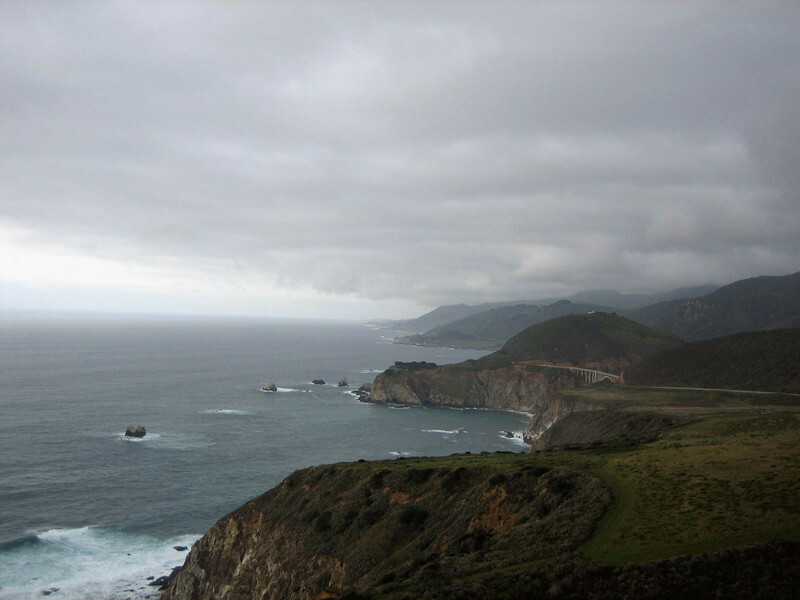 El Pacifico. 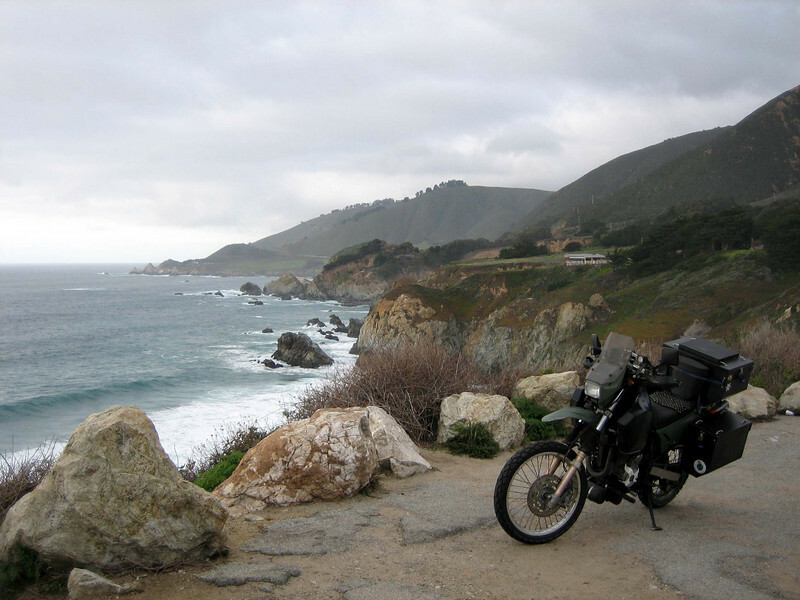 Riding the beautiful Pacific Coastal Highway south from San Francisco. Something I’ve wanted to do before leaving the US. This was definitely some epic landscape, especially with the lighting towards dusk. 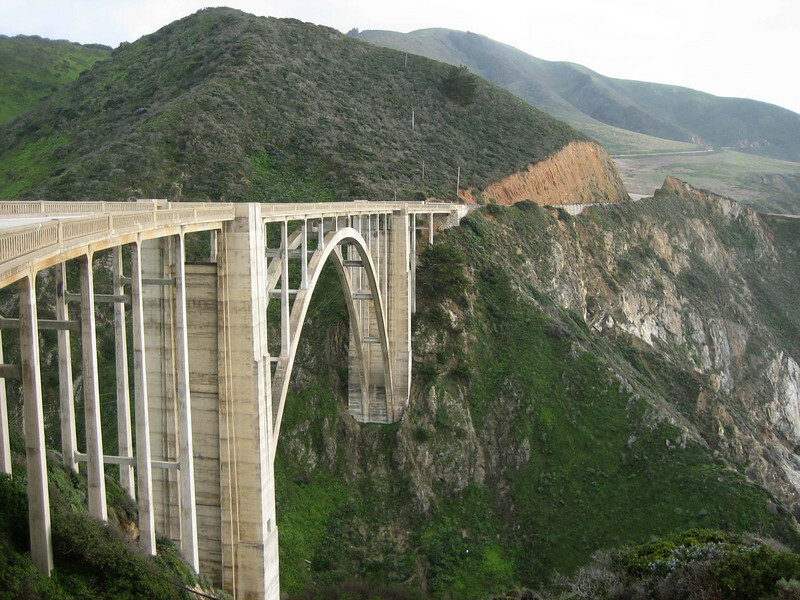 The historic Bixby Bridge, built in 1932. Can’t get tired of this view. 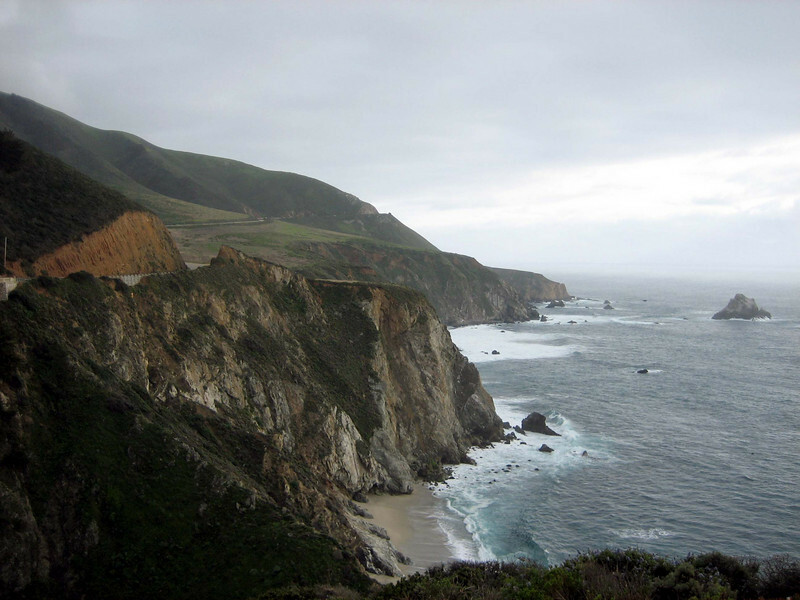 Looking back north with Bixby Bridge in view. The sun coming through the heavy clouds made for wonderful lighting. 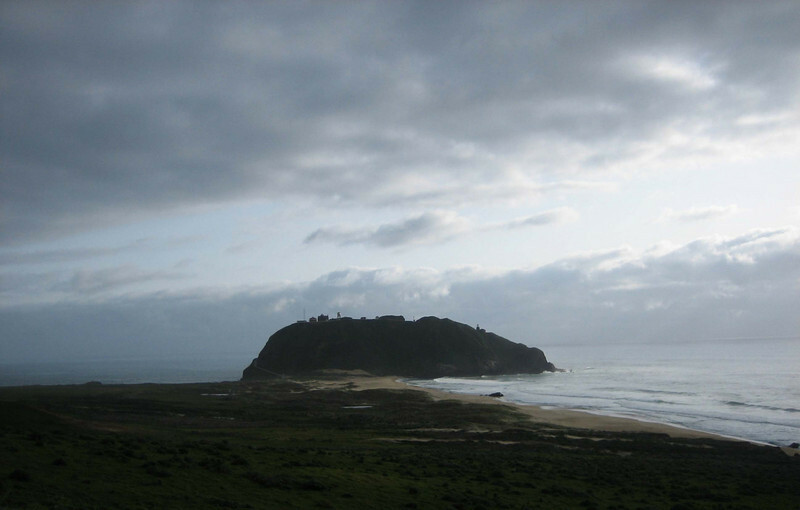 A hilly island right on the coast, near San Simeon. Staying with ADVer John in Paso Robles. 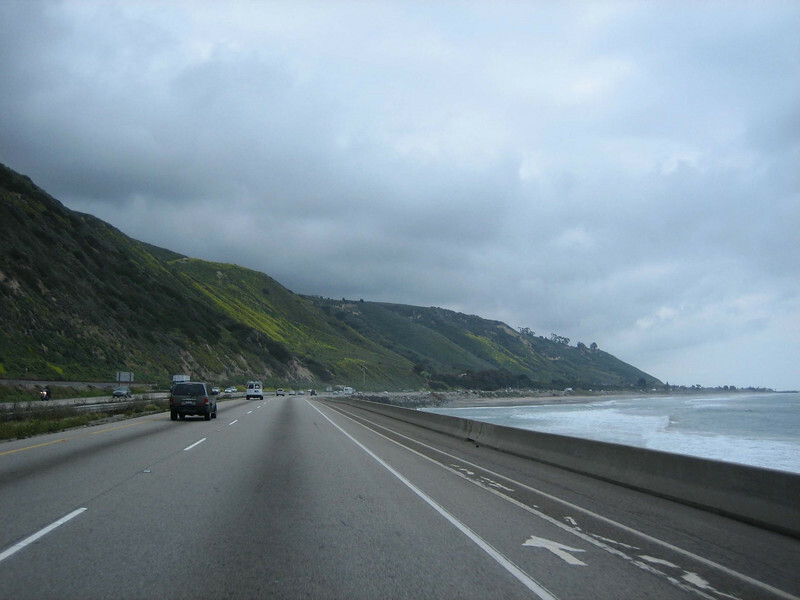 Riding Hwy 101 down the coast towards San Diego. This is just north of Los Angeles. 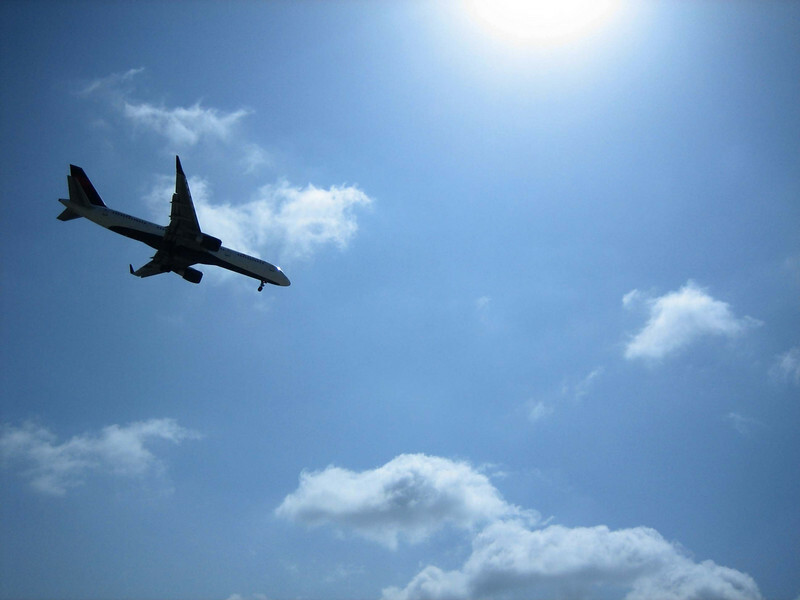 Passing under a Delta 757 landing at the always busy LAX (Los Angeles Airport) (am also an aviation enthusiast). As dreaded as freeway riding is, I’m definitely going to miss how well organized and easy to use the US Interstate system is. 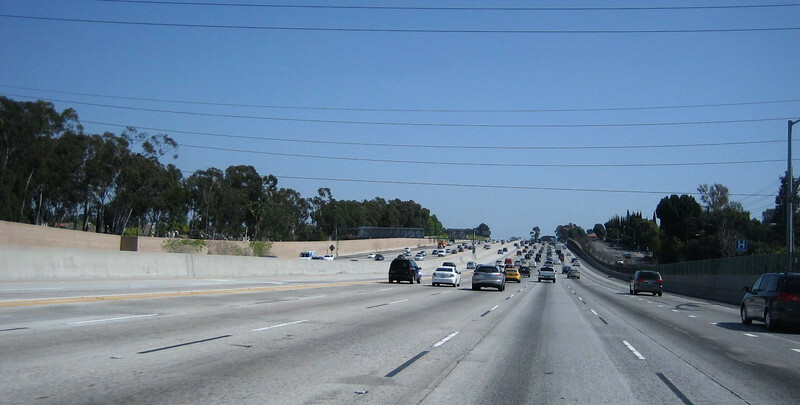 Uggh, this is the widest freeway I’ve ridden, 7 lanes! 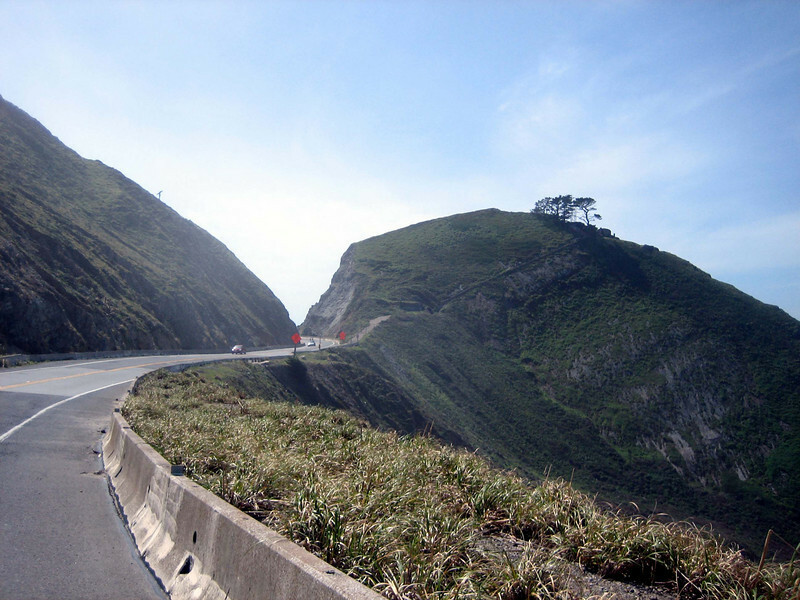 This is in southern LA where I-405 and I-5 meet. 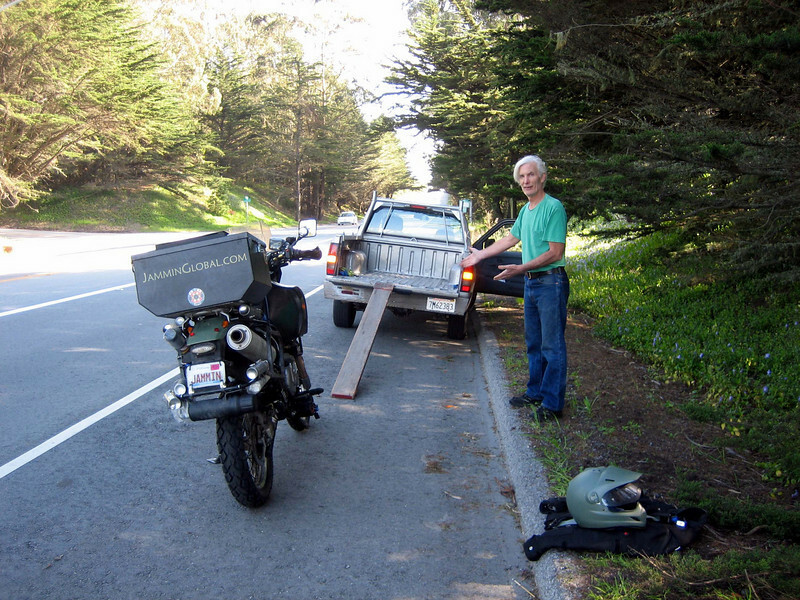 Traffic wasn’t bad, only backed up twice and with bikes being allowed in the carpool lane and with lane-splitting, it was no problem. 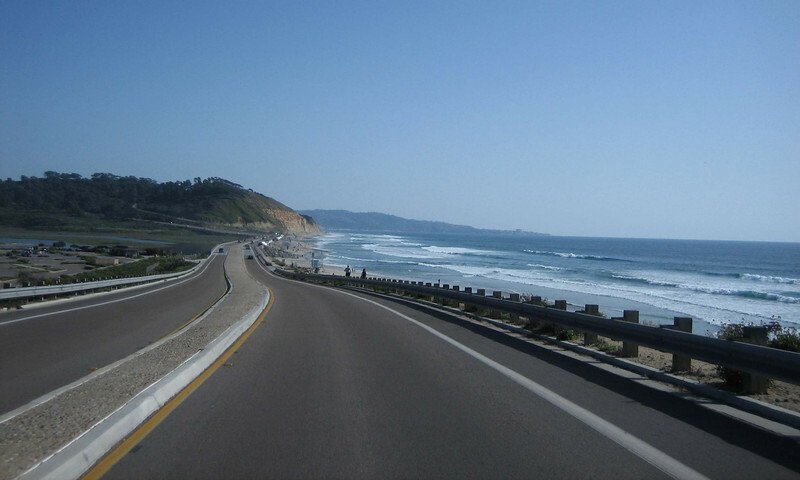 Catching Hwy 101 back on the coast near San Diego. I was heading to meet my friend Ruben who moved out from Chicago. 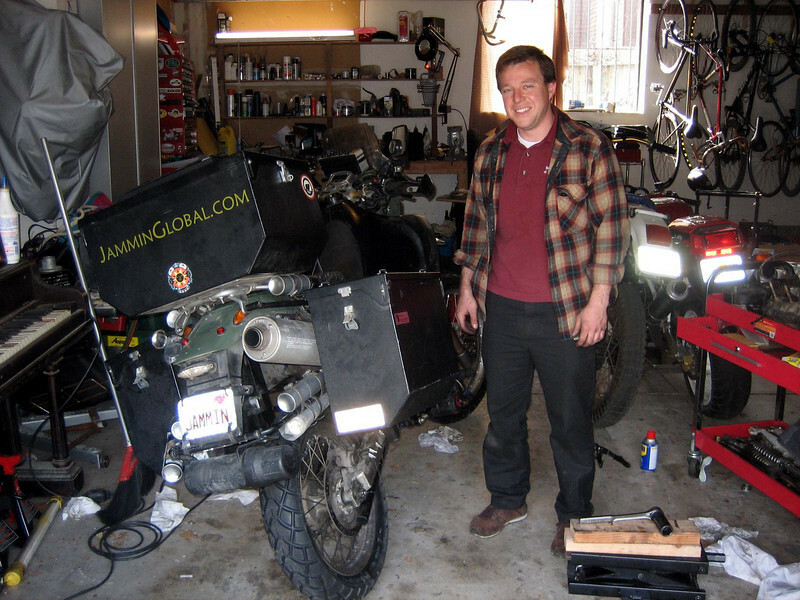 Mike came forward on ADVrider after hearing my engine issues and offered to help with the engine swap. He was only about 10 mins away from Jul’s place, so I moved my DR there and then went down to San Jose to pick up Shridhar’s DR from a shop there. He had some carb issues but otherwise the engine was known to be running good. 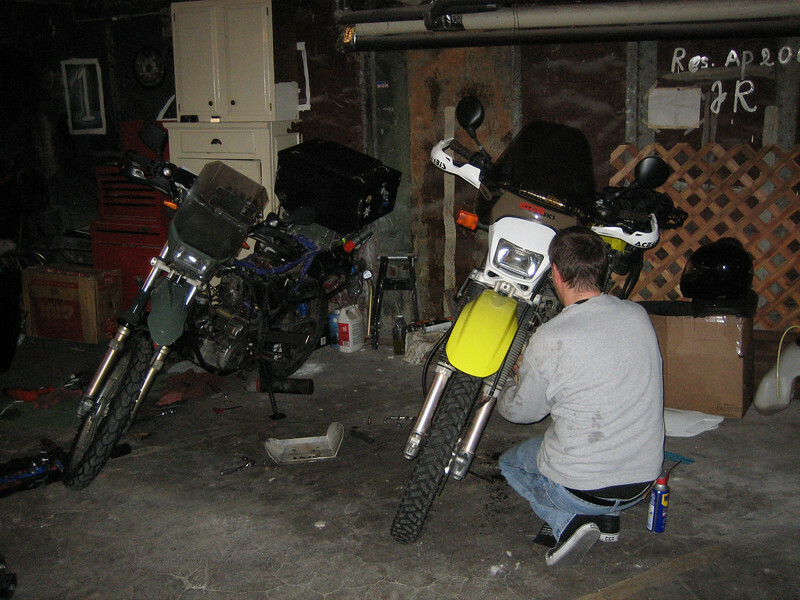 Mike and I worked straight through the evening to complete the engine swap. We started about 6 pm and had both motors pulled by about 9 pm. After a good dinner break, we got to putting the new motor in my DR and fired it up at around 3 am. 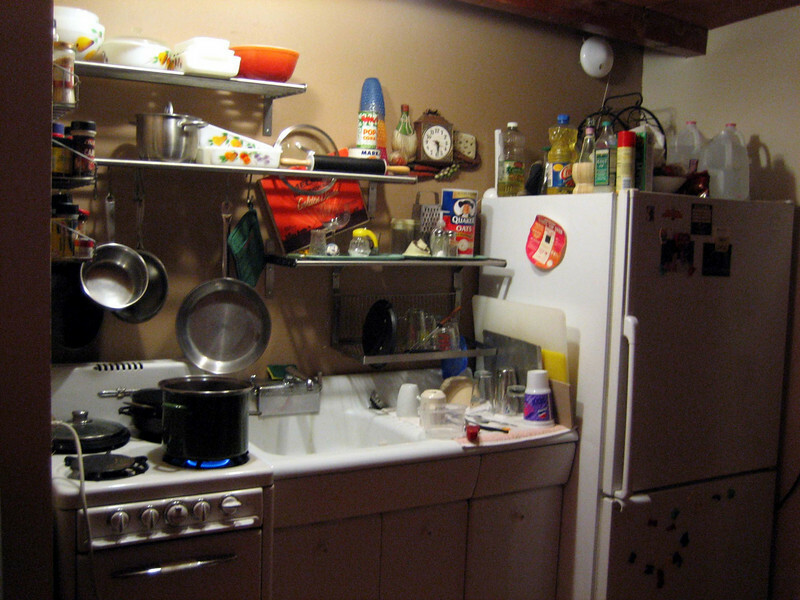 We wrenched diligently with no rush and made no mistakes. It was satisfying to have the motor fire up on the first try. However, she wasn’t idling too well and I took her to Werkstatt the next morning to have them look her over and Daniel there showed me the Air Speed Screw that I didn’t know about, which was out too far making the air/fuel mixture too rich. 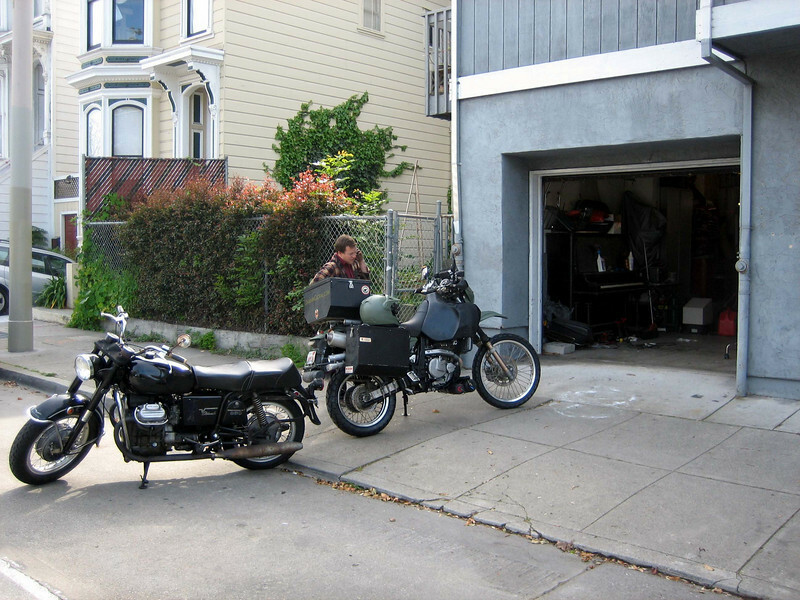 With a few adjustments, sanDRina was running smooth and I was on my way out of San Francisco. 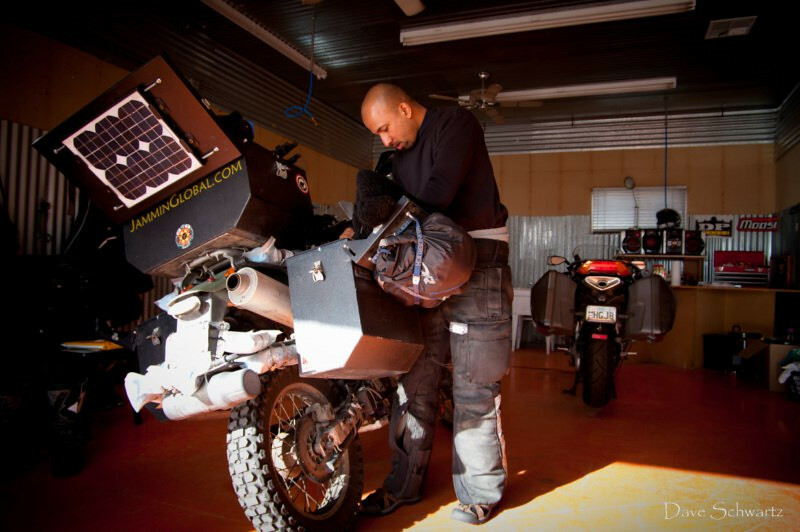 Mike working on Shirdhar’s bike. 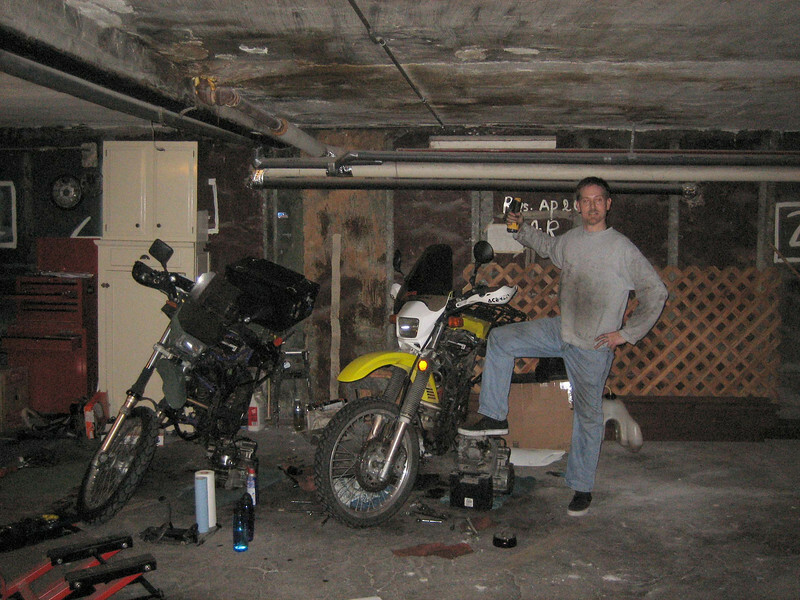 His apartment building came with access to this big underground garage area with enough space to work on the bikes. Both the motors out of the frames. Goodbye original engine. Sorry to end your life so soon, but sounds like you’ll get a second lease pretty soon (Procycle is taking this lump off my hands). 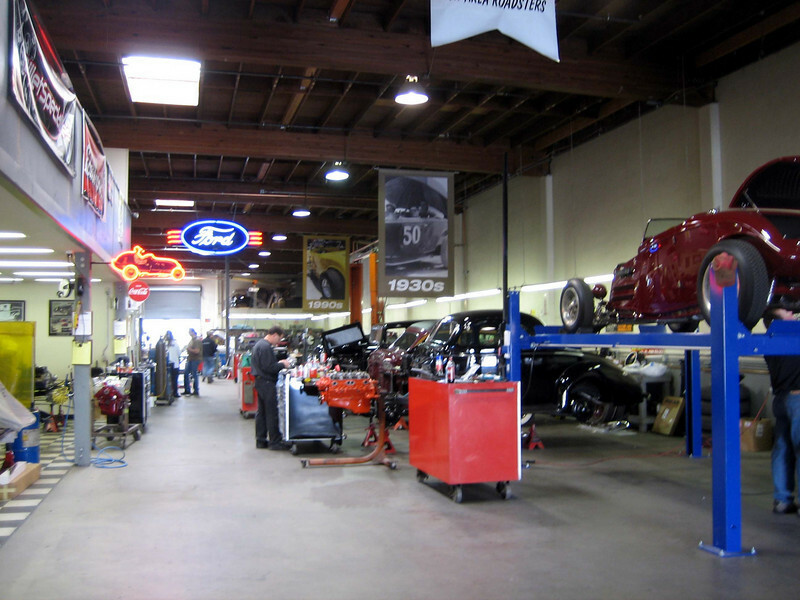 Getting the donor motor in my frame. We both gained more experience in DR engine swaps this night. 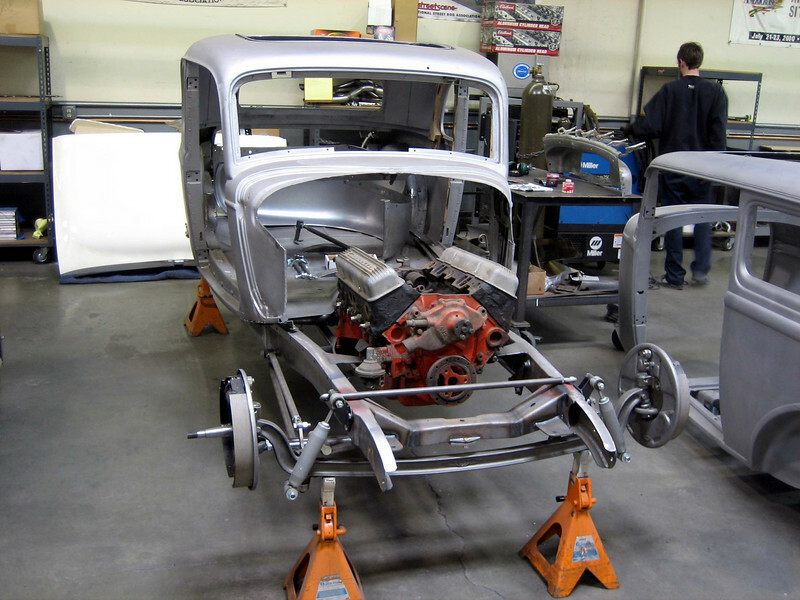 Back in the motor through the left side and then turn in once it’s in the frame and then line up the engine mounts. Easy as pie. Getting friendly with the new motor. She fired up on the first shot. Yeah baby, sanDRina rides again! Taking her to Werkstatt to fine tune the idle and air/fuel mixture settings. 15 mins worth of their time and sanDRina was purring smoothly. Time to head out of San Francisco. It was a good two weeks spent here and I enjoyed the city, but iching to get further south. On my way out of San Francisco the first time I realized I didnt take too many pictures of the city and snapped some off on Van Ness street. 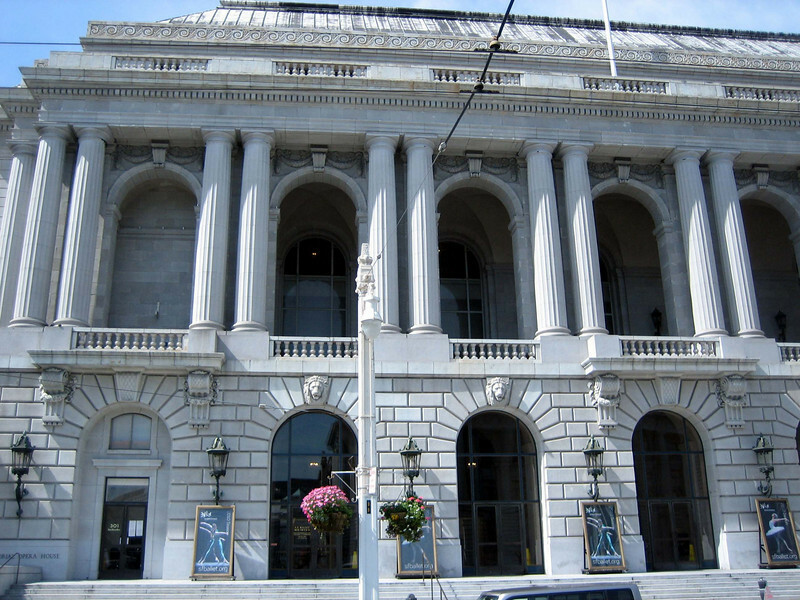 The War Memorial Opera House. 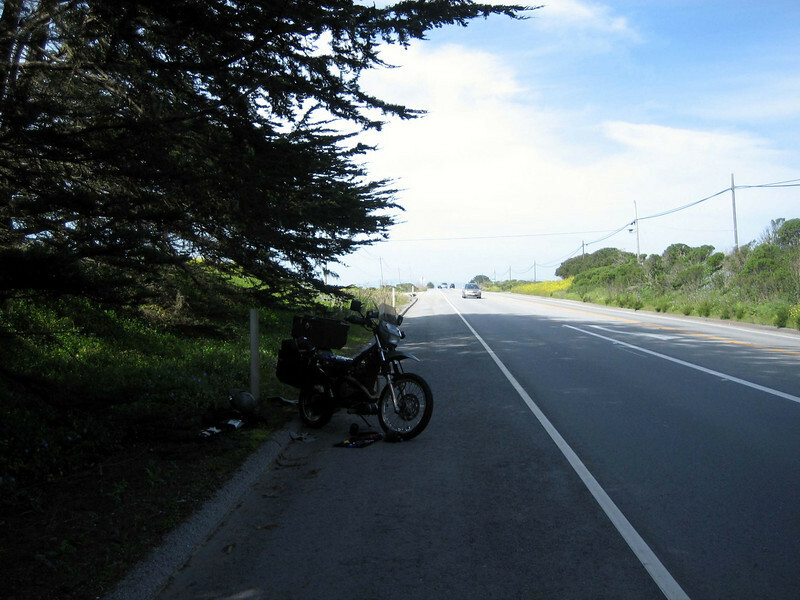 just south of Half Moon Bay, engine goes quiet and I lose all drive. Starter motor would spin but no turn over of the crank. Looked insde the vavle area and saw the cam chain not moving and traced back with the help of my mechanic friend Gus on the phone that it was due to my miss-assembly of the cam chain tensioner when I was servicing the engine. Big oopsy. Lots of engine damage. 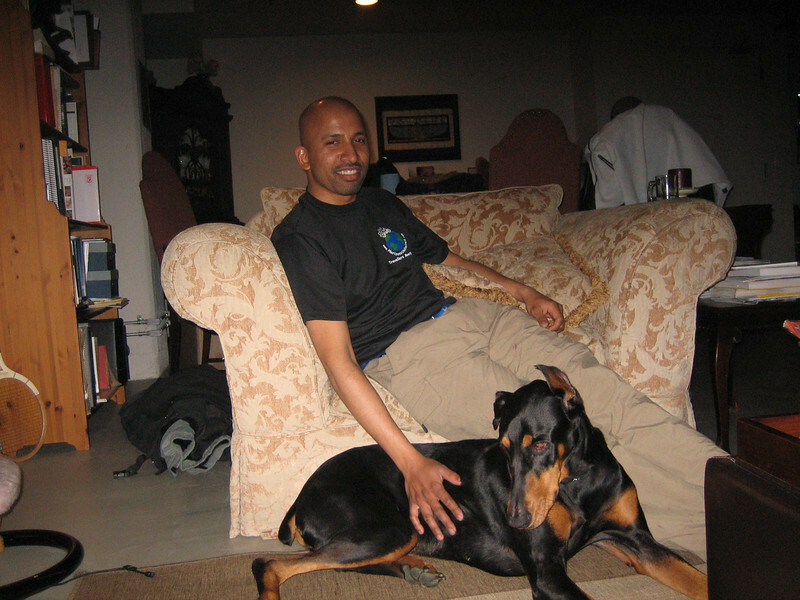 Shridhar called his friend Jul (Yule) to come to the rescue and take me back to San Francisco to figure out what to do. He’s a bike guy, as well. The next morning, I took the bike to Werkstatt to get their opinion on how serious the damage was and they recommended a new engine instead of trying to fix this one. 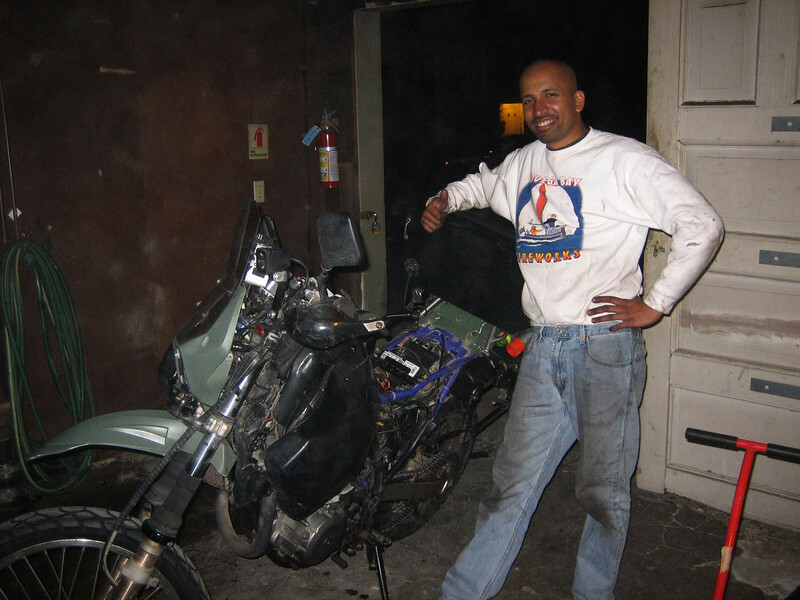 Shridhar agreed to part with his DR since he wasn’t riding it much. 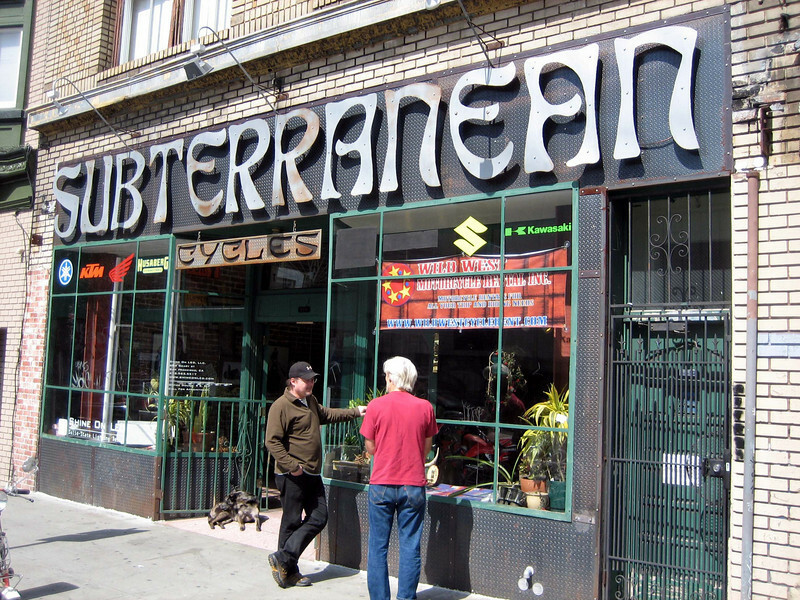 The bike was stuck in a shop, so in the down time, Jul took me around to see the other bike shops in town. This is Subterranean. 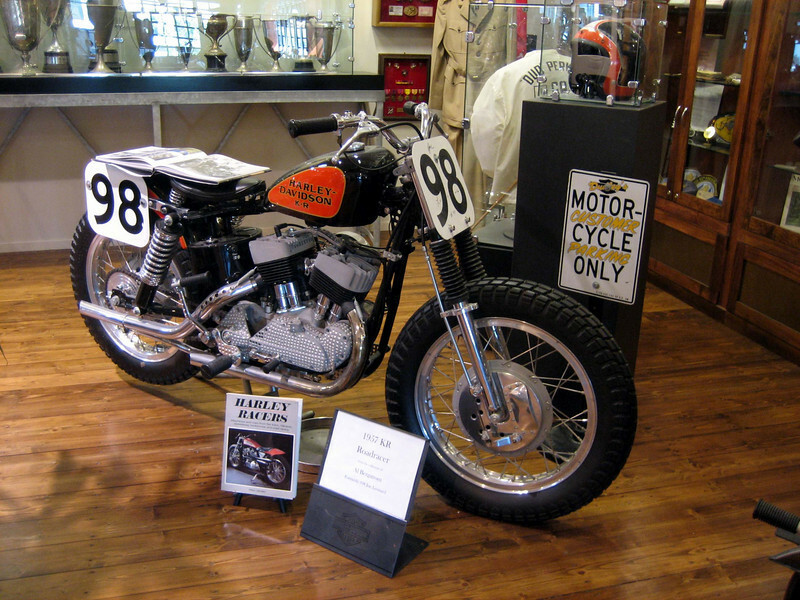 We finished the bike tour with a visit to Dudley Perkins Harley-Davidson, a very prominent Harler dealer with a few bikes there setup as museum pieces. This is a 1957 KR Roadracer. 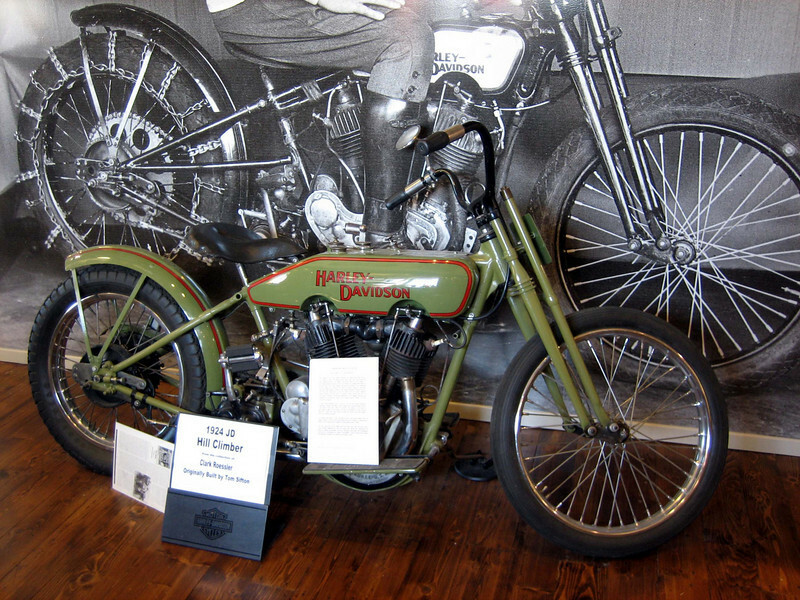 A 1924 JD Harley-Davidson. 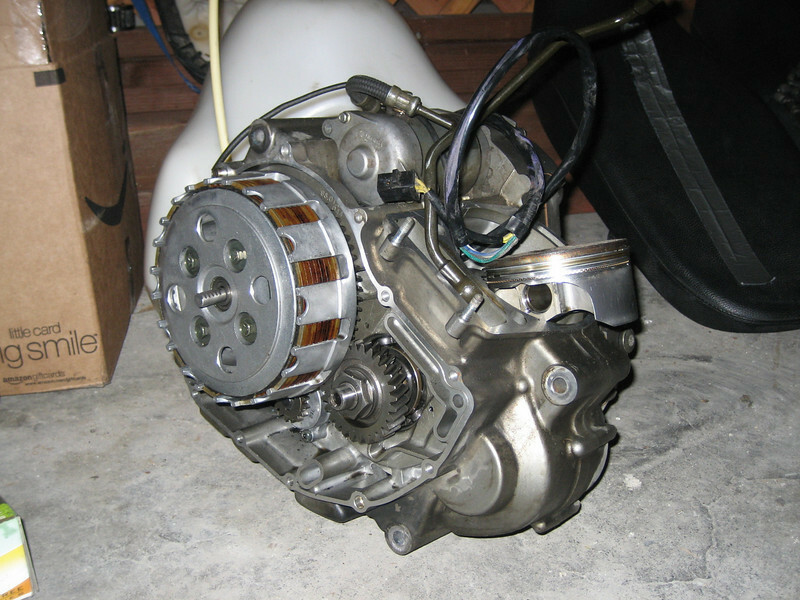 The 1st twin cam hill climber engine. Built my Tom Sifton. 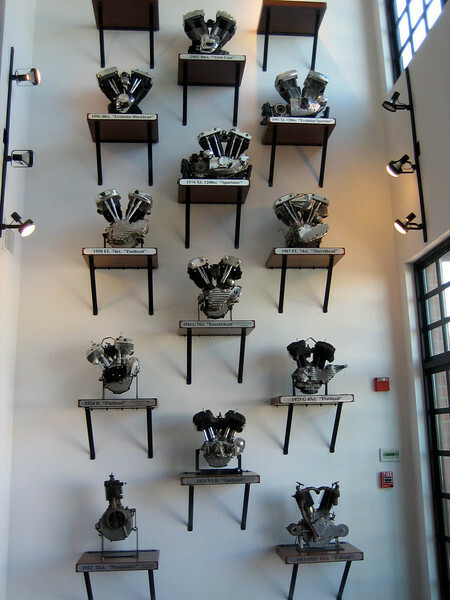 A 2 storey wall of Harley engine history. 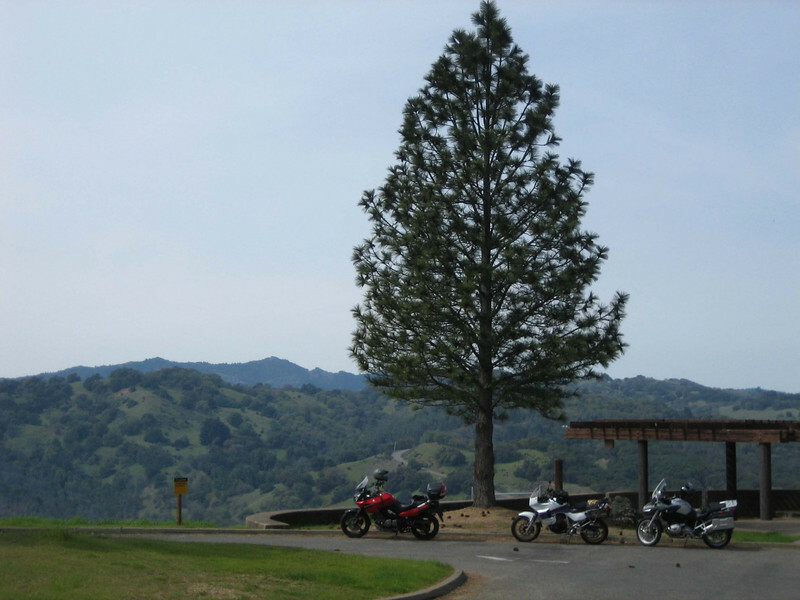 Took a nice ride north of the Bay Area with Jul and his riding friends and this is at the Sonoma Lake overlook. Shridhar lent me his Suzuki V-Strom since he was out of town that weekend. Nice bike to ride. 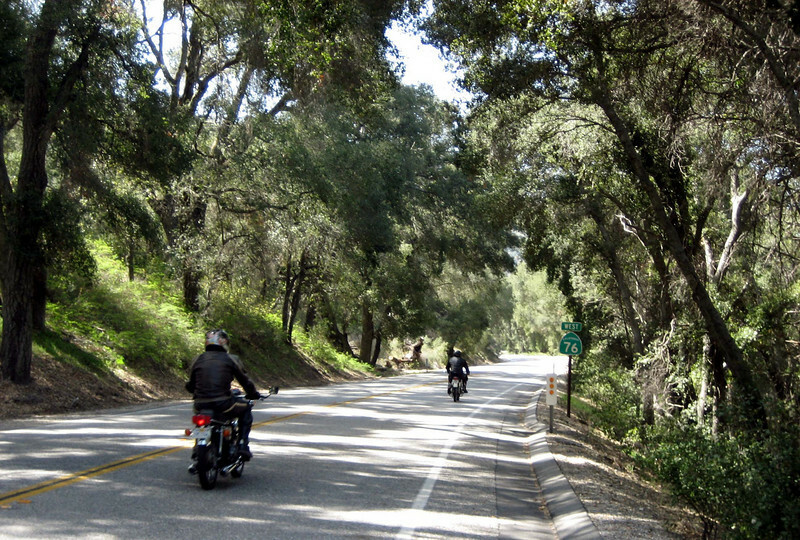 Riding the awesome Skaggs Springs Road and other twisties in the area. 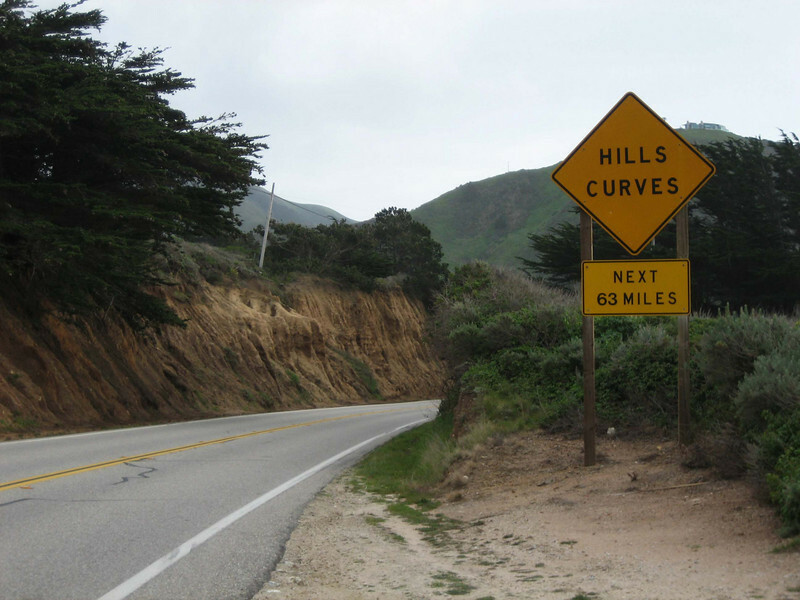 Lots of rough, tight, technical turns. 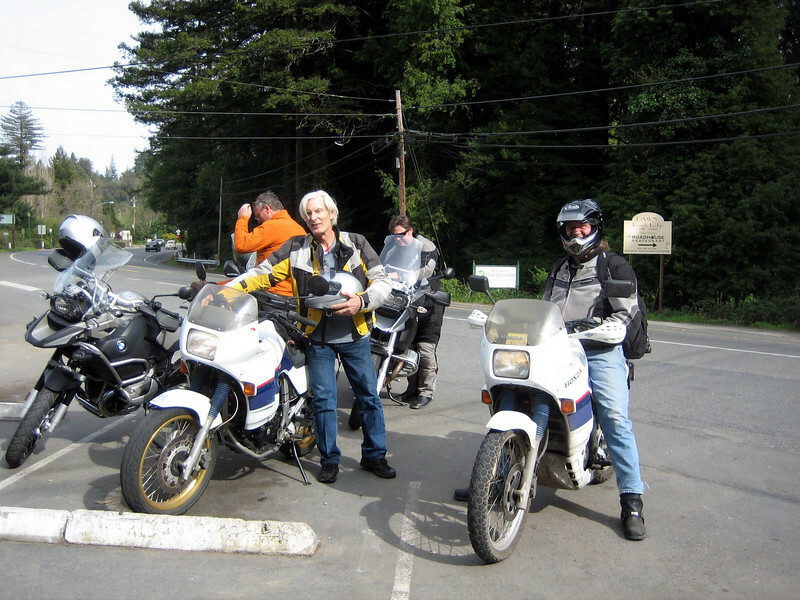 During our lunch stop in Guerneville, a second Honda Trans Alp pulls up after seeing Jul’s modified Trans Alp. The second owner said he had never seen another TA out on the road. 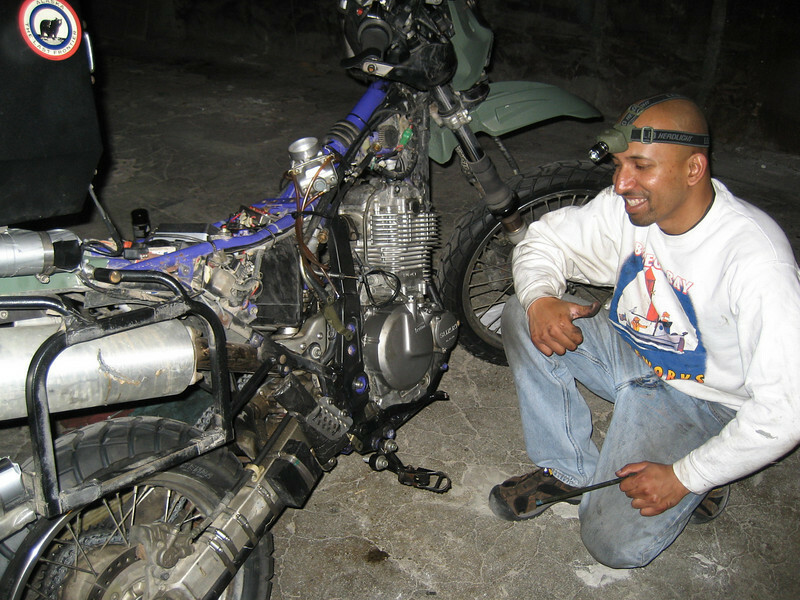 Jul is quite the bike modifyer and has a motor from a Honda Nighthawk, I think 750 in there and calls his creation the Trans-hawk. 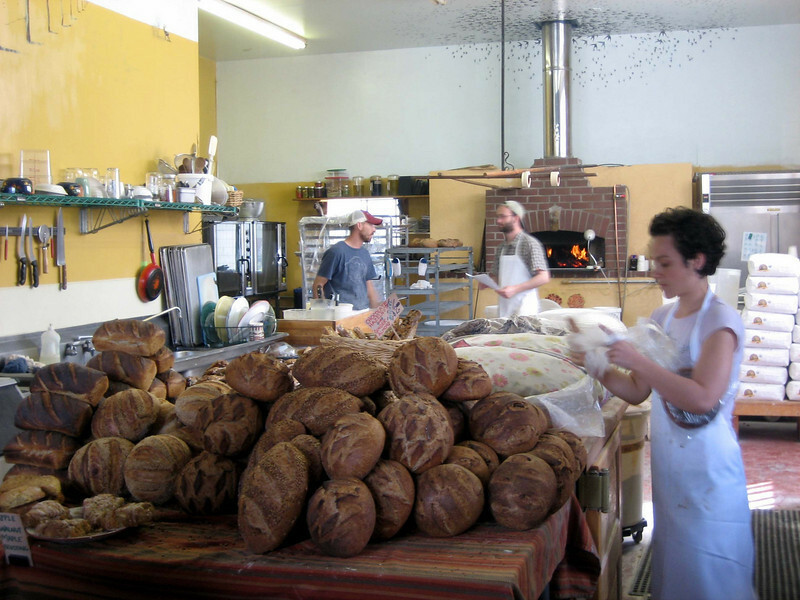 Taking a coffee break at Wild Flour Bread Bakery near Occidental, where they make some tasy artisan bread. Jul and his friend Riccardo, who’s studied Mexican law and told me to contact him for any legal help down there. 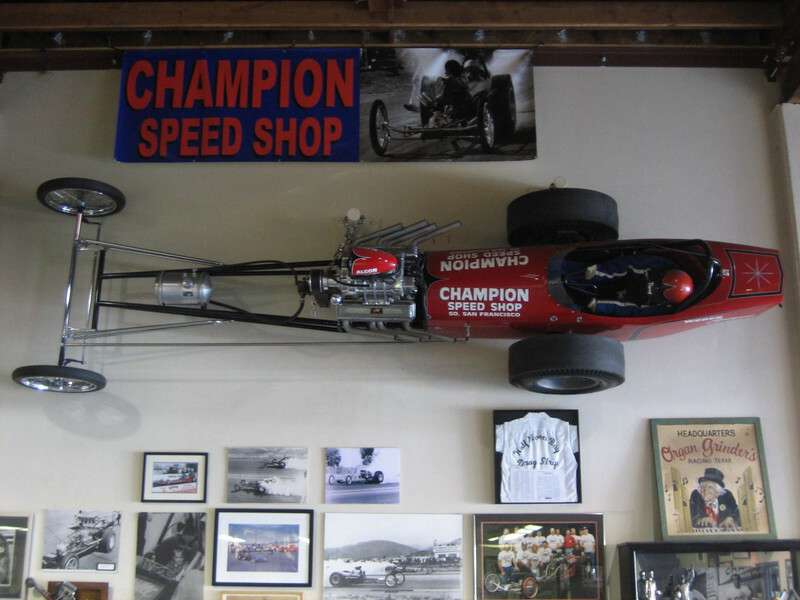 Stopping by Roy Brizio’s shop, a well-known custom hod rod car builder. The shop is open for anyone to walk through. Lots of famed history here. A near-finished car (someone help me identify what kind this is). A little earlier in the assembly stage: engine in the frame. 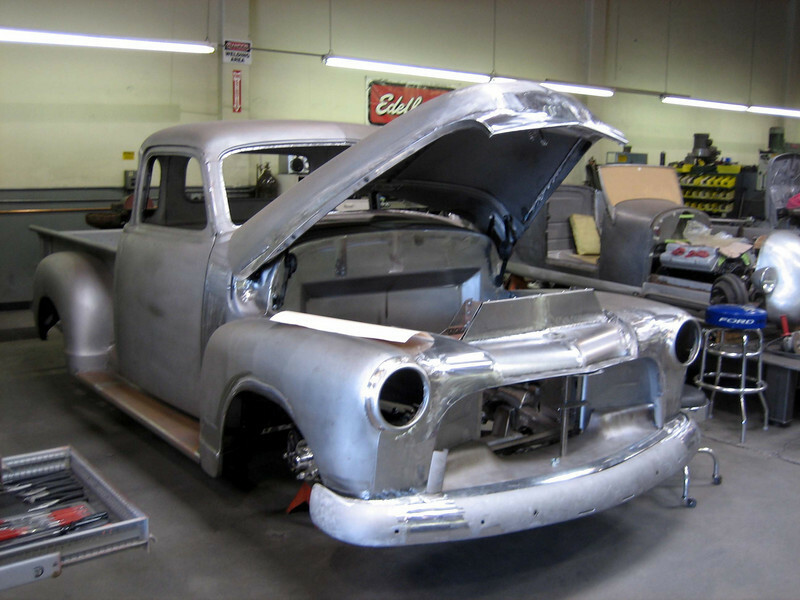 A classic pickup truck. And Jul said they were making their own stamped aluminum body parts. On the morning of March 5th, I said my good byes to my shelter and life here in Chicago and as I rolled out of the garage one last time, the butterflies in me were free and I was comfortable and excited knowing that there was no turning back to this previous life and I had taken a step into a new chapter. Even though temperatures were about 22F in the morning, I knew things would warm up as I was heading straight south out of Illinois to Memphis. I was riding around the cold and avoiding crossing the high passes of the Rockies because there was still snow up there. 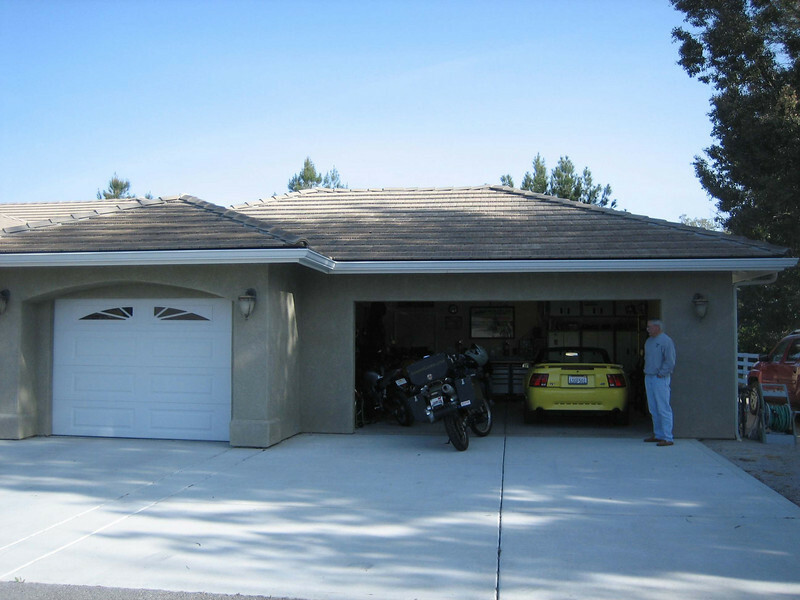 The plan for the first leg was to head to San Francisco to regroup at my friend Shridhar’s place. 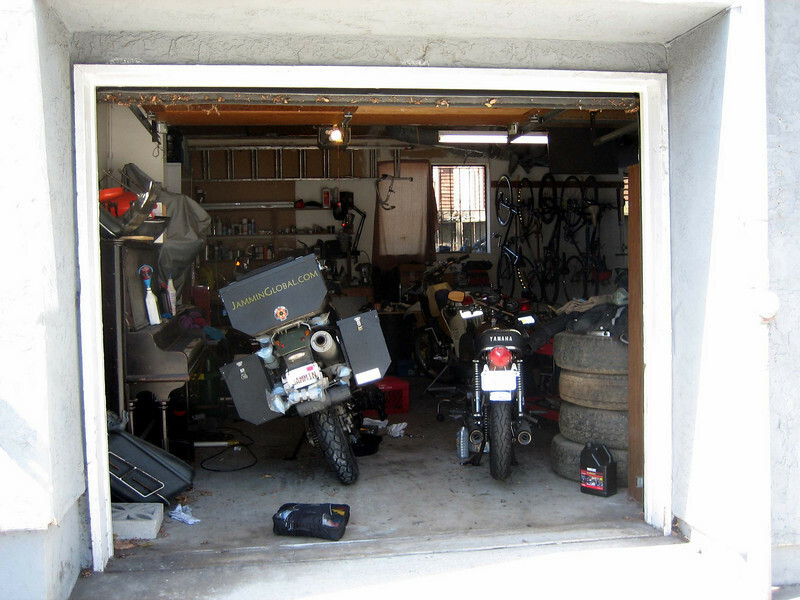 We both connected after my Mexico trip and have been discussing this trip since then and I figured I needed a forward staging location, as such, from Chicago so that if something wasn’t working on the bike, I could rearrange things before heading for the border. I also shipped a few last minute things to Shridhar that wouldn’t have arrived in time. 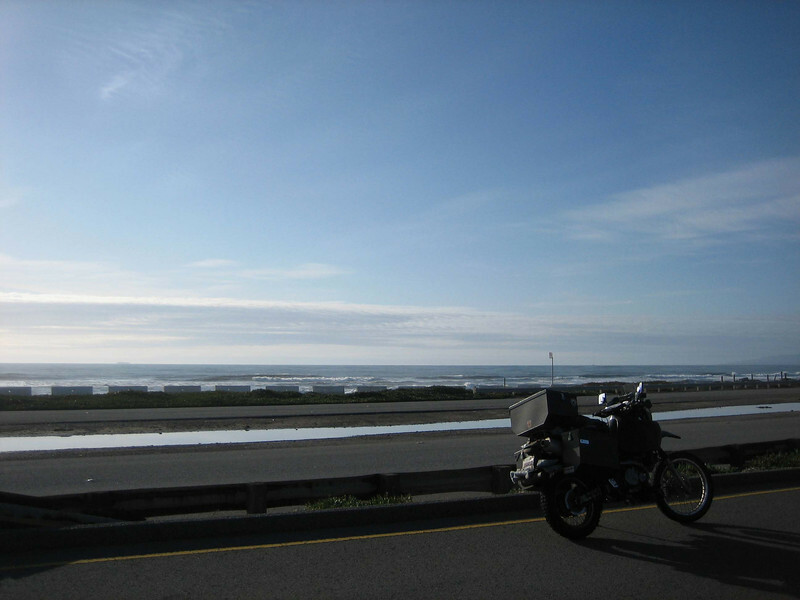 The ride wasn’t too cold and I was happy to be jammin to my tunes, on my motorcycle, heading south. Stayed with Gabe in Memphis on the first night through CouchSurfing and we went out for a nice dinner on Balboa in the downtown area. I’m going to miss the Mid-West. 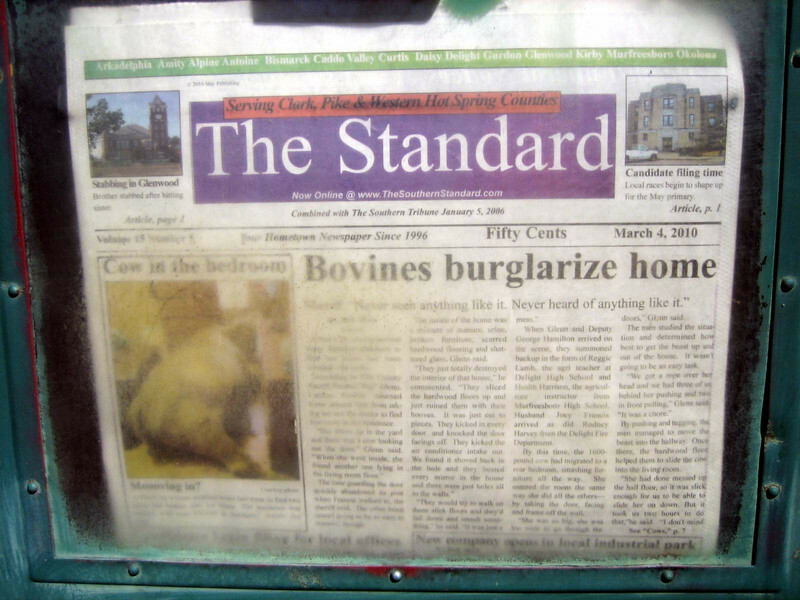 Check out the crazy headline, haha. Somewhere in Arkansas. 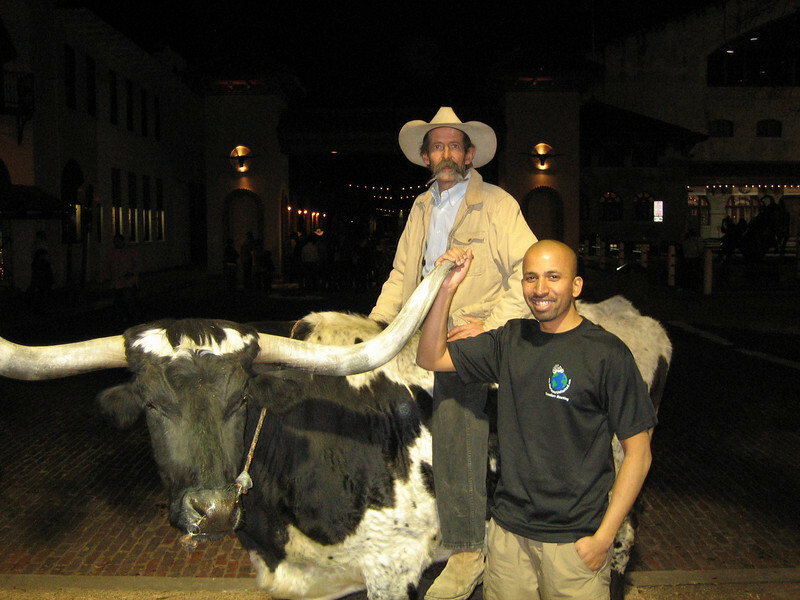 Seeing my first long horn in Forth Worth, Texas. 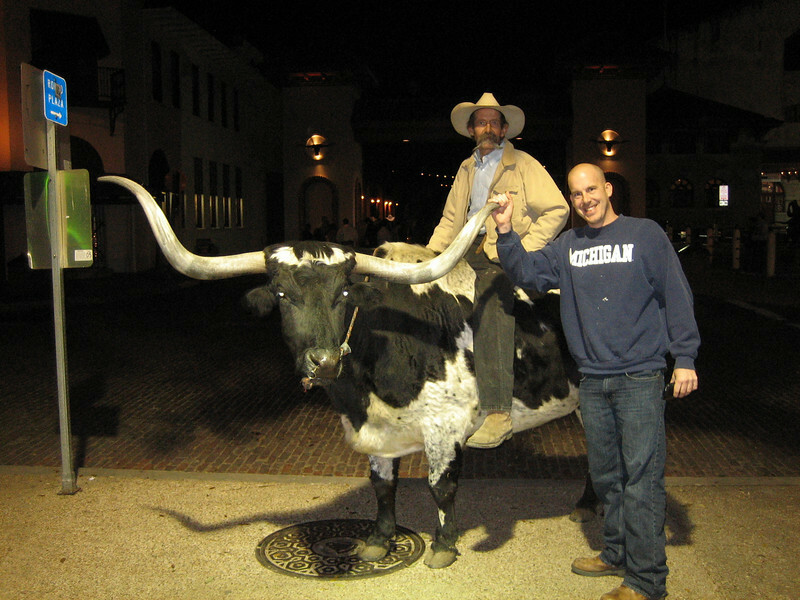 Even though I lived just a few hours south while going to Texas A&M, never saw a proper long horn. James, my host from ADV (texasyeti) with the full horns. 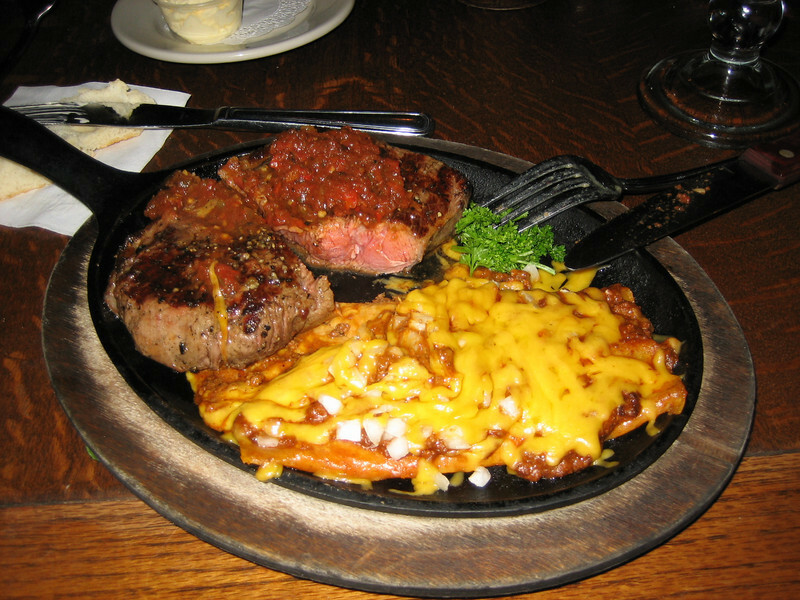 He treated me out to an awesome steak dinner at the revived stockyard and I like it rare. 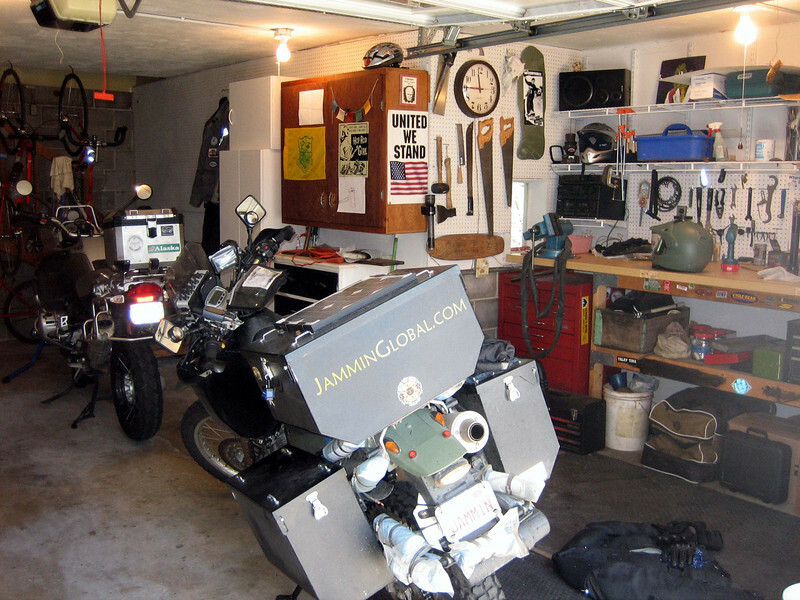 James has a few bikes and here is a classic BMW Dakar. And he’s a dog person. Dog people are always good people in my books. Cute beagle. His other dog is this cute pit bull, Gidget. 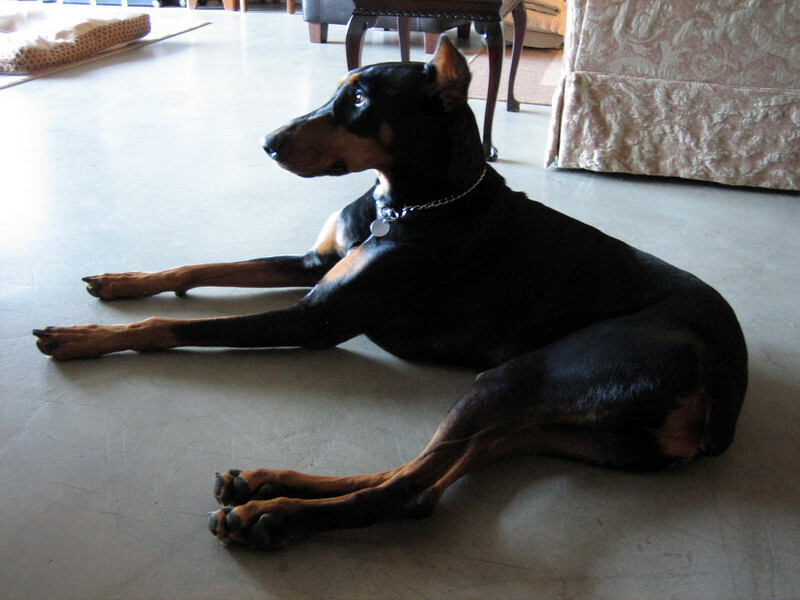 They’re such lovely dogs and too bad they suffer a bad reputation. 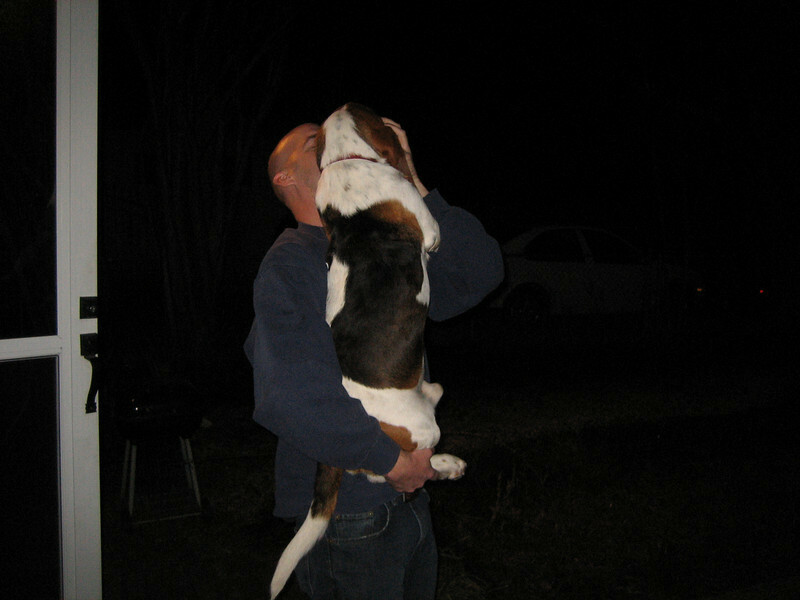 I lived with one for a while that a housemate had and really enjoyed how smart and lovable those dogs are. Pouring over a map to see what excitement lay ahead as I went through West Texas heading to Las Cruces. Riding into the sun near El Paso, where the road finally got interesting as elevation climbed and the road twisted a bit. 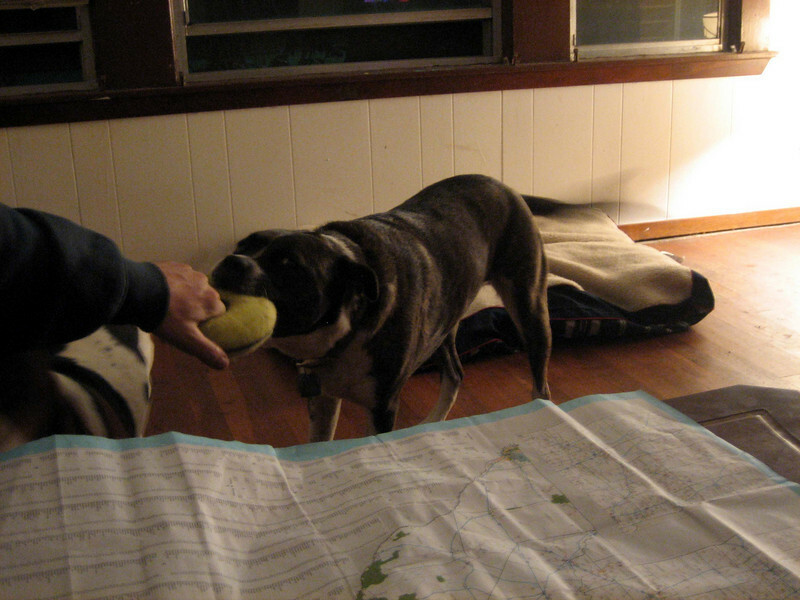 Staying with John from ADV (barko1) in Las Cruces. 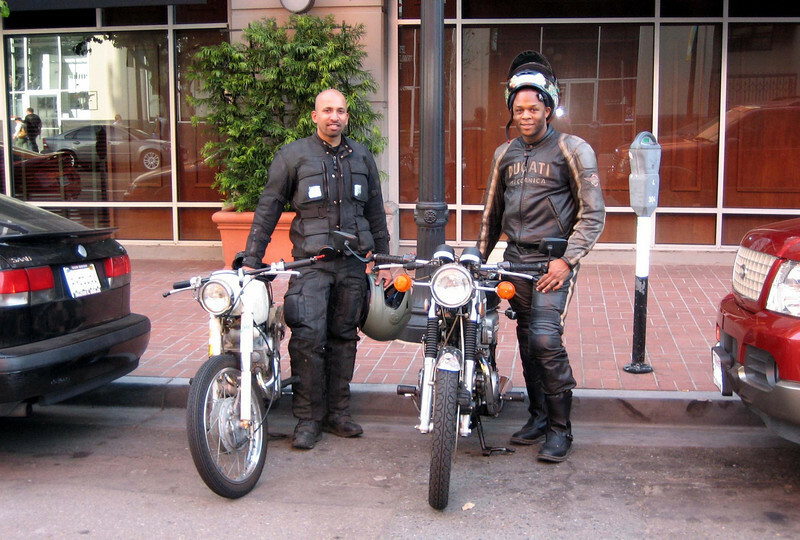 He also belongs to the purple frame DR club 🙂 And he was actually flying out the next day to Australia to borrow a DR from an ADV member to ride it across from Sydney to Perth. Heading out into 40F temps and a strong head wind. Just my luck that when I get to the lower latitudes a cold spell swung into place. The head winds were quite strong through Arizona and I figured it was training for the winds of Patagonia. Staying with Dave from ADV (dave6253) in Phoenix. 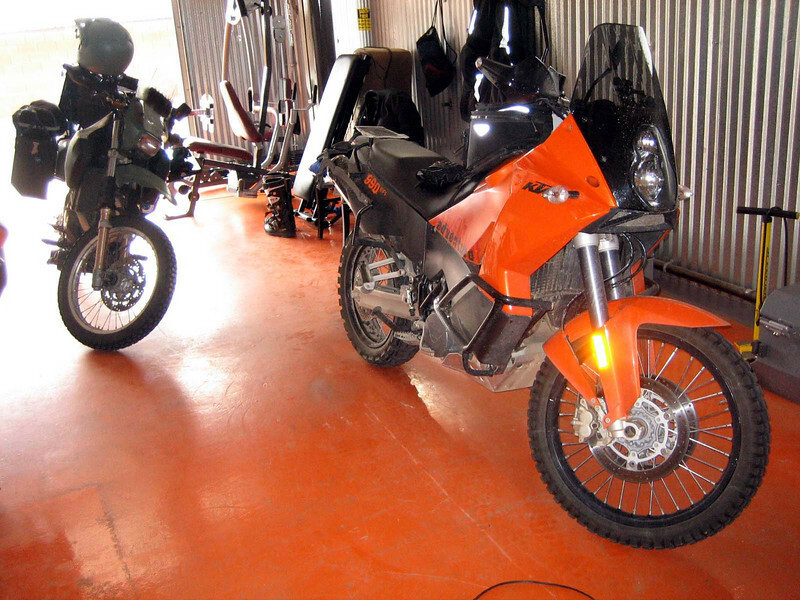 He’s got a KTM 990 Adventure and an Aprillia sport touring bike. He’s a prolific ride report poster on ADV and I got some photo editing tips from him (Adobe Lightroom). Packing up the bike in the morning. Here comes living out of a pannier for the next few years. 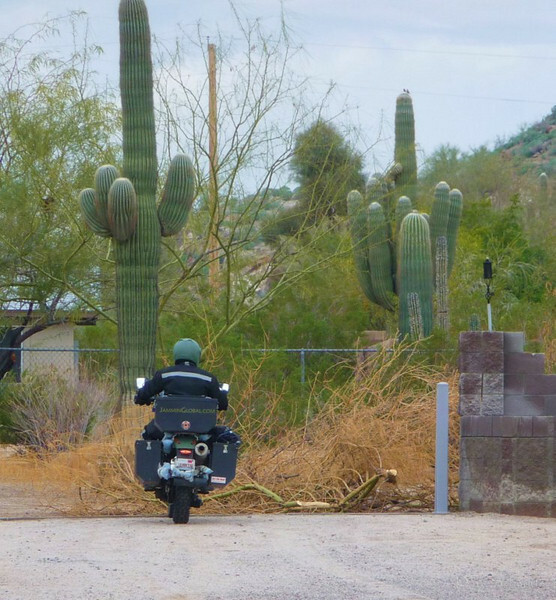 Leaving Dave’s house under the auspiciousness of grand saguaro cacti. Taking US-60 across west Arizona towards California. Wasn’t that exciting but had to change it up from riding so much Interstate. Battling head winds all day long. 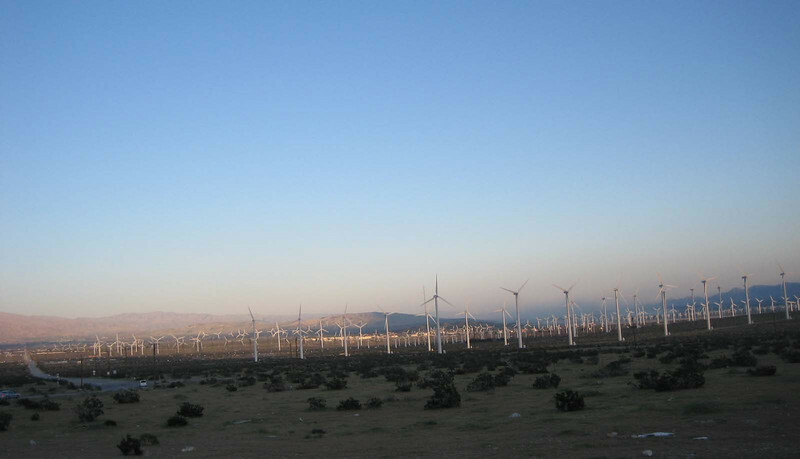 At least all that wind was being put to good use here in eastern California at this massive sprawling wind farm. There must’ve been over a hundred windmill towers and they were all spinning fast. 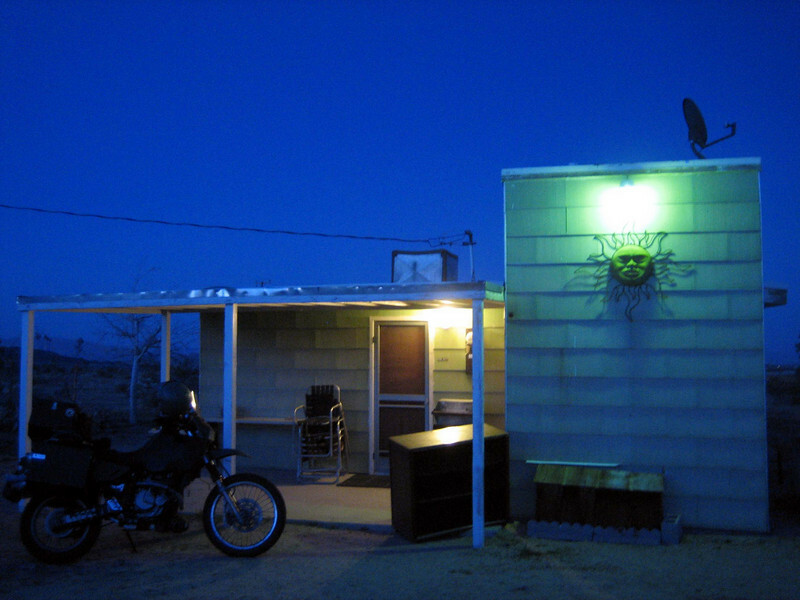 Staying at David from ADV (scorpion)’s lair in the high desert outside Los Angeles in Landers. Cooking up a spaghetti and pinto bean meal after a chilly and windy day. 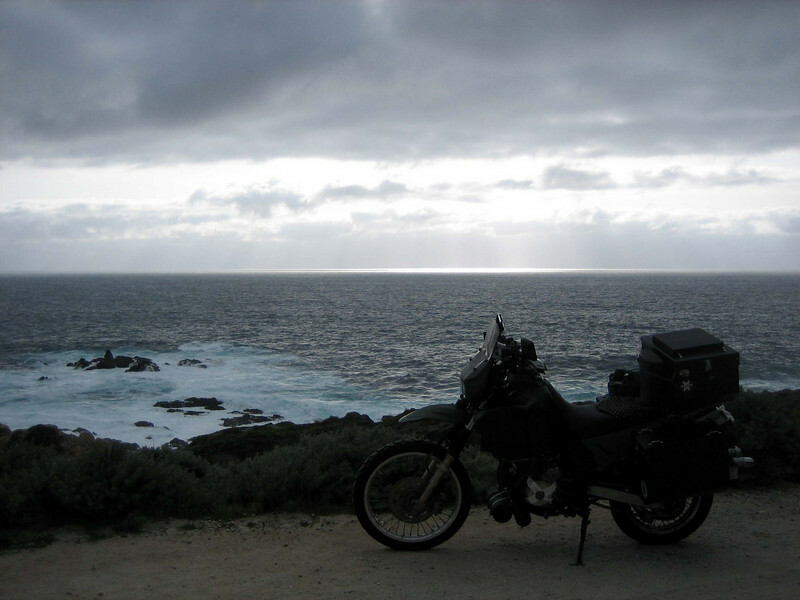 Winds were battling hard all night and I got up once to make sure the bike hadn’t been blown over. 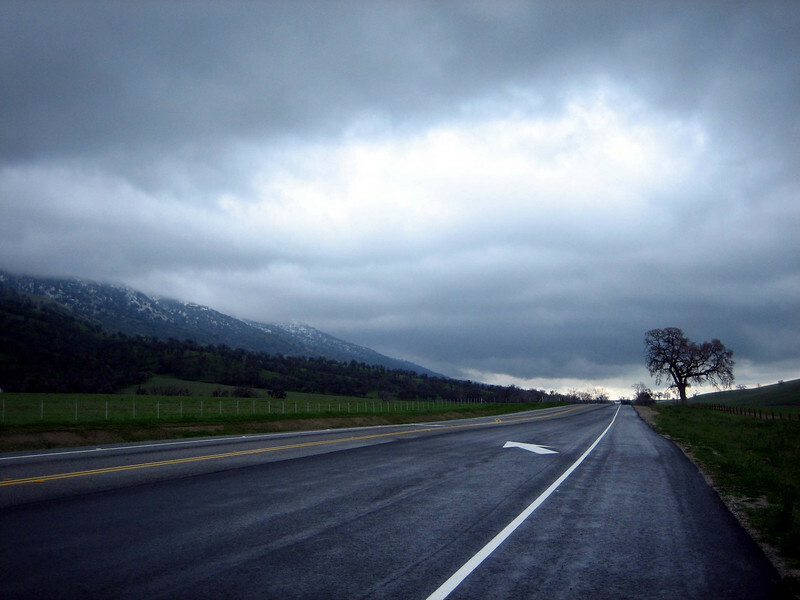 Heading north through California up to the Bay Area. I didn’t realize the pass between Mojave and Bakersfield would be as cold as it was. It was snowing and sleeting at just 4,000 ft. 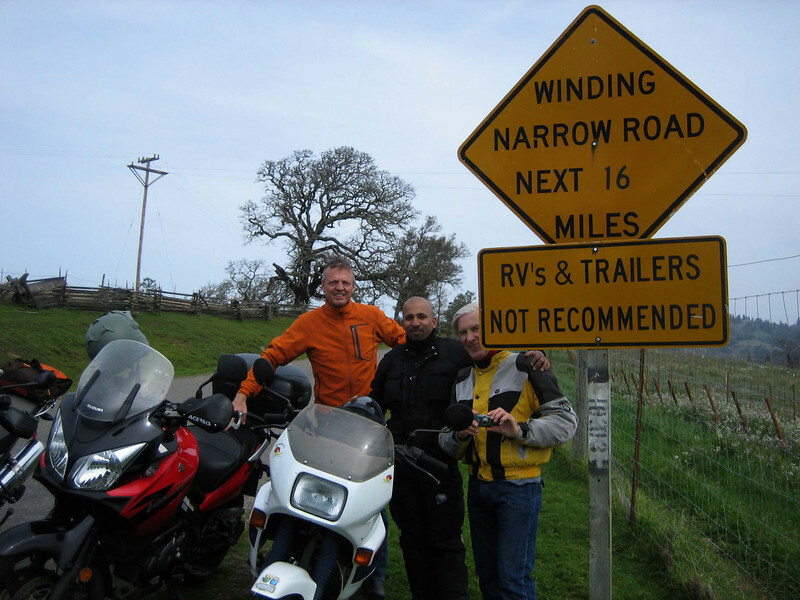 Staying with Chris in San Jose, whom I met and rode with on my Alaska trip. He recently moved into this great location right on top of a small hill. He keeps hassling me to just get a BMW and be done with it, haha. 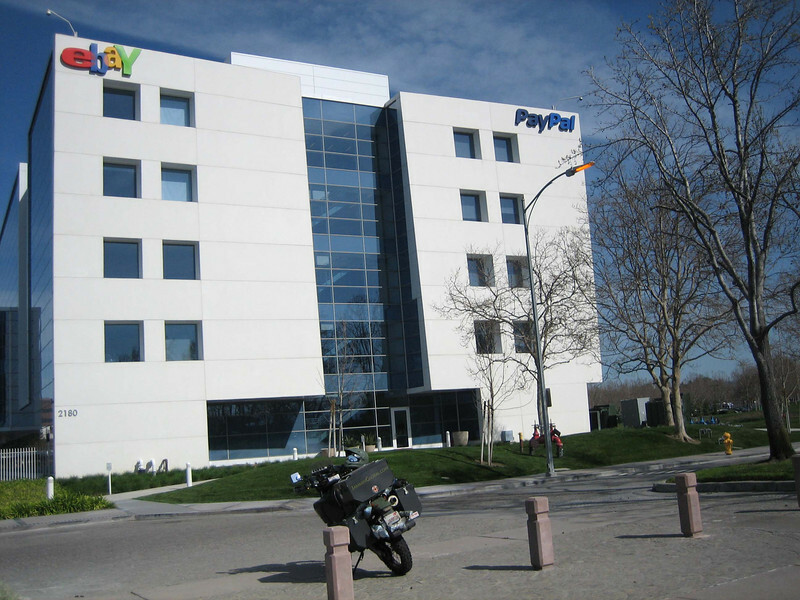 Meeting up with Shridhar in Silicone Valley, where he works for Paypal now. Had lunch that day with Rajen, an old high school friend who works for Yahoo there. 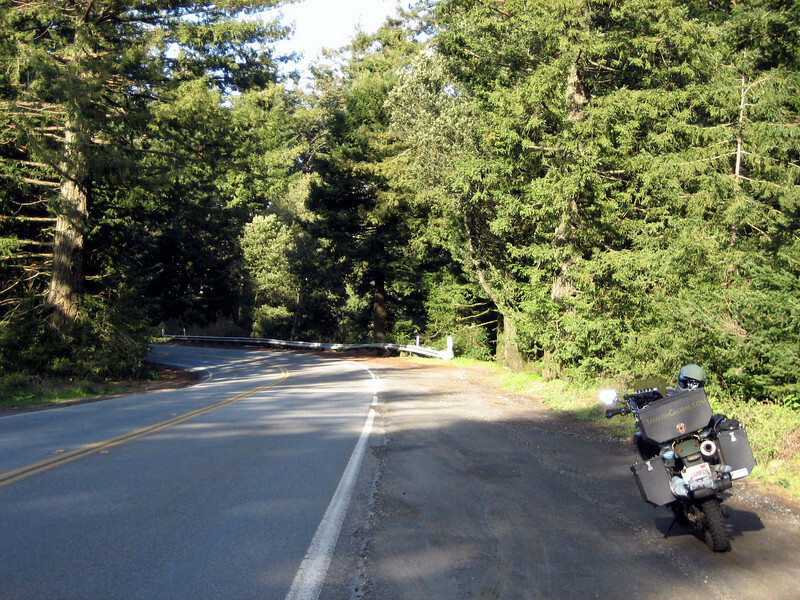 Riding the beautiful Skyline Drive through the hills from San Jose to San Francisco. And finally making it to the west coast and the Pacific Ocean. 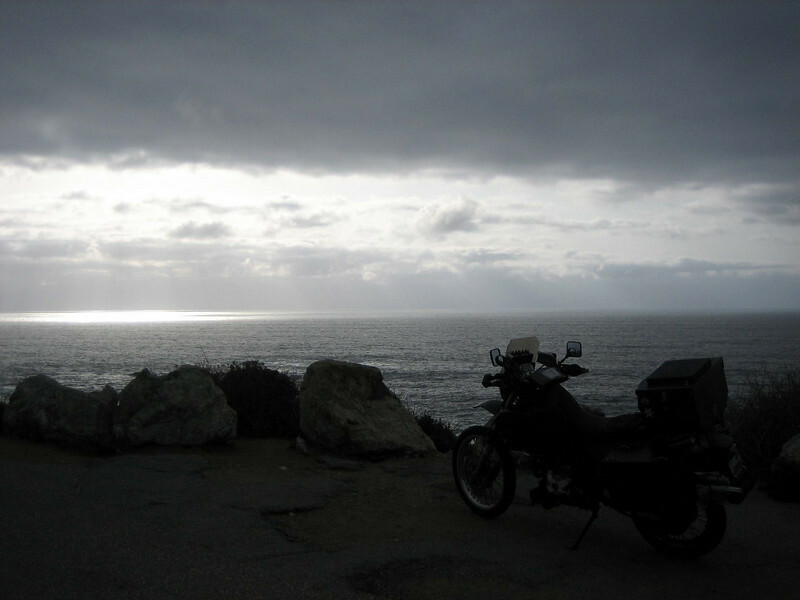 I’m going to be seeing a lot of her as I head down south and looking forward to it as I just love coastal riding; something about all that water and vastness. I took a couple days off the bike to catch up on things that I didn’t get done before heading out and servicing the bike at a mechanic friend’s place of Shridhar. 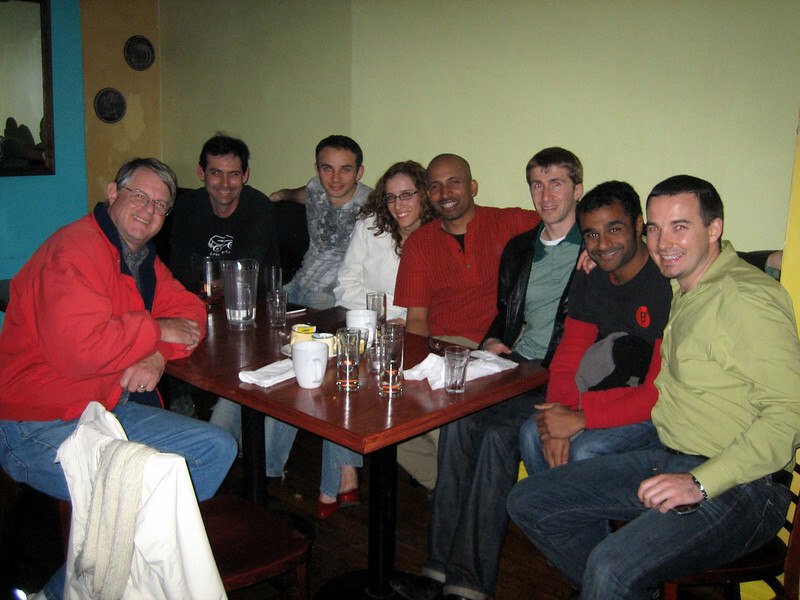 Having dinner at Charanga (cuban, latin) and meeting up with old friends and new friends from ADV. 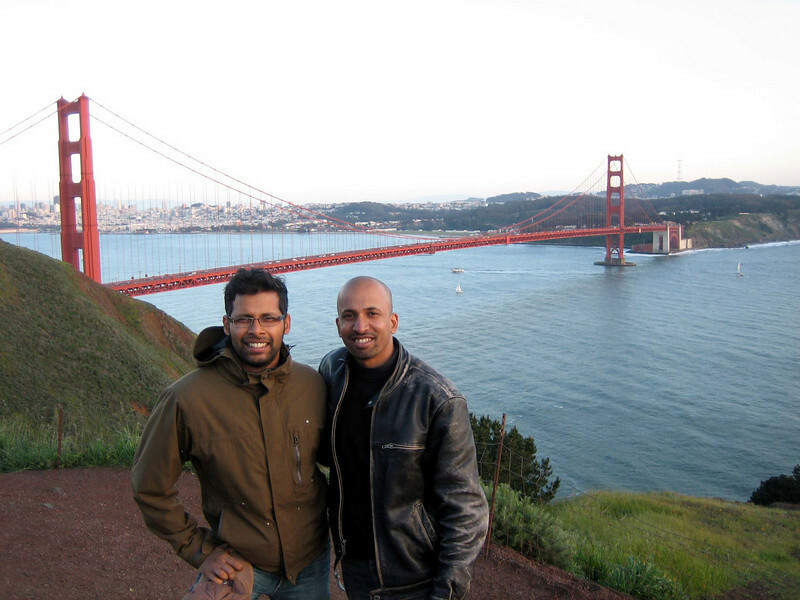 Shridhar and I doing the touristy things. But hey, it’s a beautiful bridge. 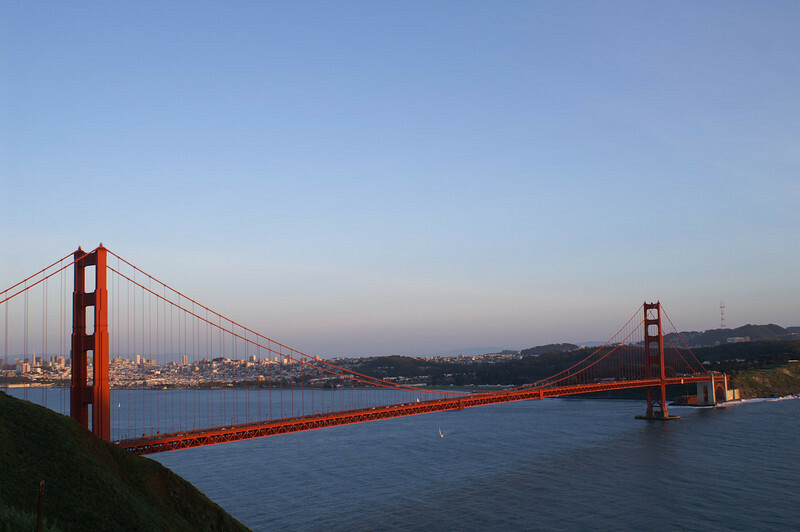 The Golden Gate Bridge glowing at sunset. 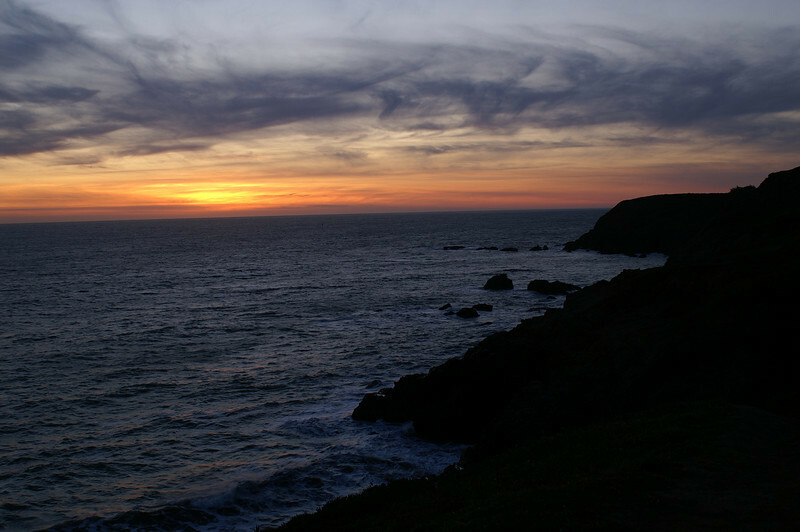 Enjoying the first of many beautiful sunsets over the Pacific. 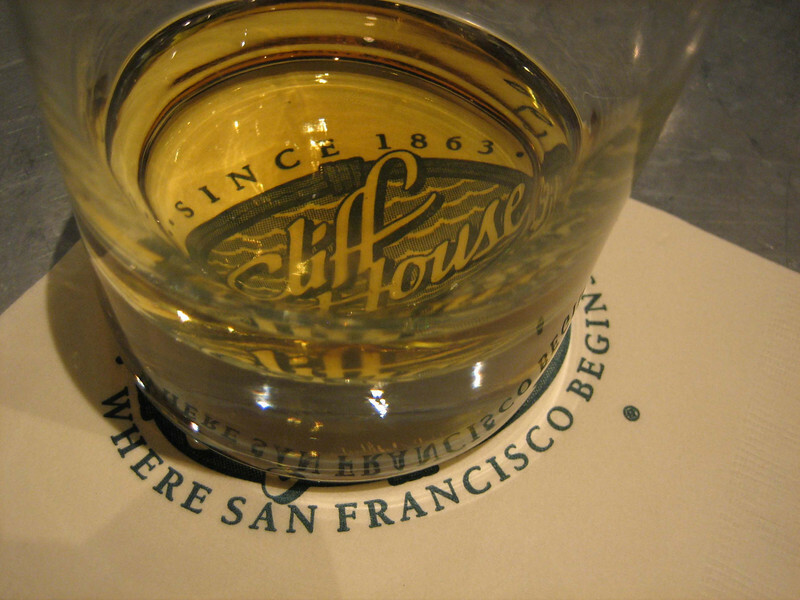 Rounding off the evening with a drink at Cliff House. Single malt scotch is my beverage of choice. 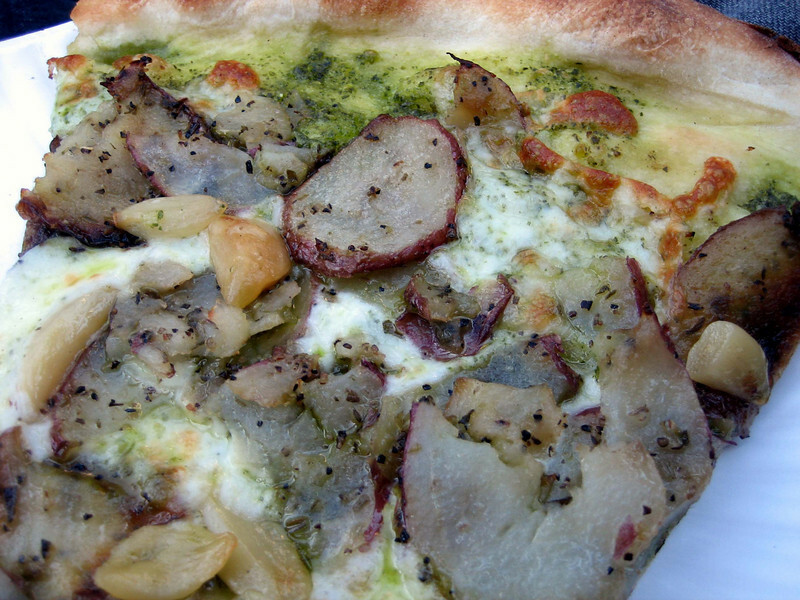 Pizza on Haight and Asbury: pesto with potato and garlic. Having some South Indian food at Udipi since I know it’s going to be tough to find this in Latin America. 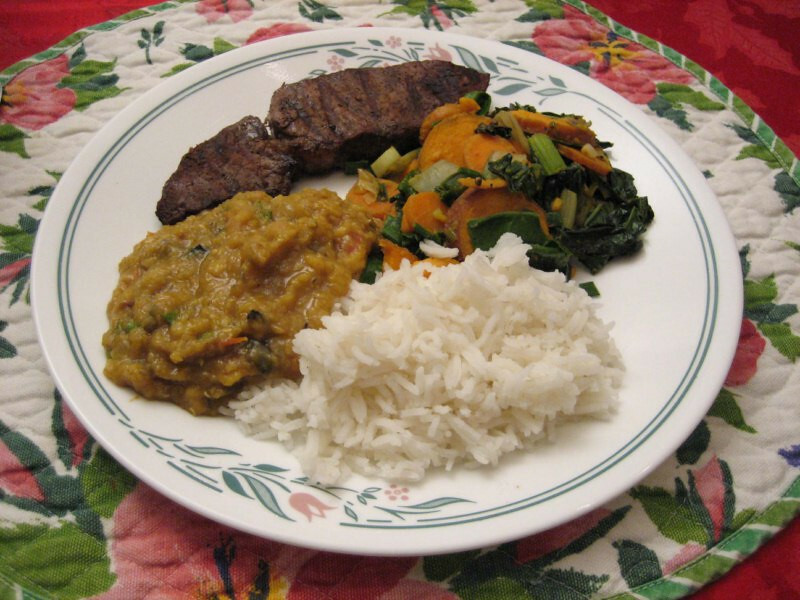 There’s probably Indian restaurants down there, but specially South Indian cuisine is definitely more rare. 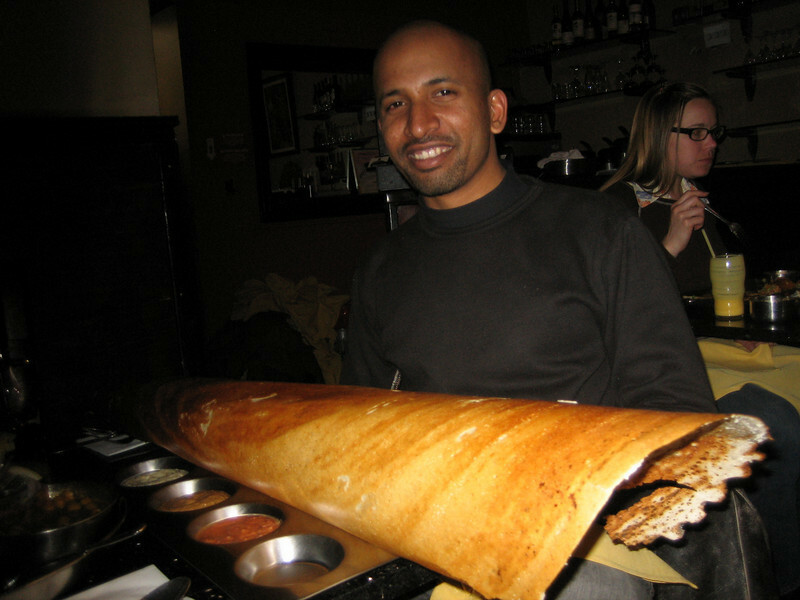 This is a dosa and it’s 2ft long and paper thin. It’s a rice flour crepe that you dip into lentil soups and various chutneys. It was heavenly. 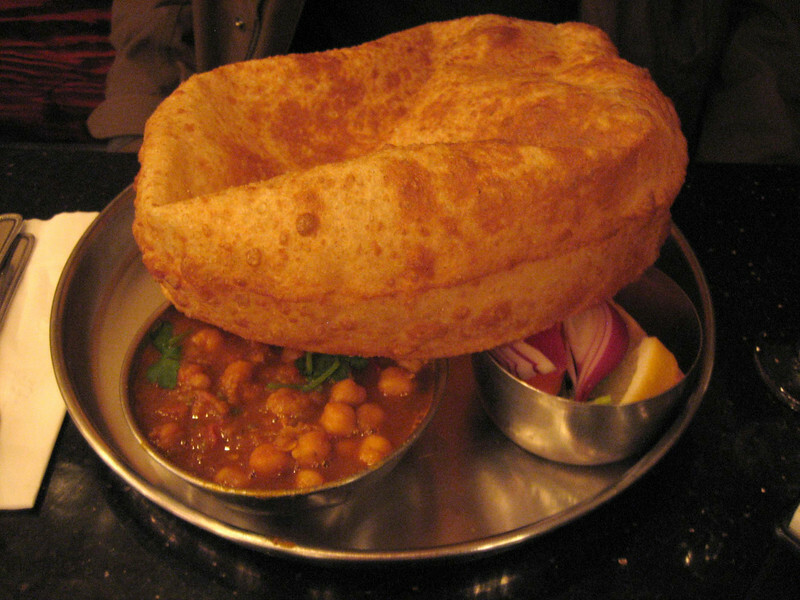 Shridhar had the Chole Batura, a huge fried puri (fluffy bread) that goes with garbanzo/chick pea curry. Shridhar with all his toys. 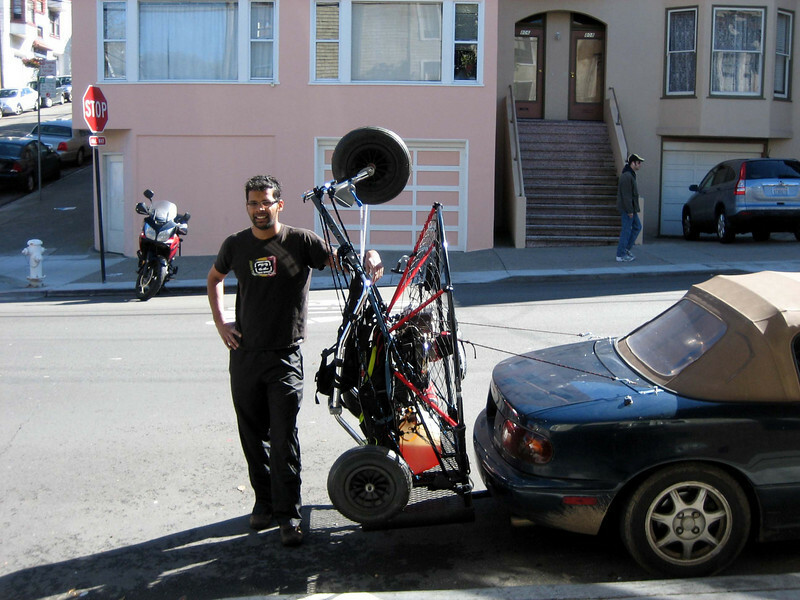 That’s a para motor strapped onto the Miata and his V-Strom in the back. He also has a DR, not pictured. 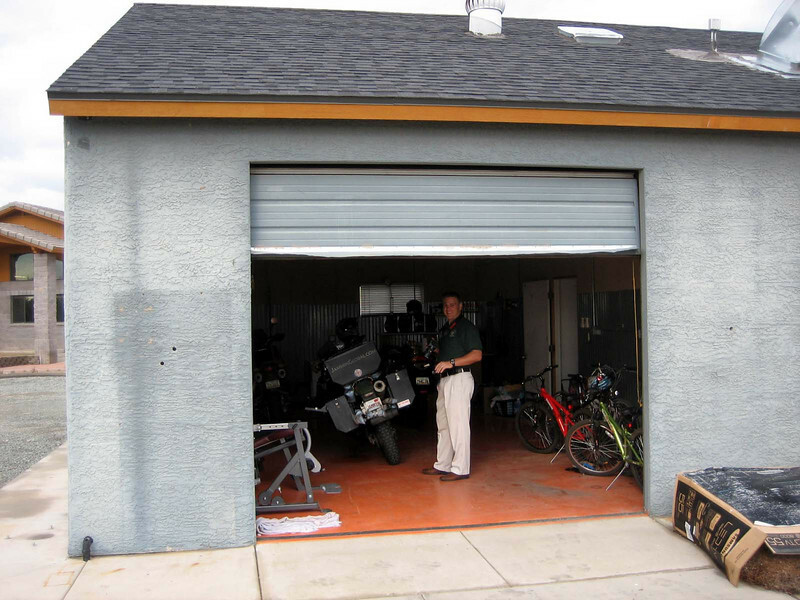 Spending a few days at Stewart’s place, a friend of Shirdhar who offered to help service the bike. 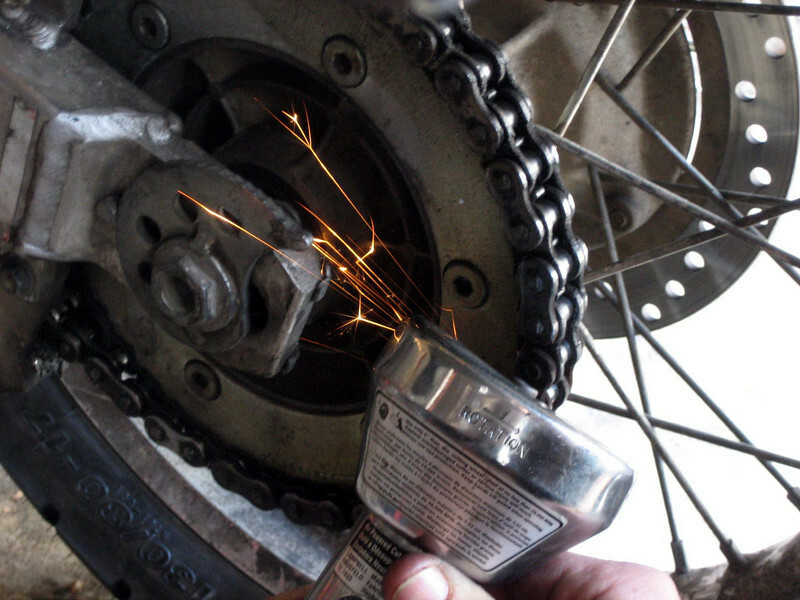 Mounting a new chain and the Motion Pro Chain Breaker and Riveting tool worked like a charm. 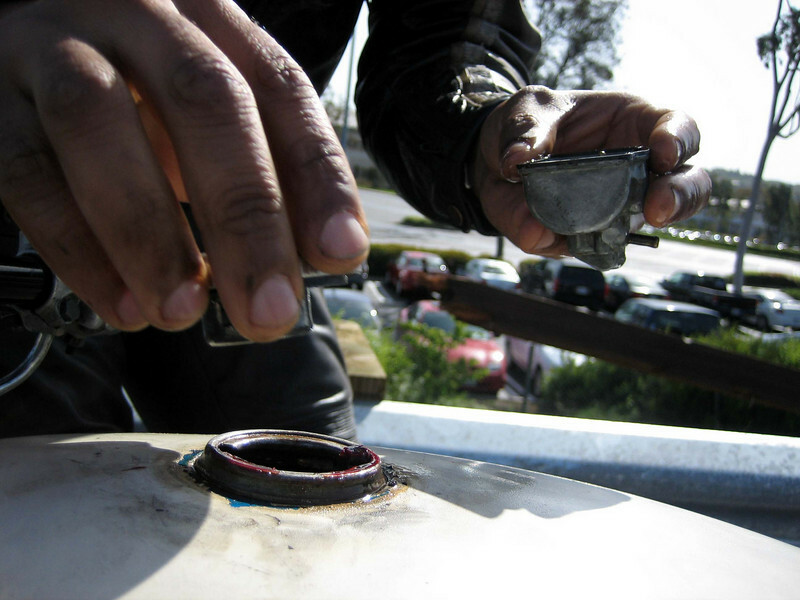 Using a grinder to file down the rivets here. Hopefully the new chain lasts me through Buenos Aires. 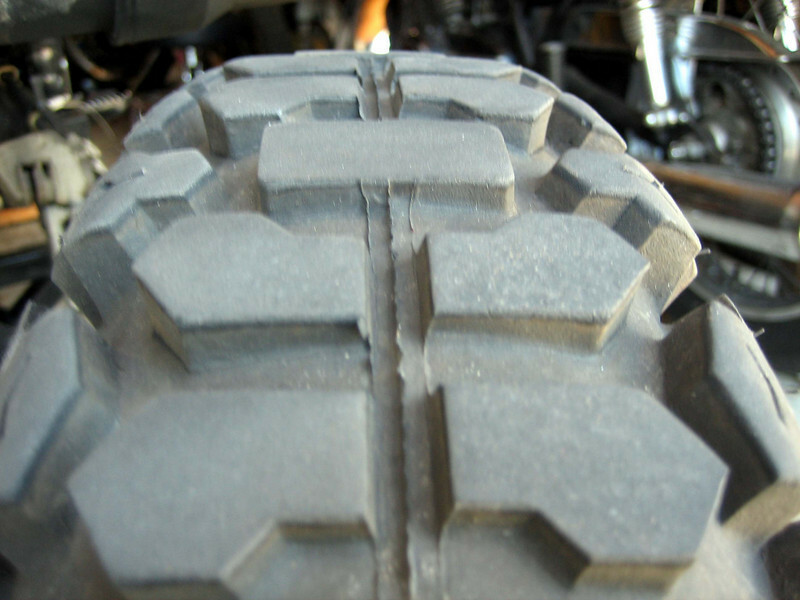 Putting on new tires, Kenda K761 with heavy duty inner tubes to reduce the chance of punctures. The old Kenda K270’s that came off the bike. This is after 9,000 miles and I think it could’ve gone another 2,000 but figured best to change it when things were not rushed and had access to a shop at my own pace. 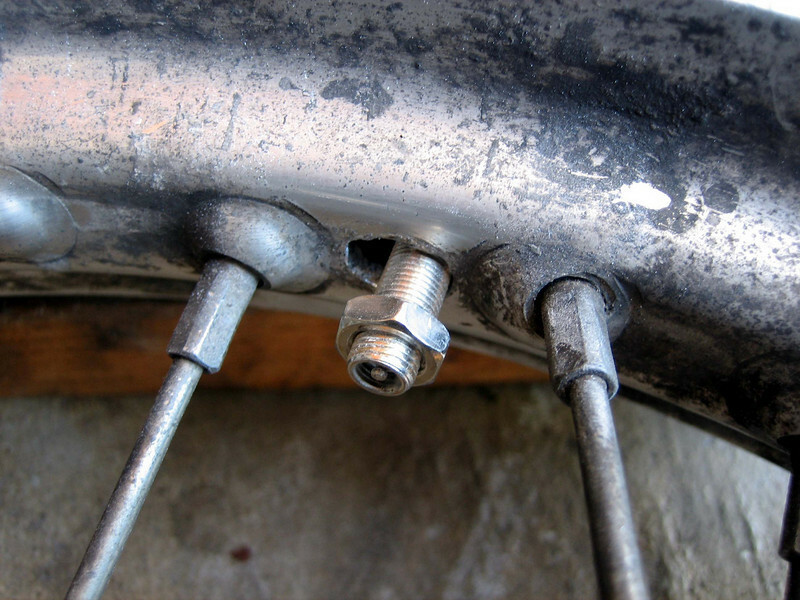 Elongating the valve stem hole, as advised by world traveler Adam (shortwayround.co.uk) to relieve stress on the valve stem to further tube life. Stewart was a big help and he said he was glad to help me get on my way as he’d like to make a big trip someday himself. 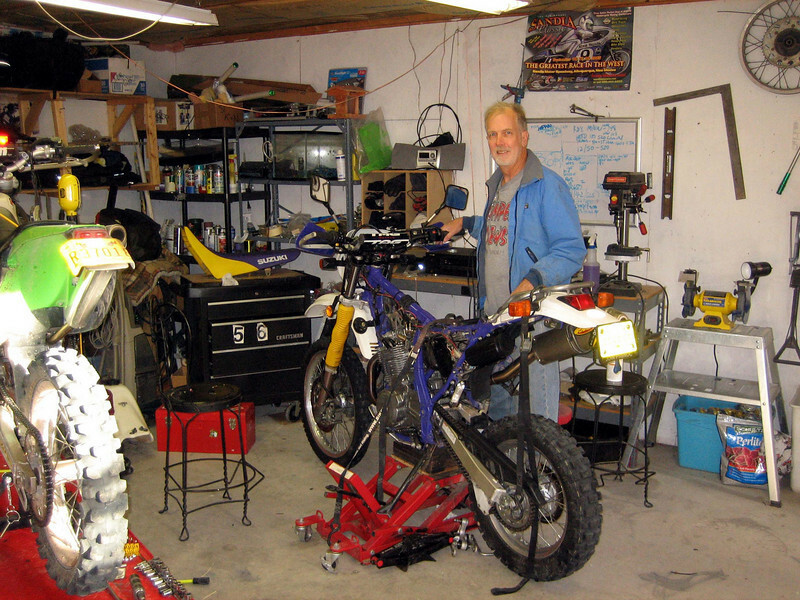 He has a bunch of bikes in his garage and loves tinkering on them. 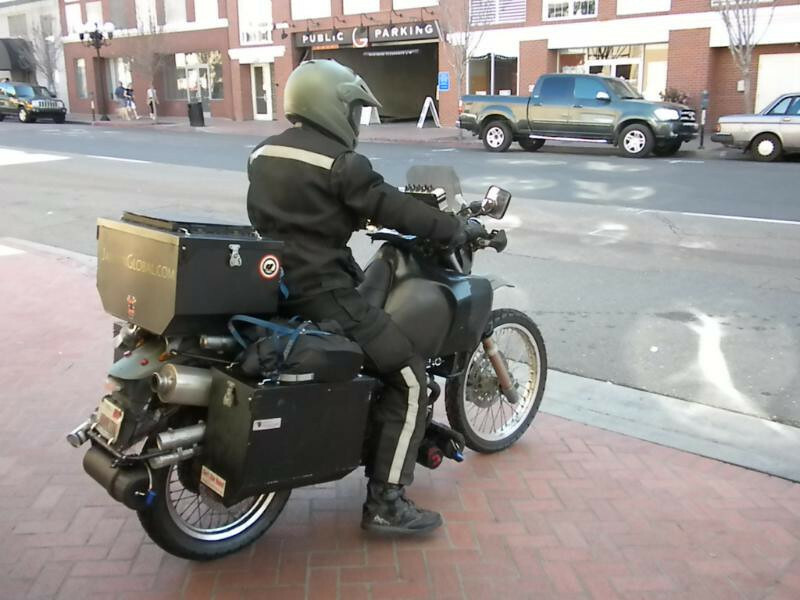 That’s a classic Moto Guzzi out there. 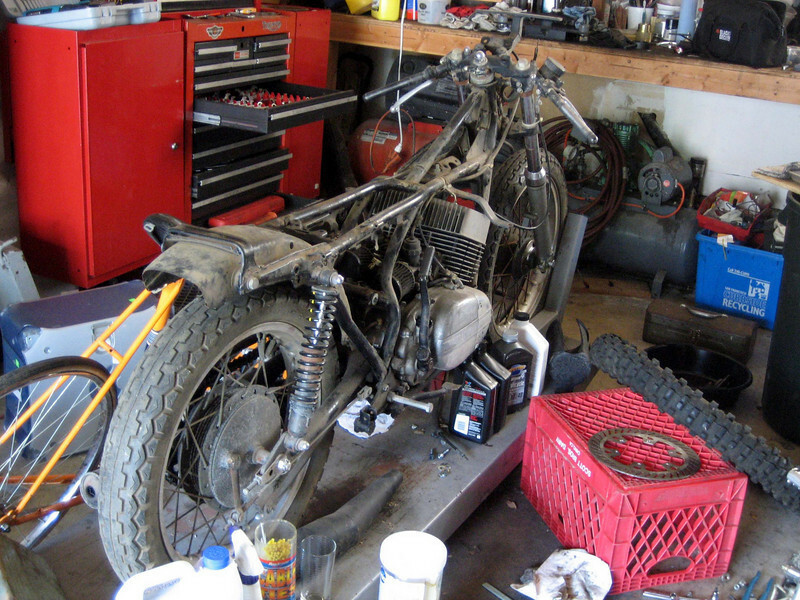 And I forget what kind of bike this is, but looks like a beautiful cafe racer in the making. Taking a test ride around the city. Lots of great architecture. 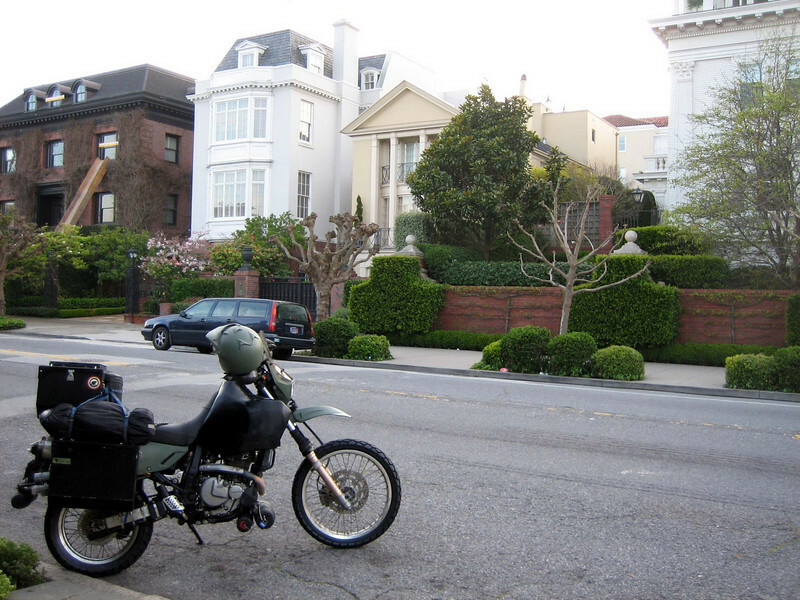 I’m all done in San Francisco and ready to hit the road again. I like this city and would definitely like to live here at some point in the future. 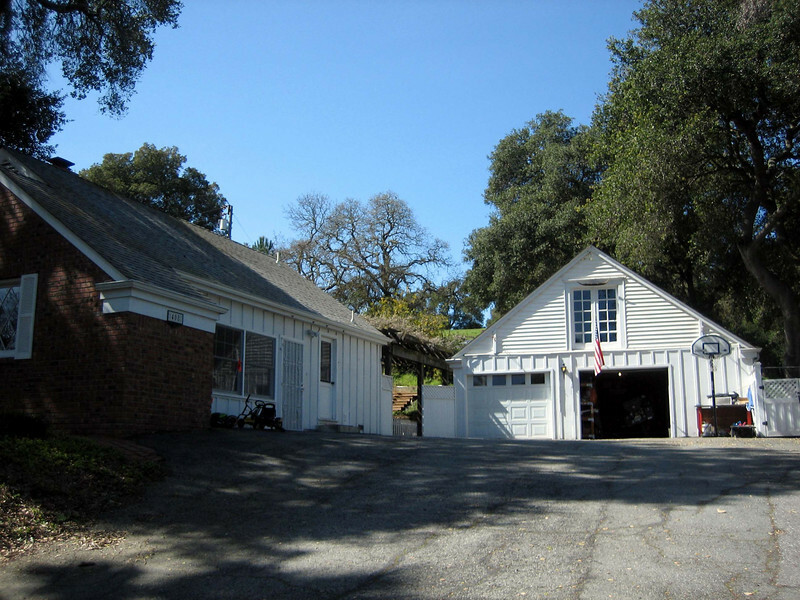 Heading south to Paso Robles and then onto San Diego. It’s been a crazy last few months getting ready to get going and closing up my life here. Taken a few more days than I expected but all ready to head out. 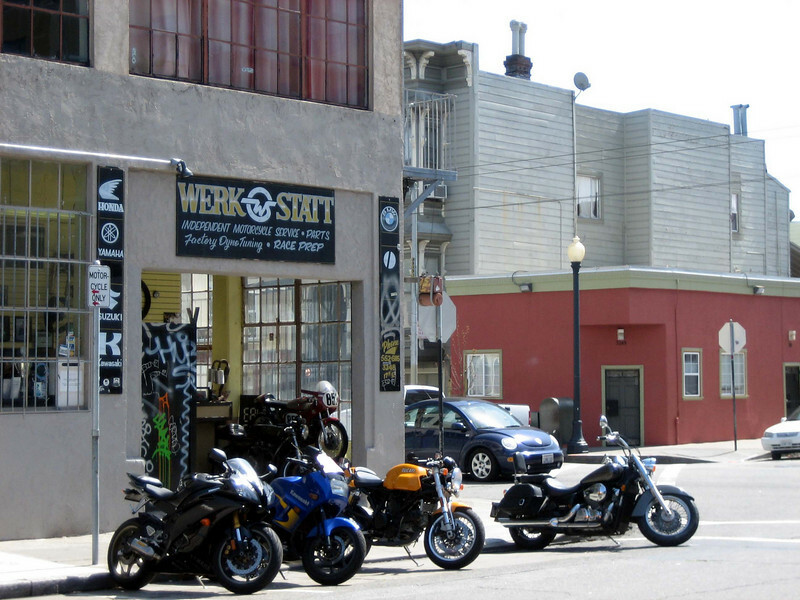 I’m going to San Francisco first to see a good riding friend and go over the bike once more before heading back down and crossing the border into Mexico. Going to mount new tires there, oil change and hopefully purge some of the things I’m carrying. I thought I had it all down, but the gravity of taking off for 2 years had me throwing in random tools and other things that I might need and now I’m overflowing, haha. Stopping in Memphis, Dallas, Las Cruces and Joshua Tree on my way to SF. It’s going to be chilly, but I have heated gear. Hopefully it doesn’t snow tomorrow.